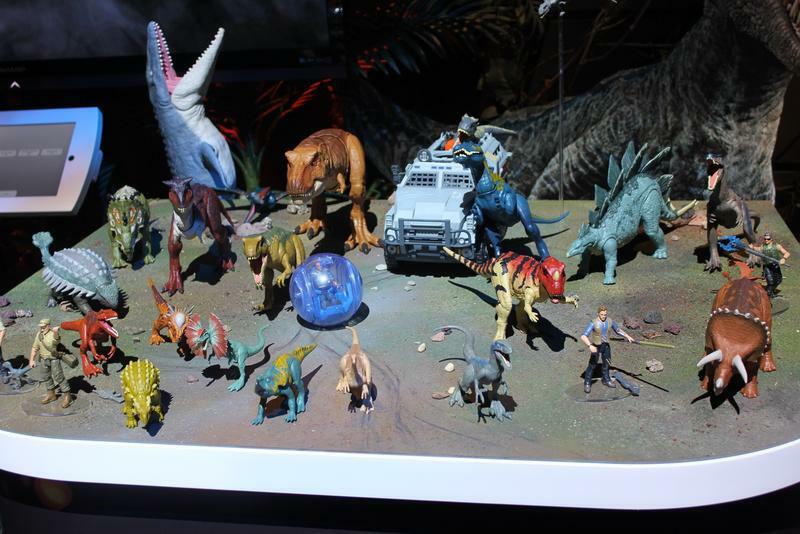 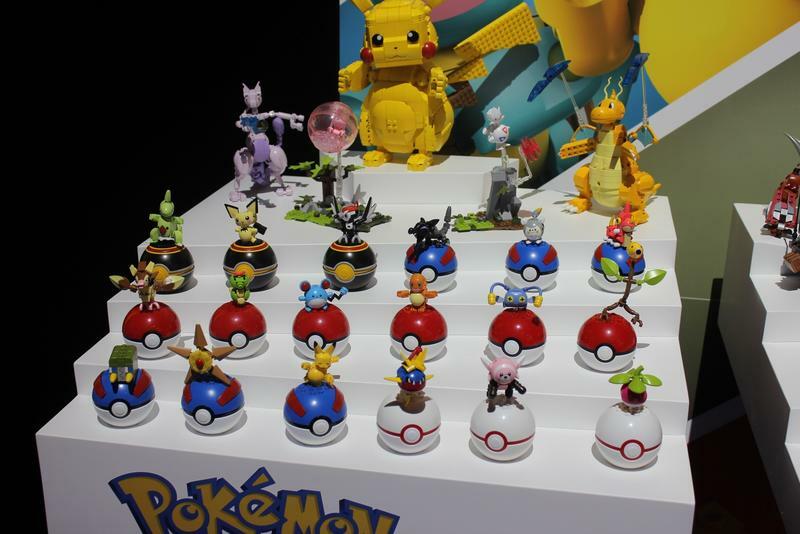 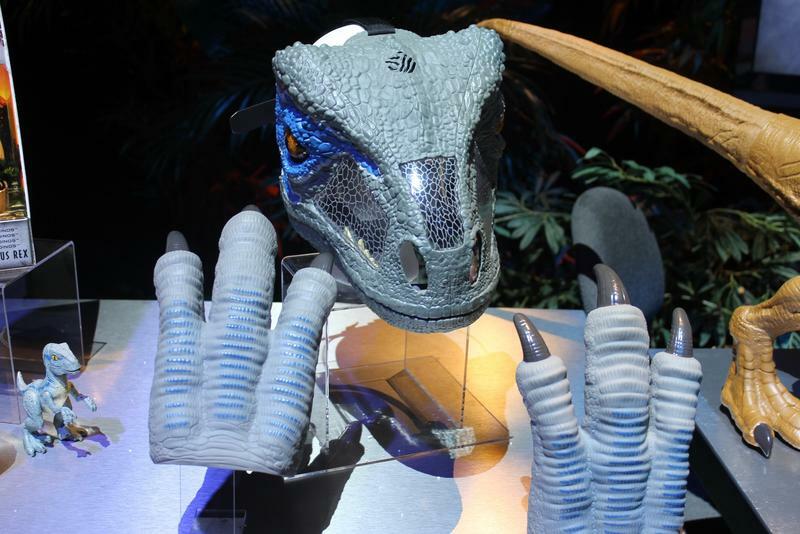 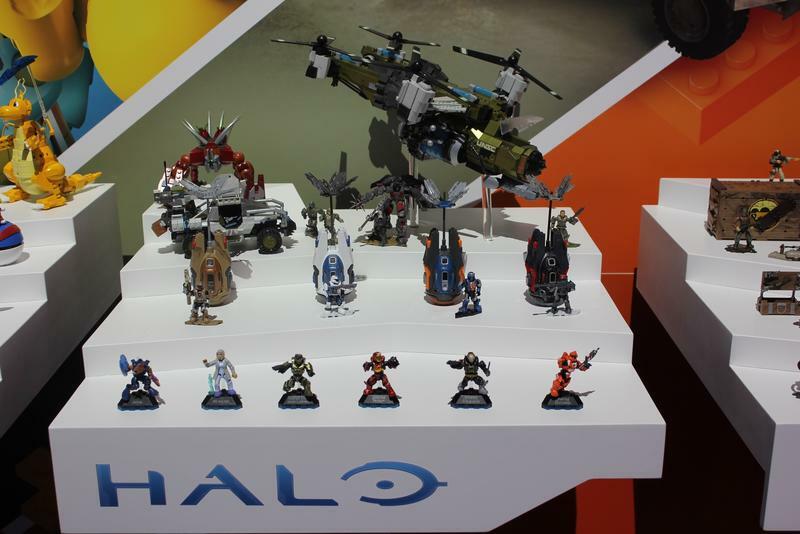 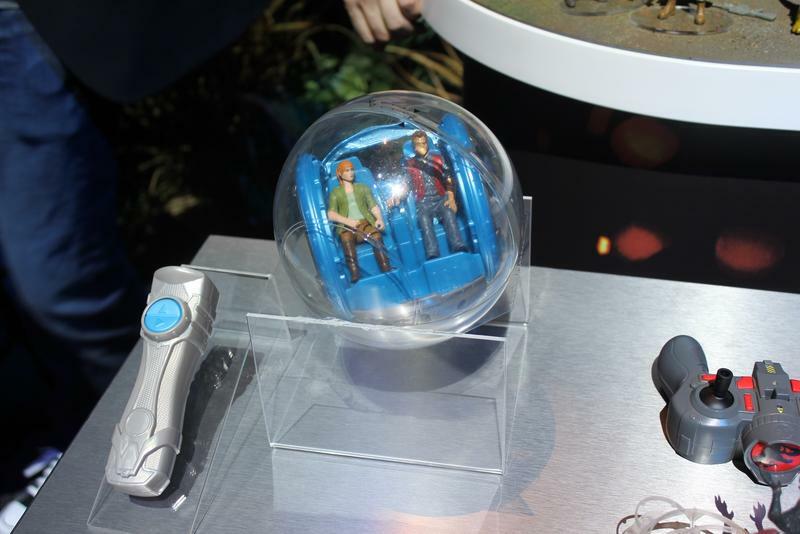 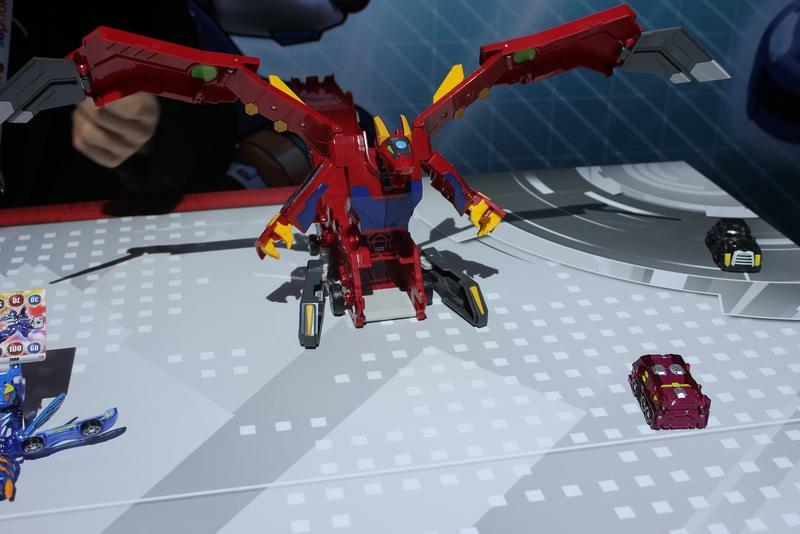 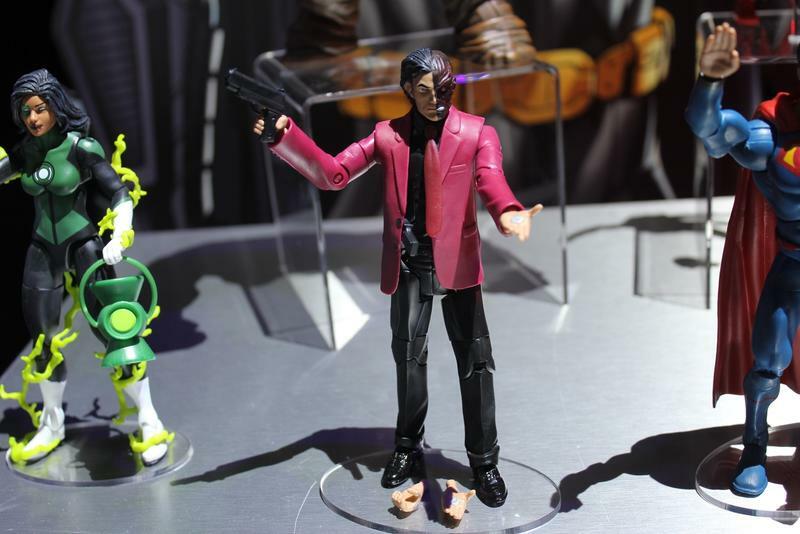 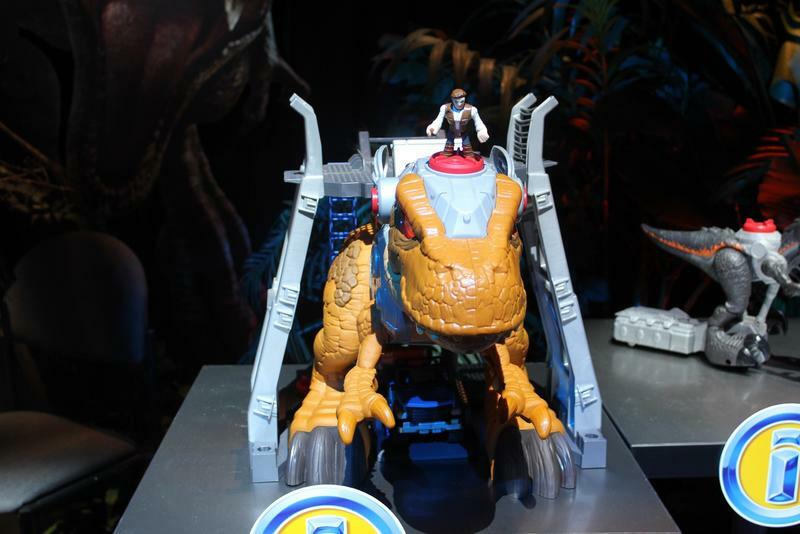 Mattel roared into Toy Fair 2018 like a dinosaur, which was fitting as the iconic toymaker has just about everything you can dream of planned for the Jurassic World franchise this year. 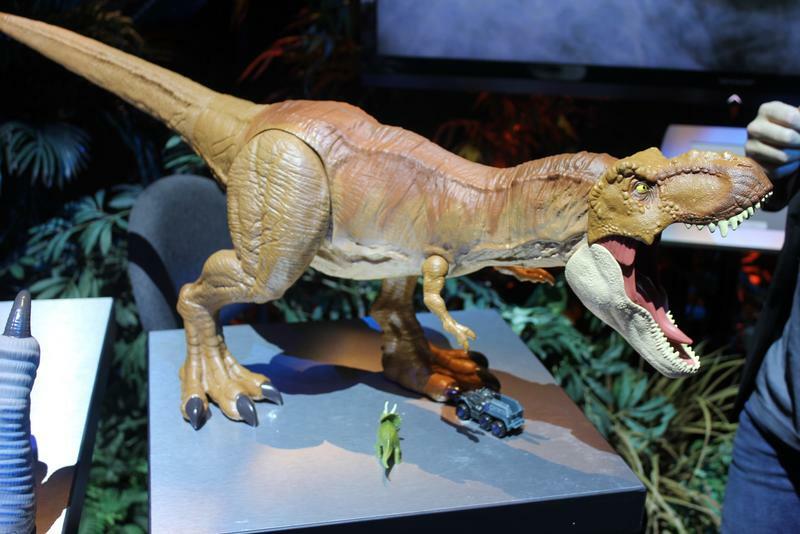 It’s impossible to go over everything they showed off, and we’ll let Mattel’s info speak for itself, but the Jurassic World Super Colossal Tyrannosaurus Rex and Imaginext Jurassic World Walking Villain Dinosaur were definite standouts. 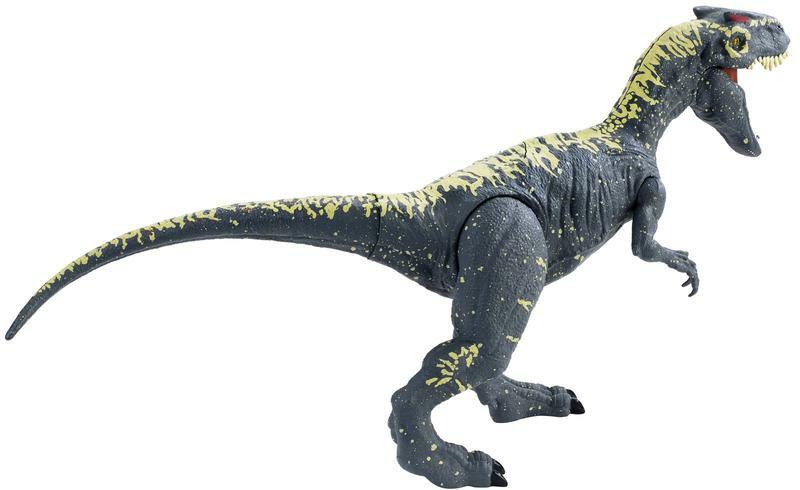 • The Jurassic World figure assortment features aspirational characters inspired by the movie and sculpted in 3 ¾” action scale. 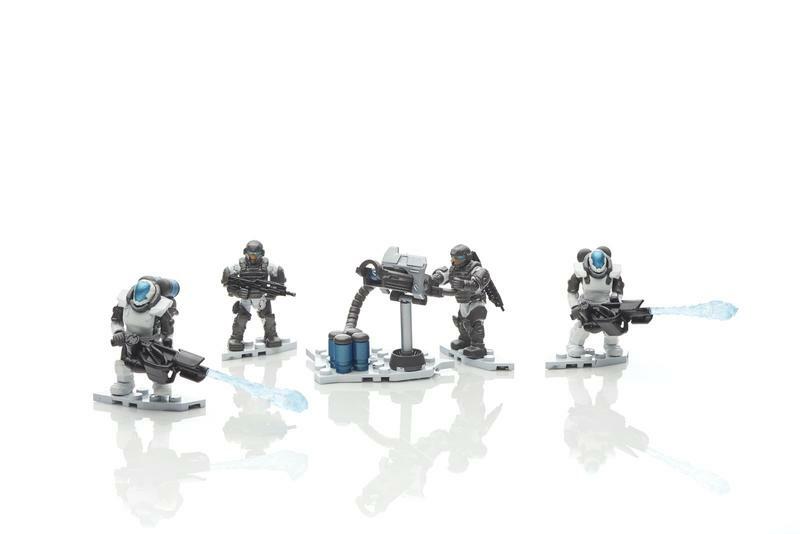 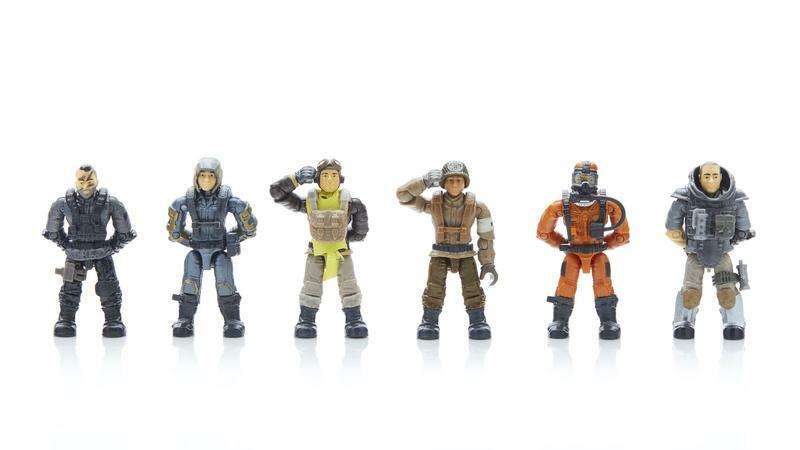 • Collect figures of your favorite characters like Owen and Claire to play out the action from the new film. 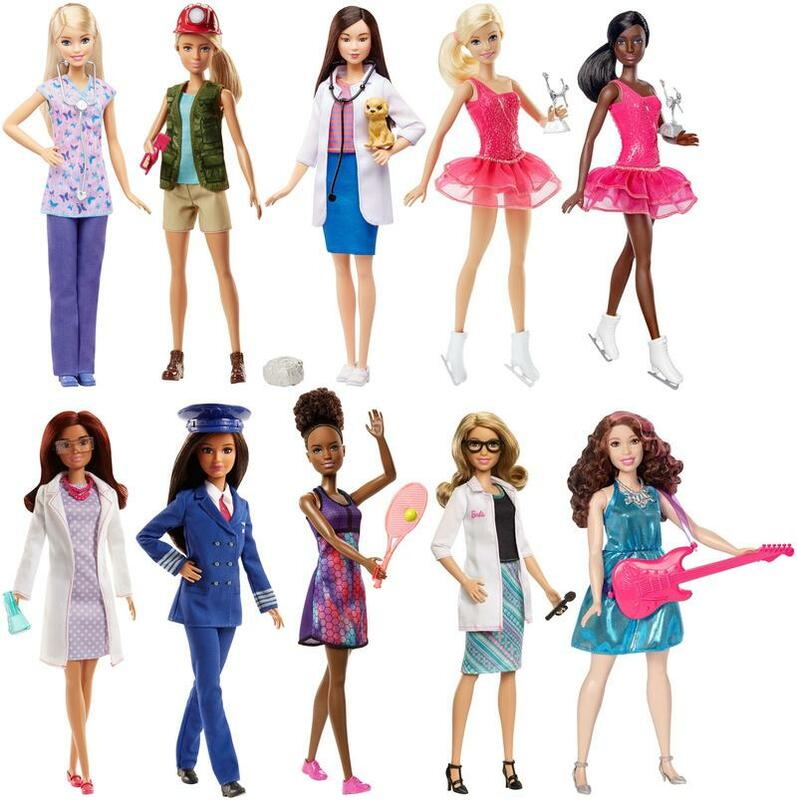 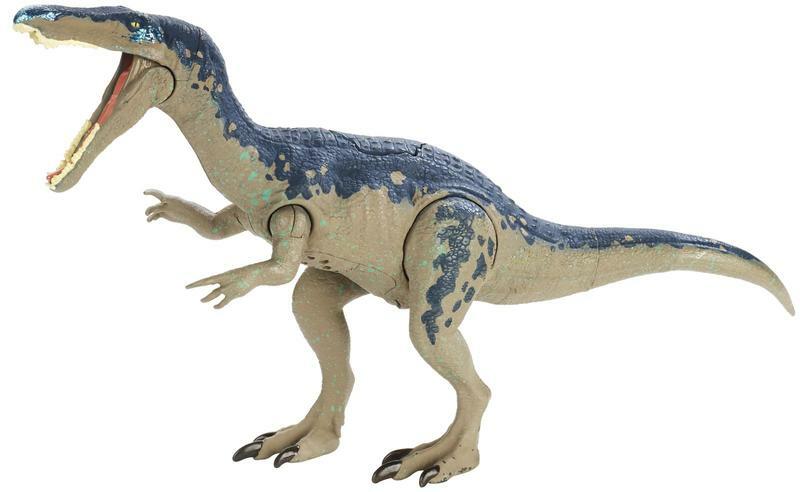 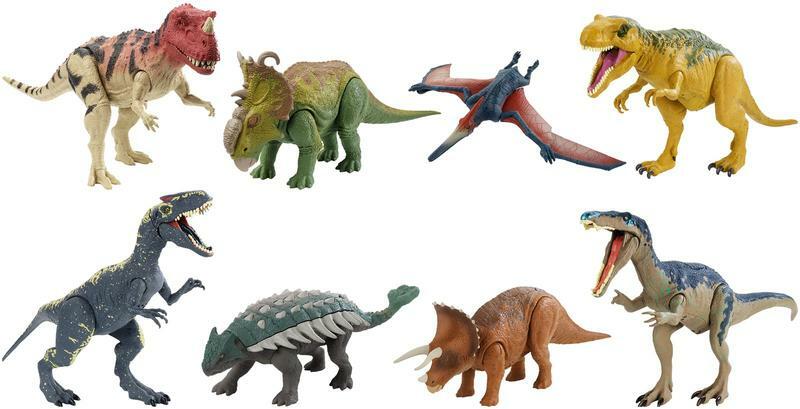 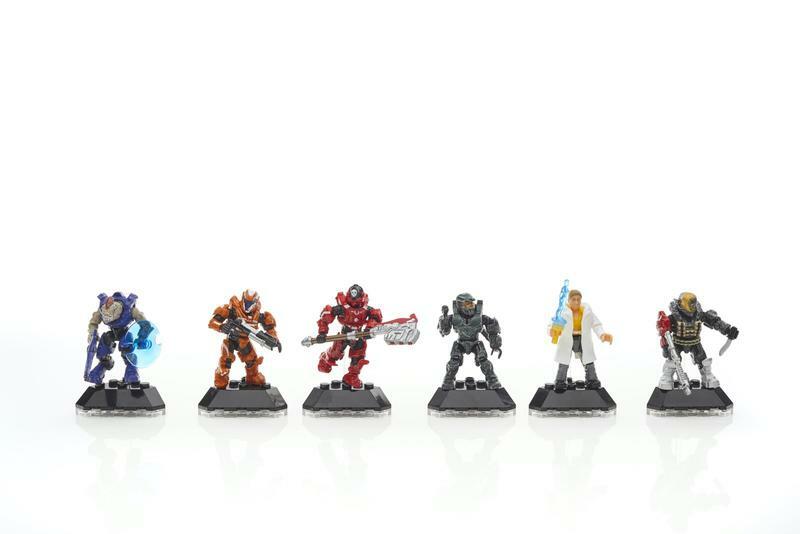 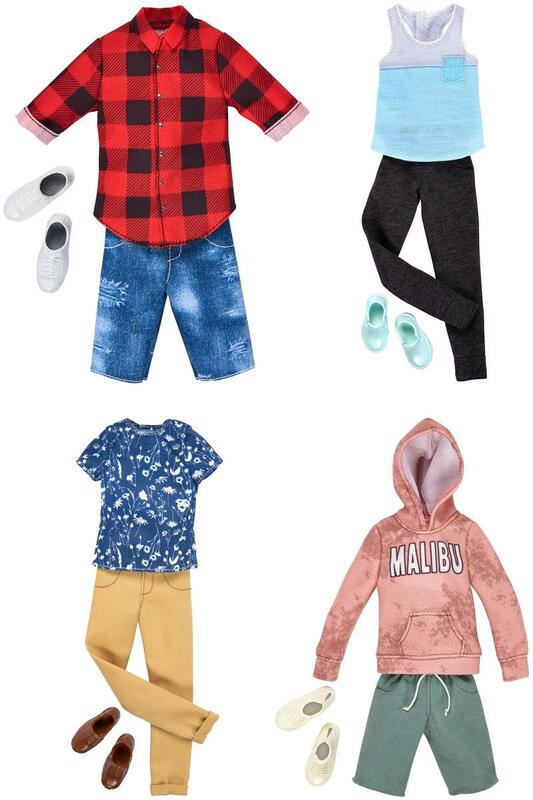 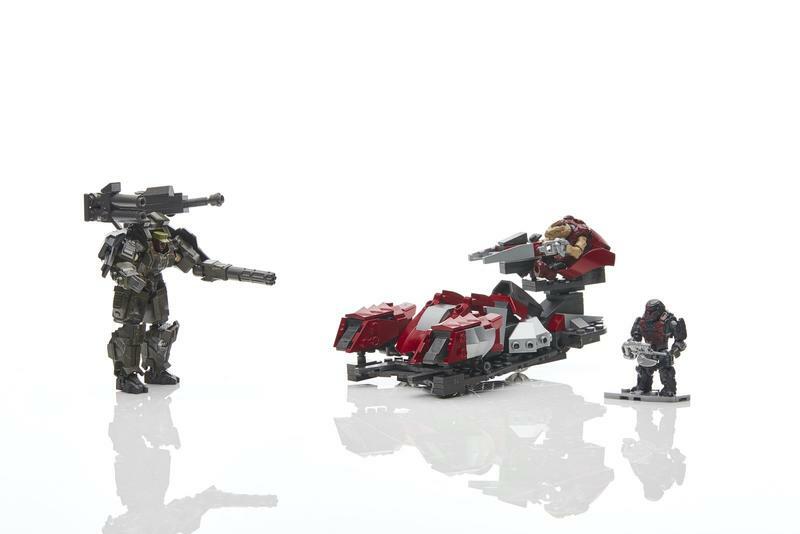 • In this scale, these action figures are perfect for kids to play alongside the dinosaur figures in a way that is authentic to the action from the movie. 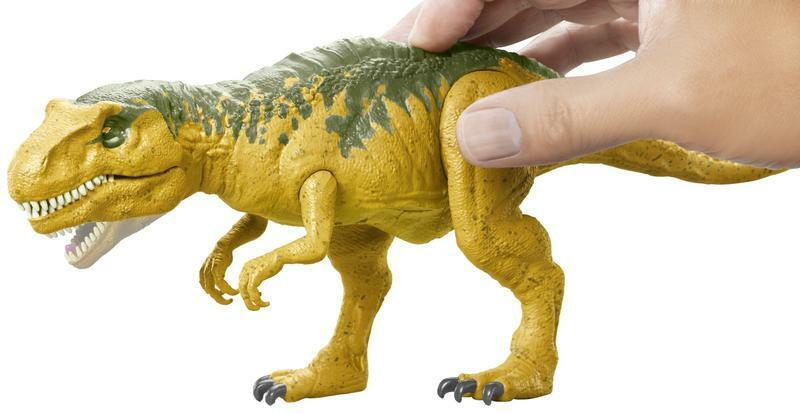 • This assortment of dinosaur action figures is inspired by the movie and feature push button sound activation and a signature attack move iconic to its respective species. 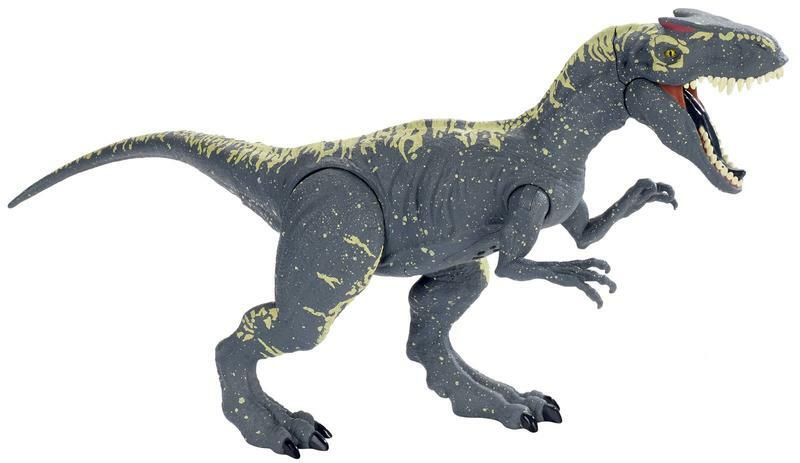 • The Jurassic World Roarivores™ assortment includes the Triceratops, Baryonyx, Metriacanthosaurus, Allosaurus, and more. 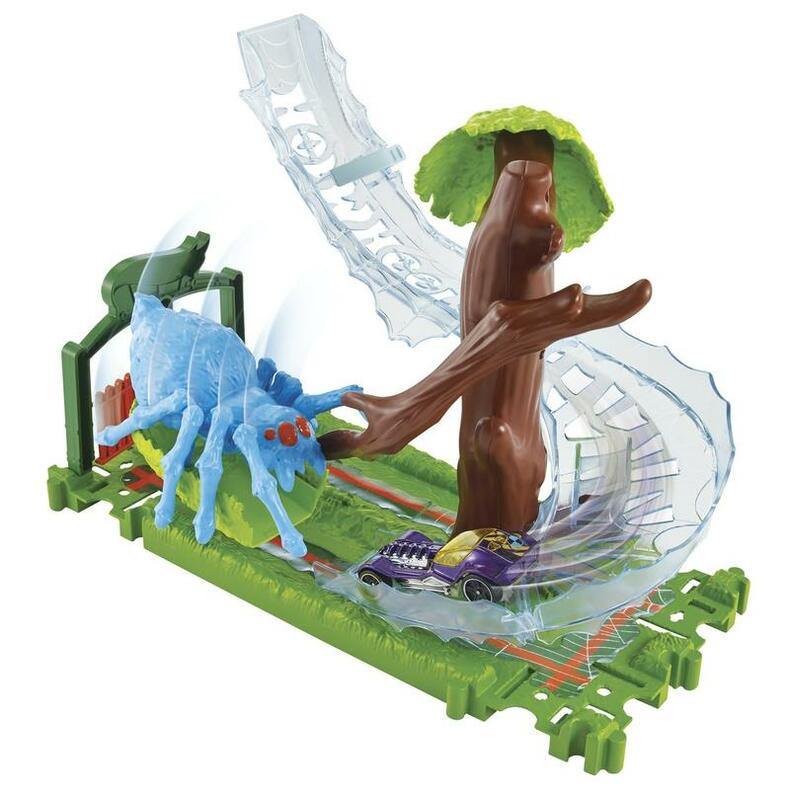 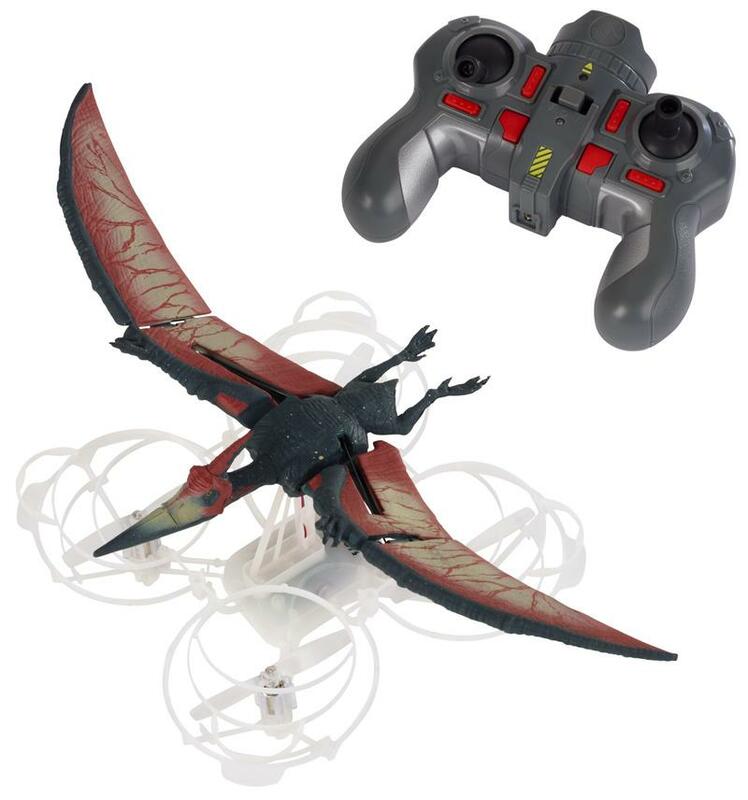 • This Jurassic World Rip-Run Dinos™ assortment is inspired by the movie and features figures that launch by inserting the ripcord into each and letting it rip for fast action. 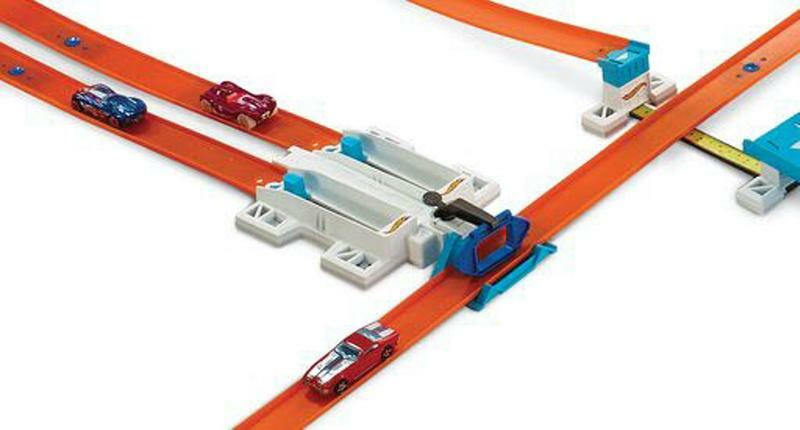 • Kids will love to race the Blue and Owen rip-run figures. 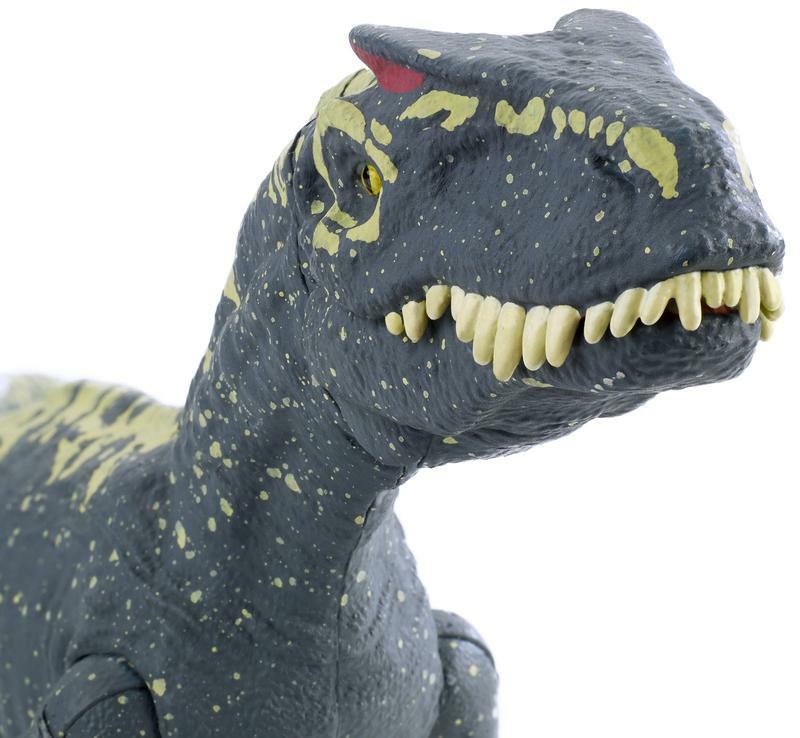 • This Jurassic World Action Attack assortment features dinosaur action figures inspired by the movie with realistic sculpting, authentic decoration and a dramatic battle strike feature. 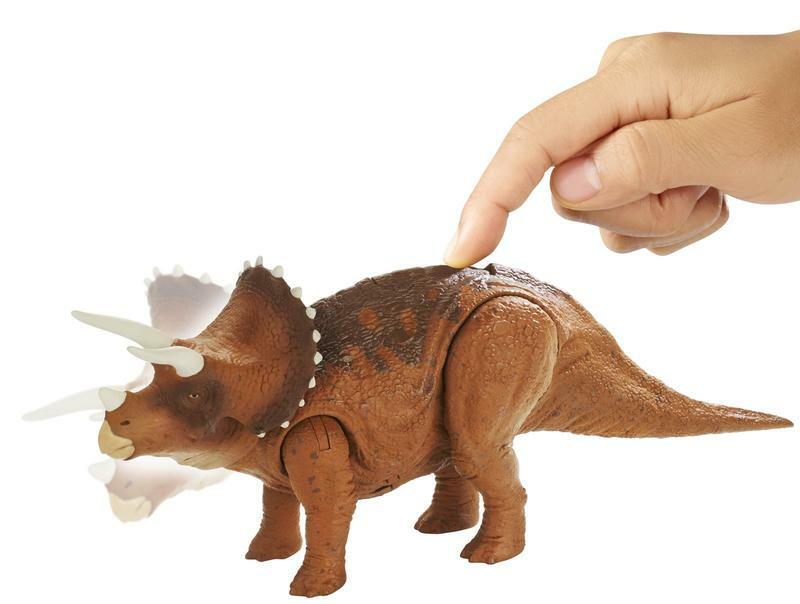 • This assortment includes dinosaurs like the Stegosaurus, Carnotaurus and Suchomimus (Available Fall 2018). 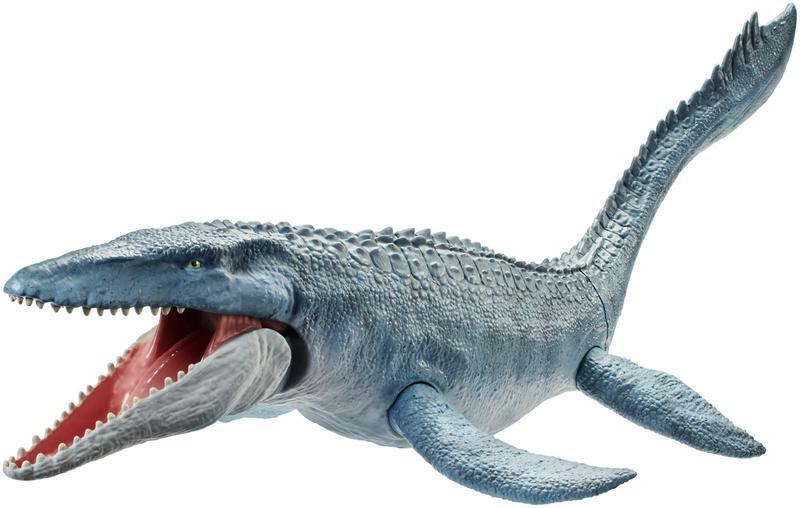 • The Mosasaurus is a huge swimming creature that blew fans away in the first movie and will soon make a return in Jurassic World: Fallen Kingdom this summer. 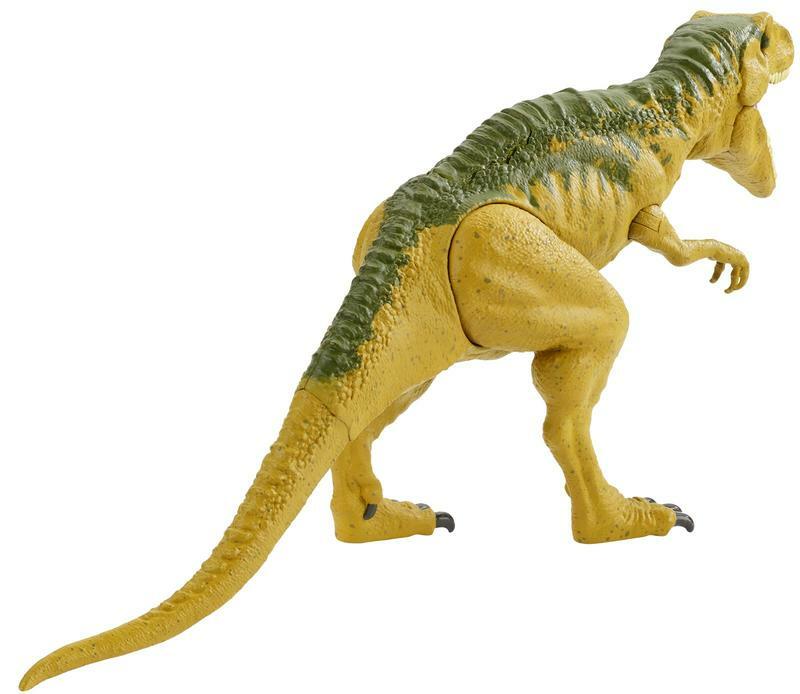 • This action figure comes in a massive size and includes a realistic sculpt with features authentic to the dinosaur. 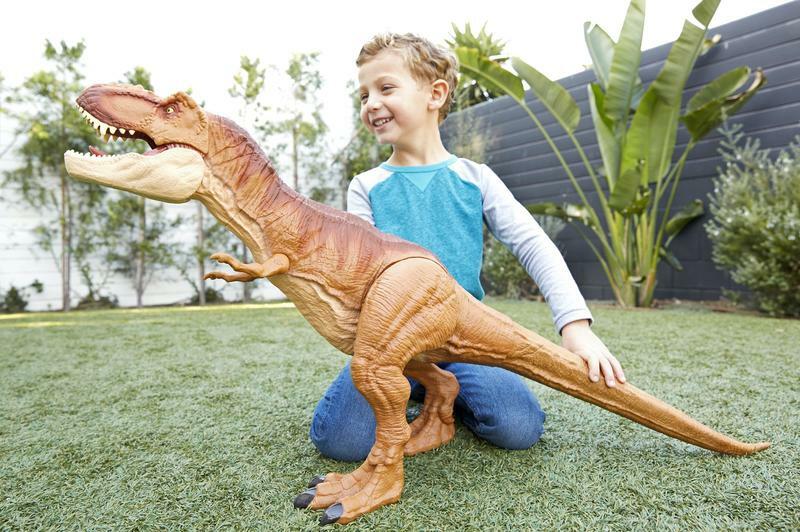 • The Thrash ‘N Throw Tyrannosaurus Rex™ is inspired by the movie and has all the action features iconic to this fan-favorite species. 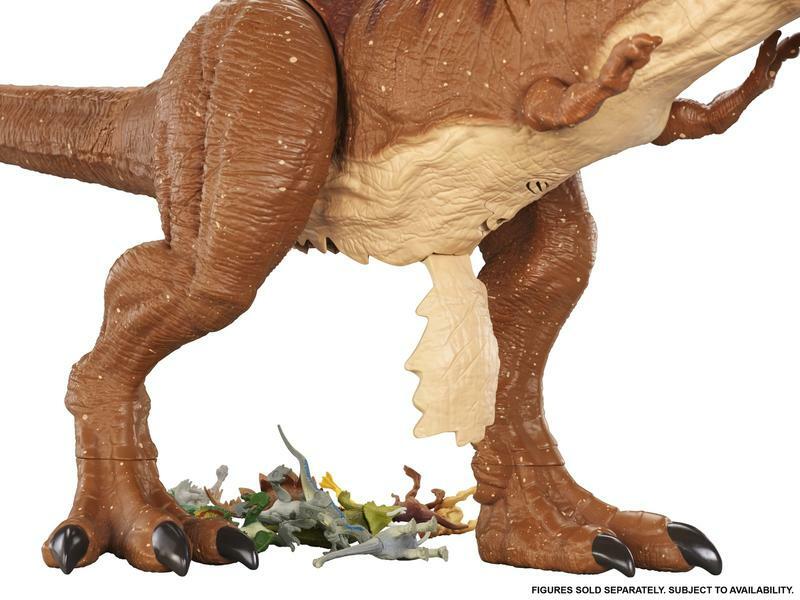 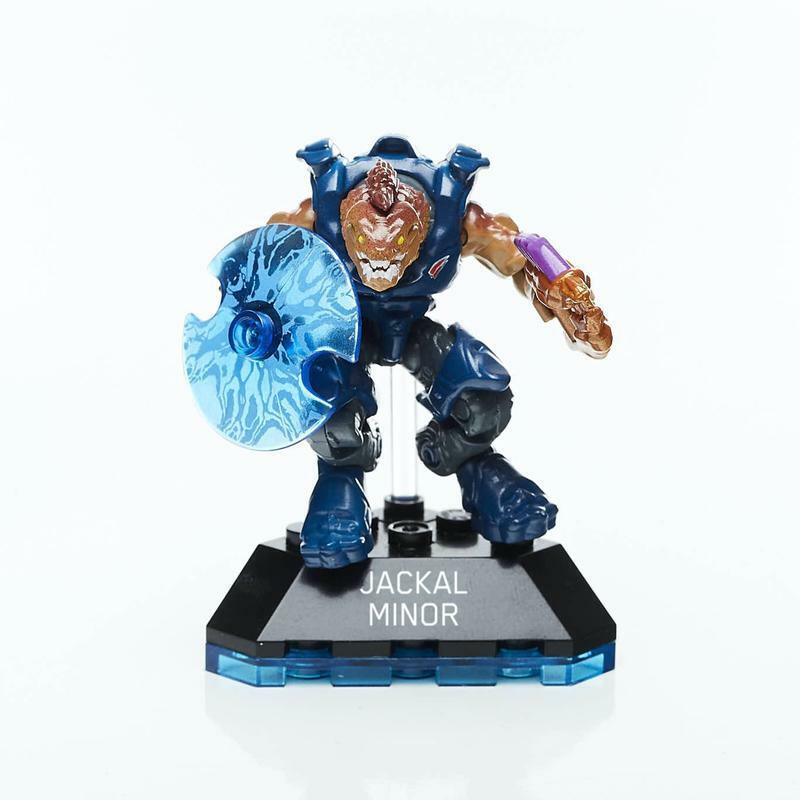 • This figure includes stomp and roar sound effects, as well as an innovative tail-activated thrash & throw feature. 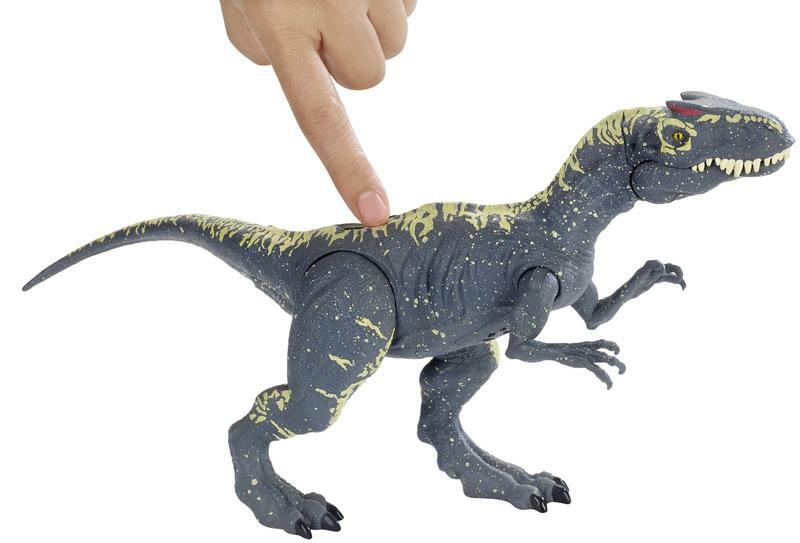 • Kids will love acting out their favorite movie scenes and creating their own action with this awesome Thrash ‘N Throw Tyrannosaurus Rex™. 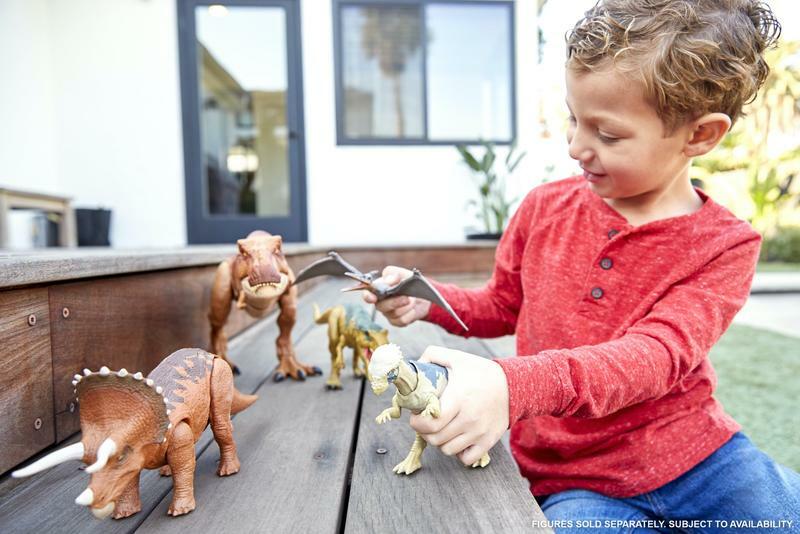 • This assortment of mini dinosaur figures features realistic sculpting, authentic decoration and one to two points of articulation iconic to its respective species. 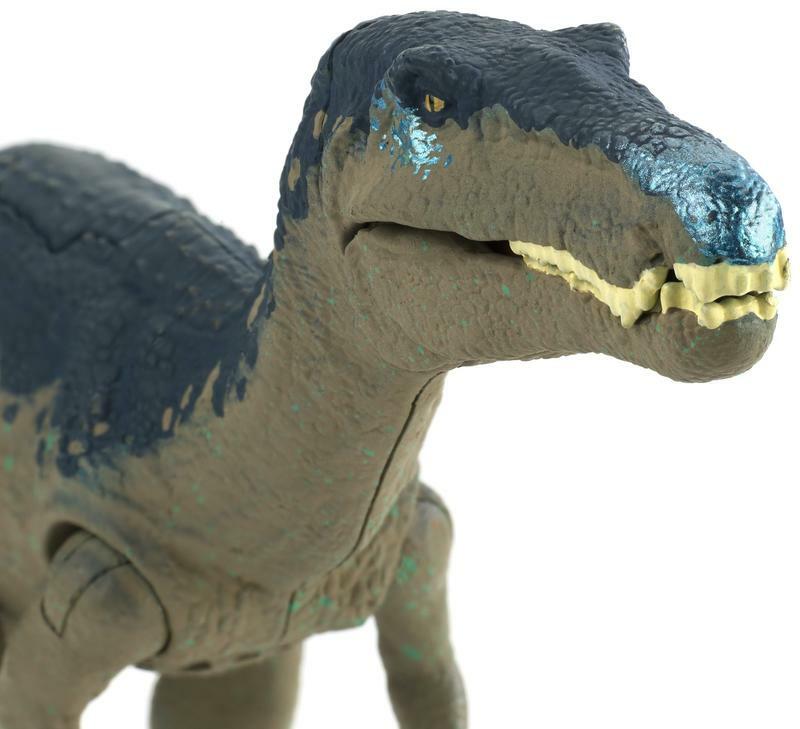 • The line includes 28 dinosaurs for kids to collect like the T.rex, Blue, Stegosaurus, Pteranodon, Carnotaurus, Baryonyx, Apatosaurus and more. 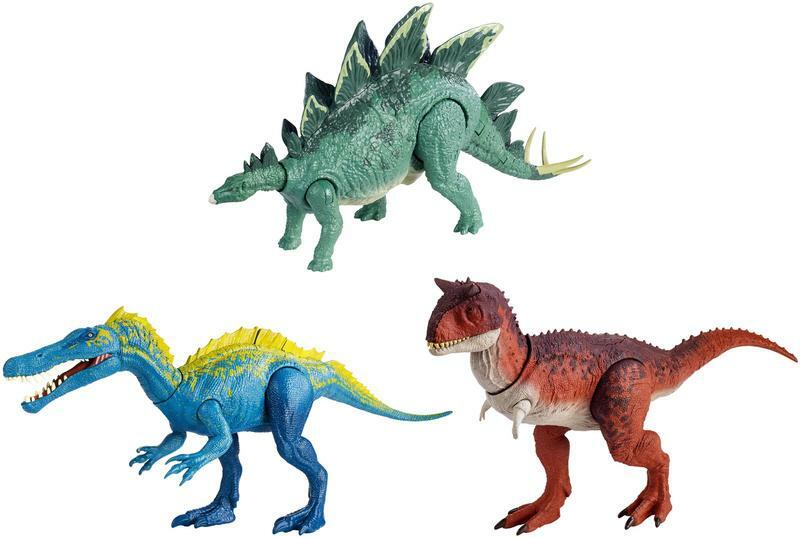 • This 3-pack assortment features two-mini dinosaur figures plus one-exclusive mini dinosaur figure. 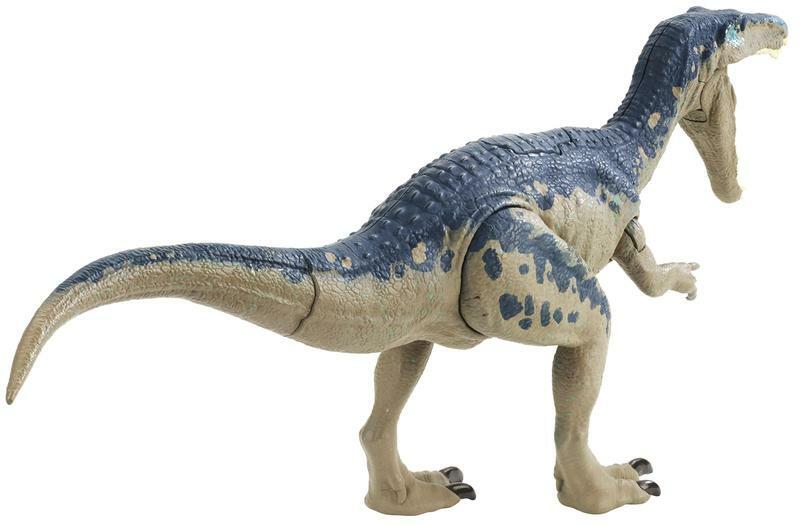 o Available: Jurassic World Mini Dino 3-Pack Pack (Apatosaurus, Dilophosaurus, Metallic Villain Dino); Jurassic World Mini Dino 3-Pack Assortment Pack (Baryonyx, Ankylosaurus, Velociraptor “Blue”) • Each collectible mini dinosaur has realistic sculpting, authentic decoration and one to two points of articulation iconic to its respective species. 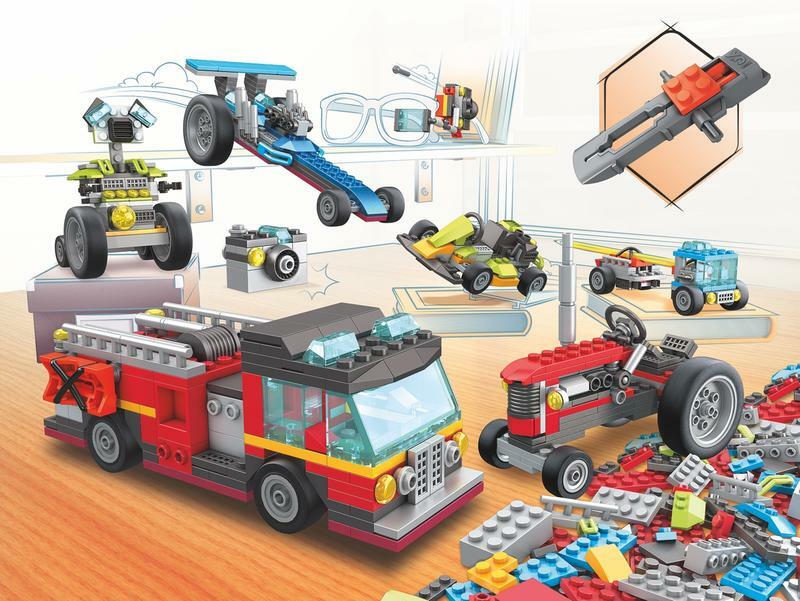 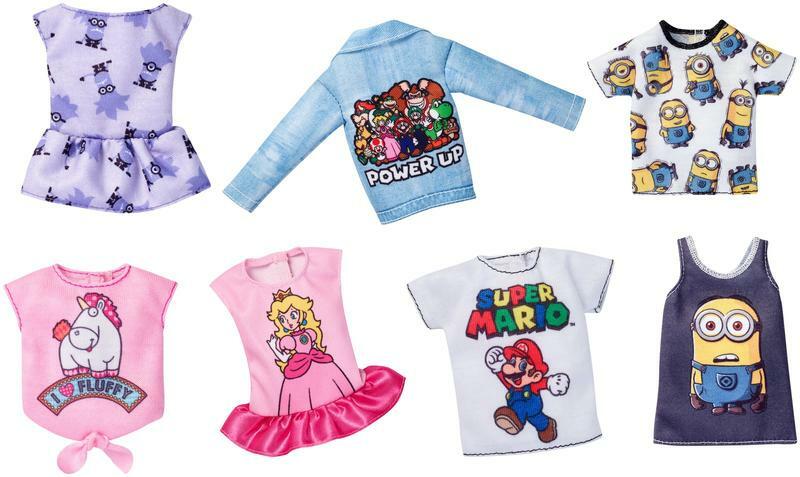 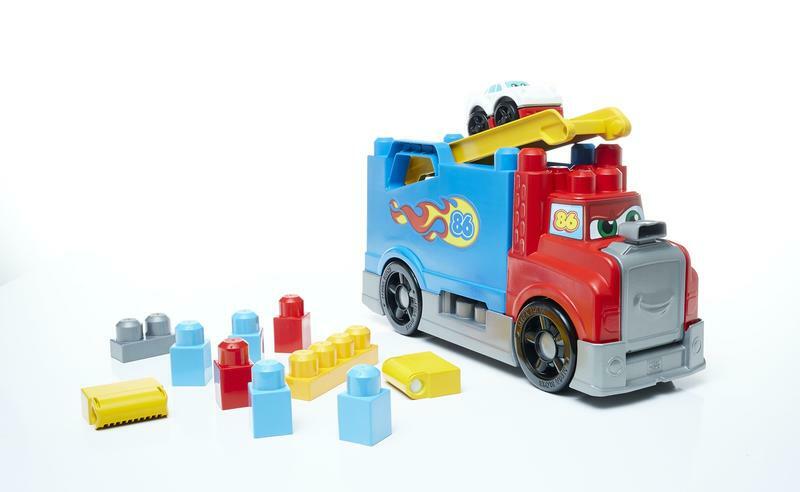 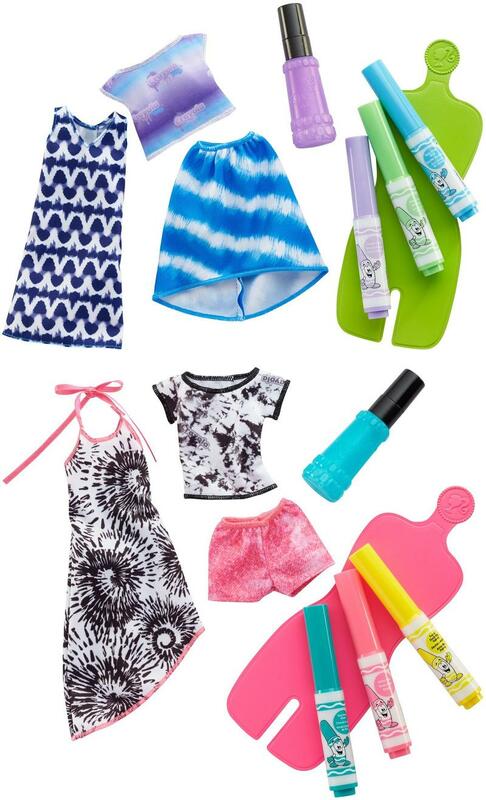 • This story pack assortment features a variety of key characters and accessories featured in the movie so kids can recreate chase and capture action scenes or make up their own adventures. 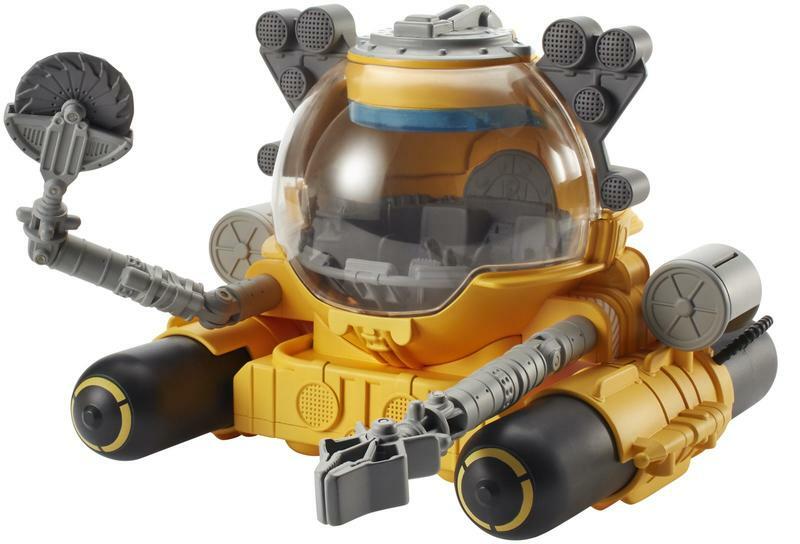 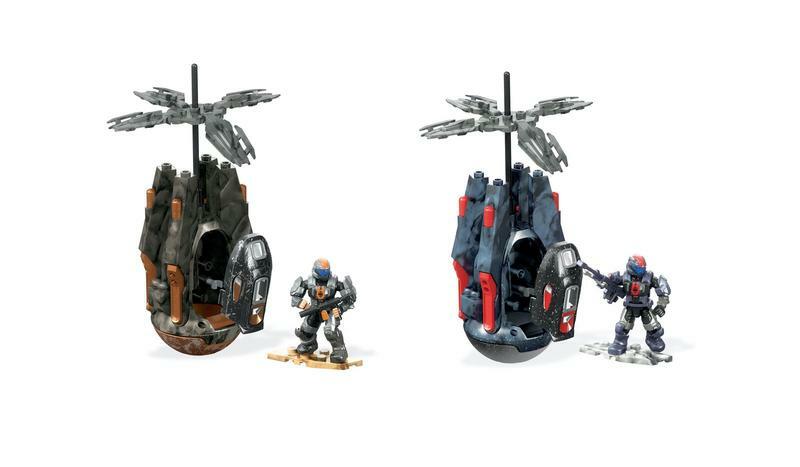 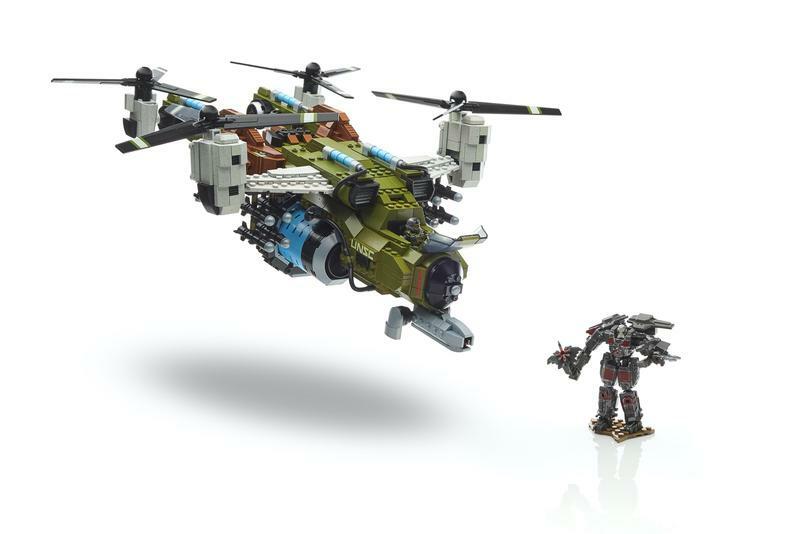 • This Gyrosphere Blast Vehicle is inspired by the vehicles in the movie and is the perfect scale to play alongside the Jurassic World action figures and dinosaurs. 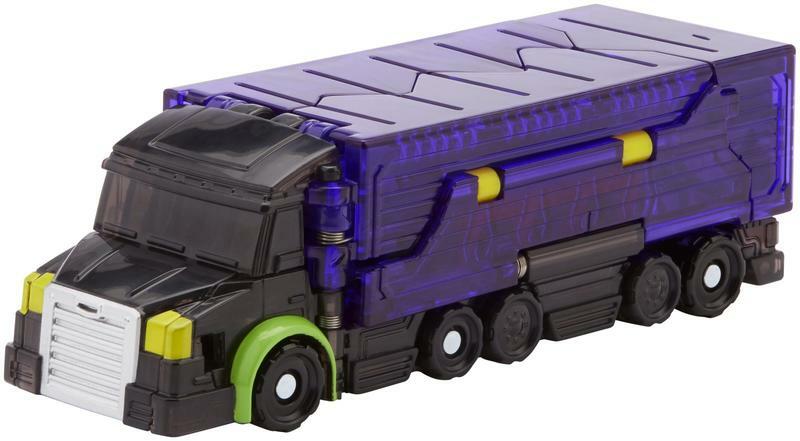 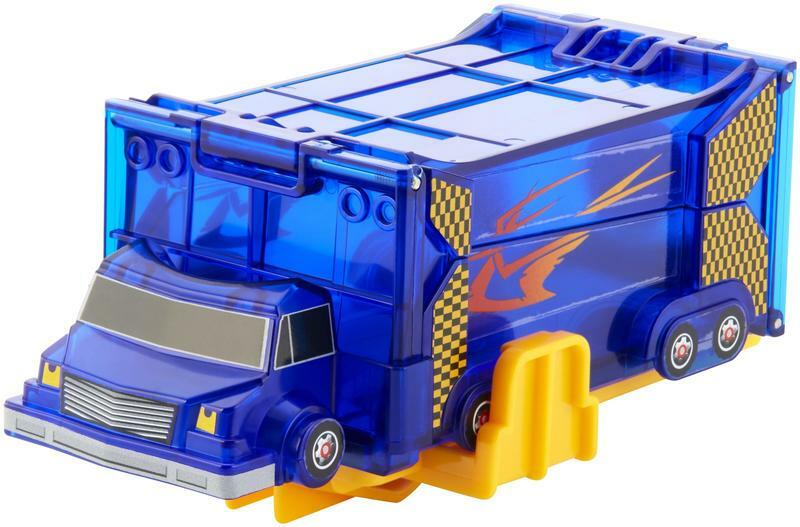 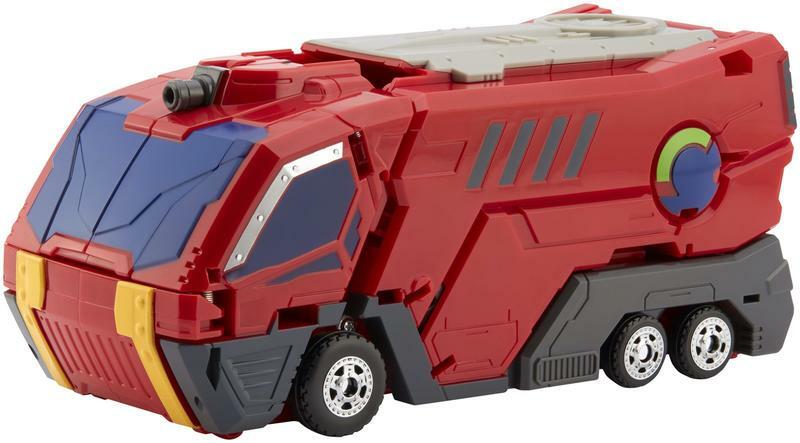 • Action figures and raptors can fit inside this vehicle that also launches for extra action. 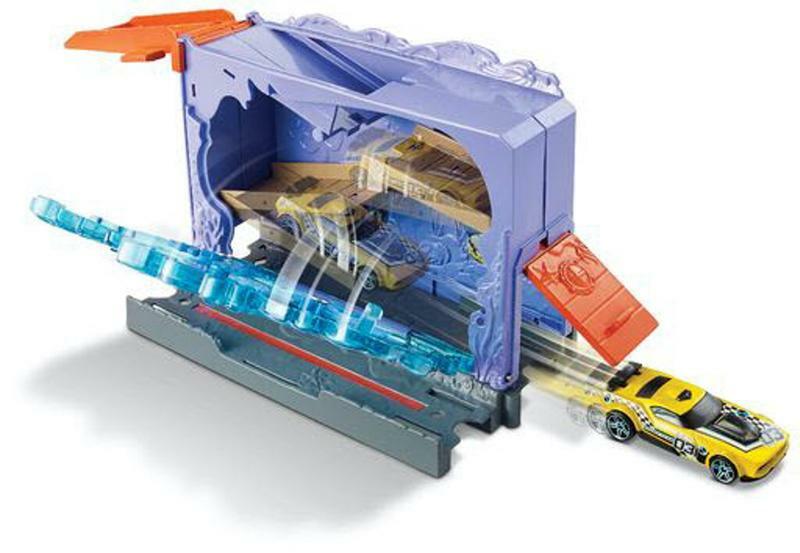 • These amazing 12-inch vehicles with lights and sounds inspired by the Jurassic World franchise have full interior with working doors and realistic sounds and lights for reenacting favorite movie moments. 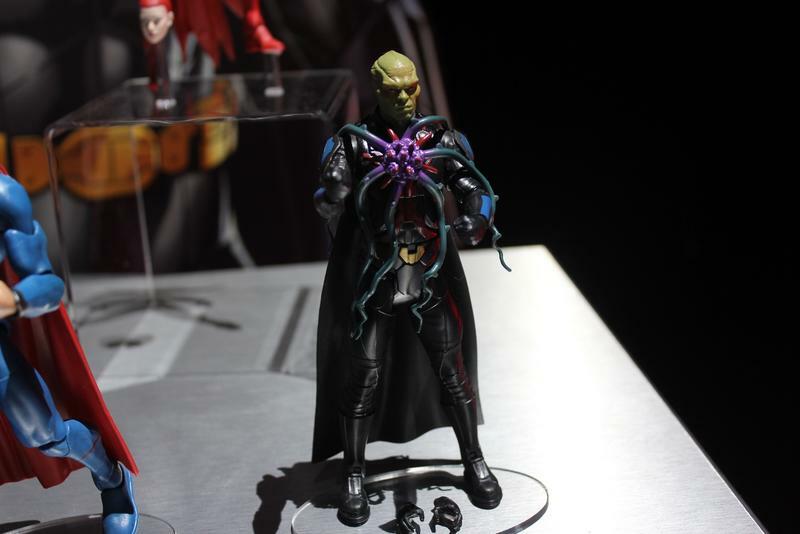 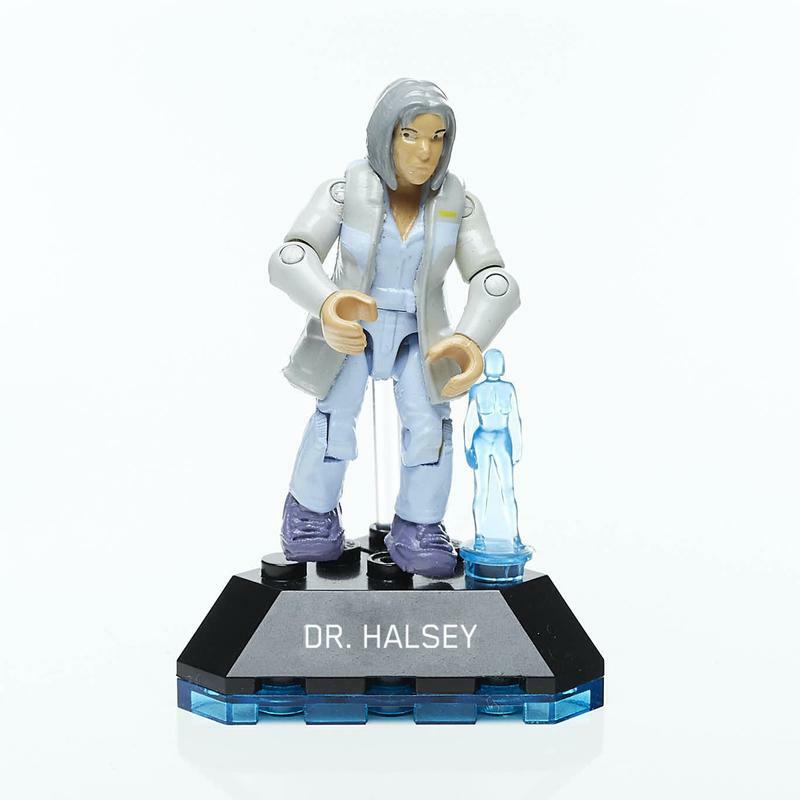 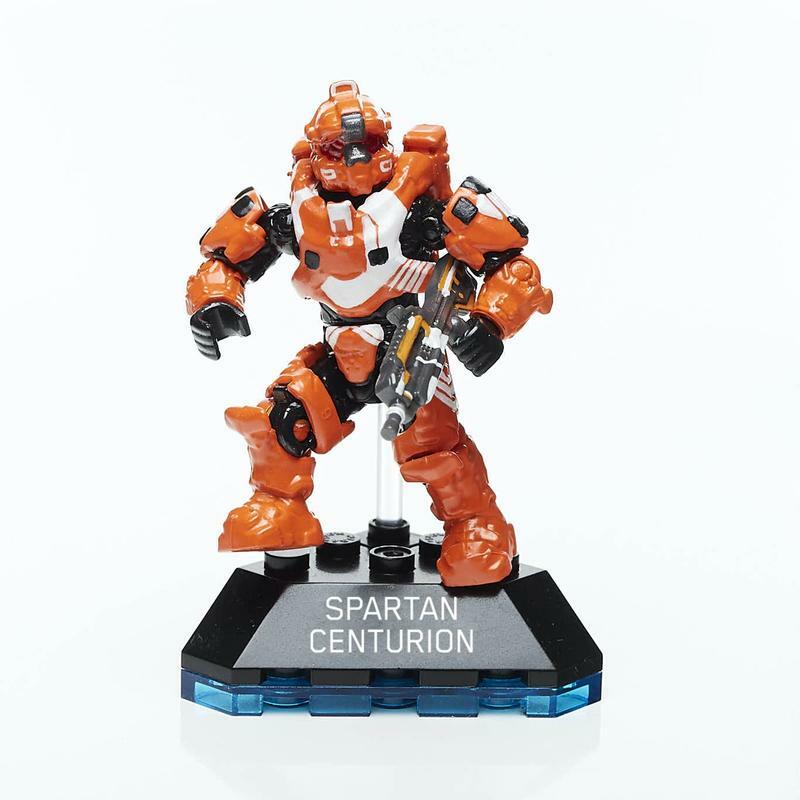 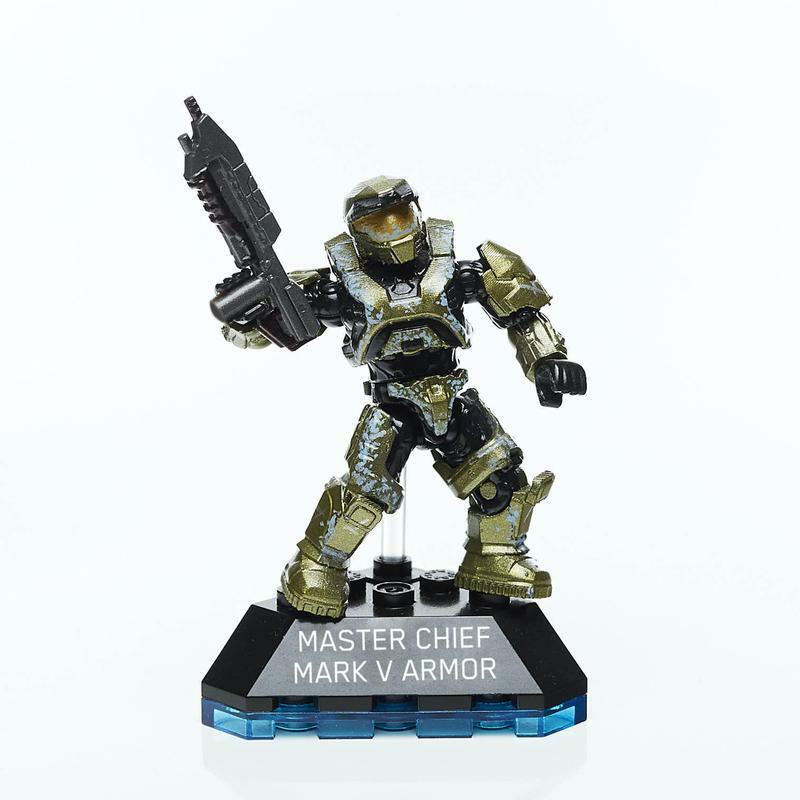 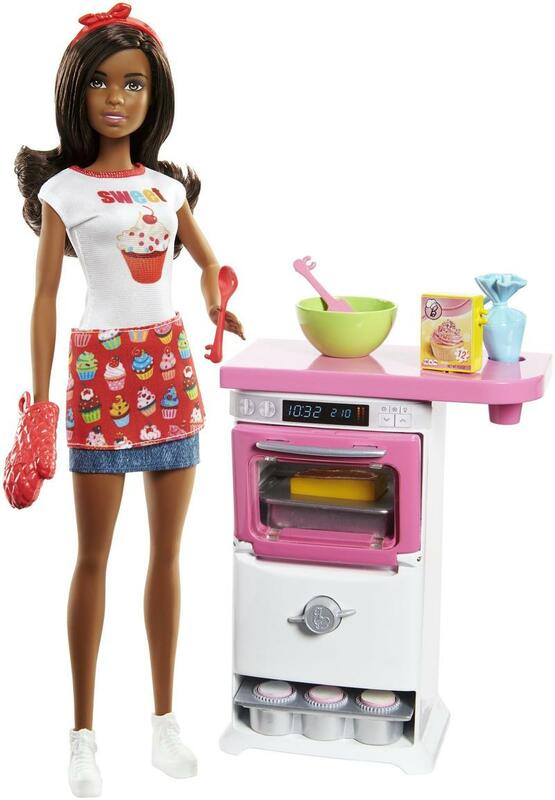 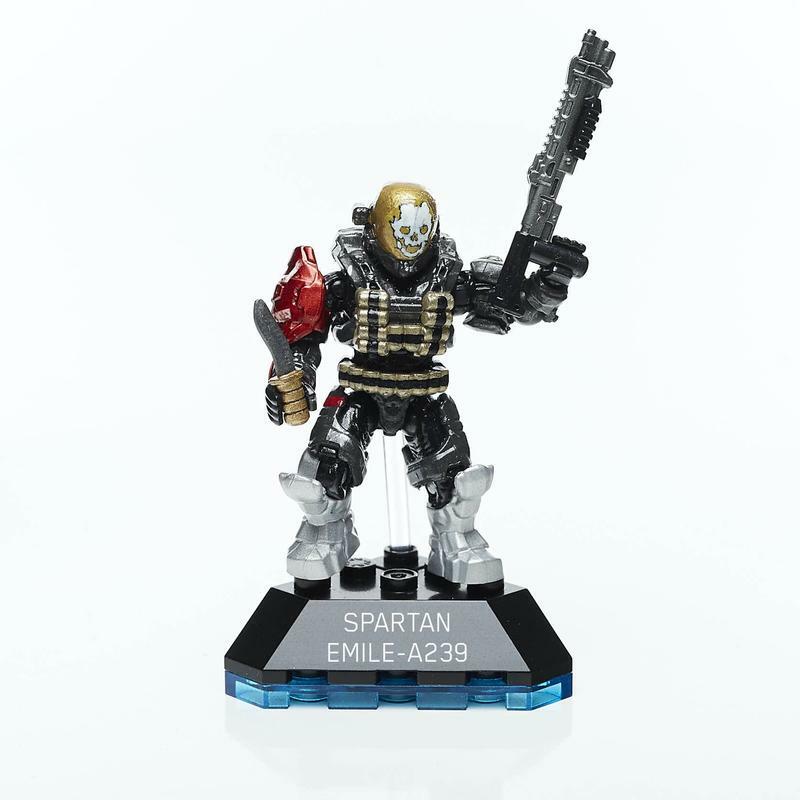 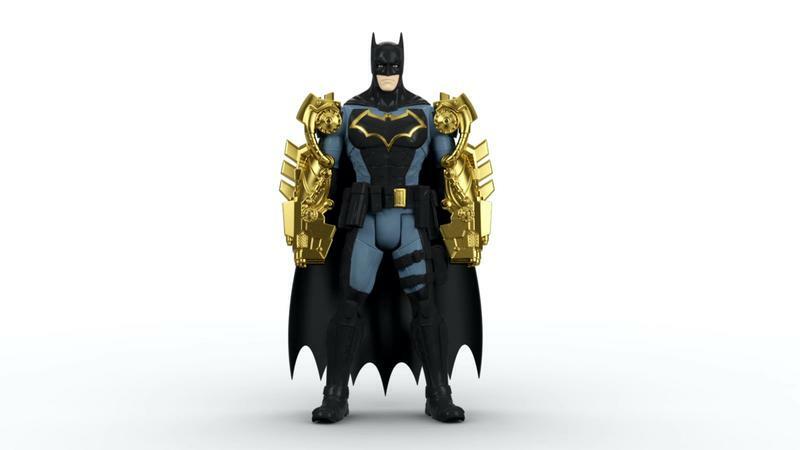 • Compatible with 3.75″ action figures (not included). 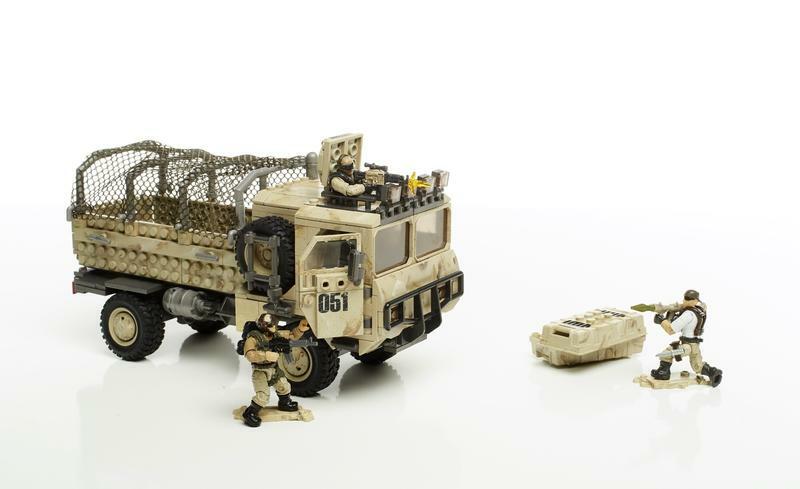 • This 8-inch Jeep, featured in the movie, has oversized wheels and net trapper to capture dinosaurs. 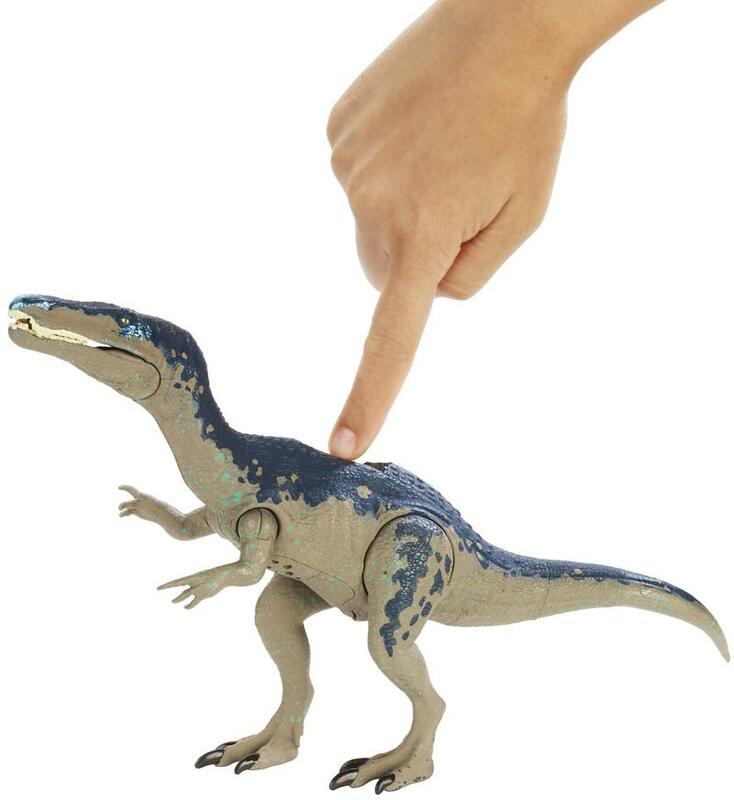 • Compatible with 3.75″ action figures (not included) for re-enacting favorite Jurassic World moments and comes with a Dimorphodon dinosaur figure. 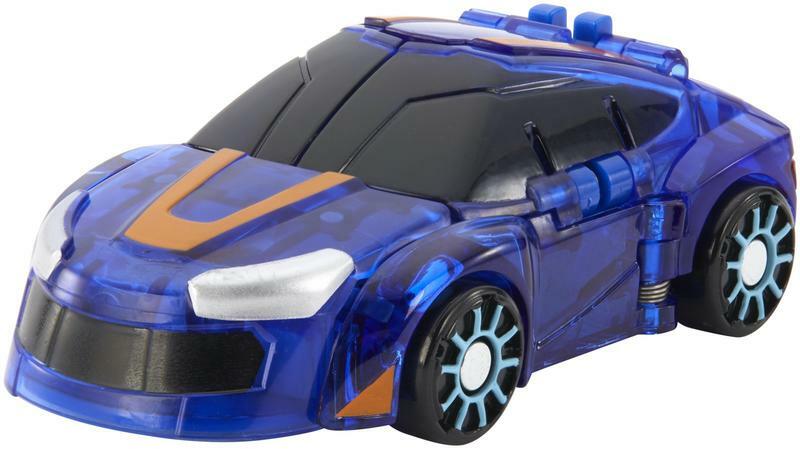 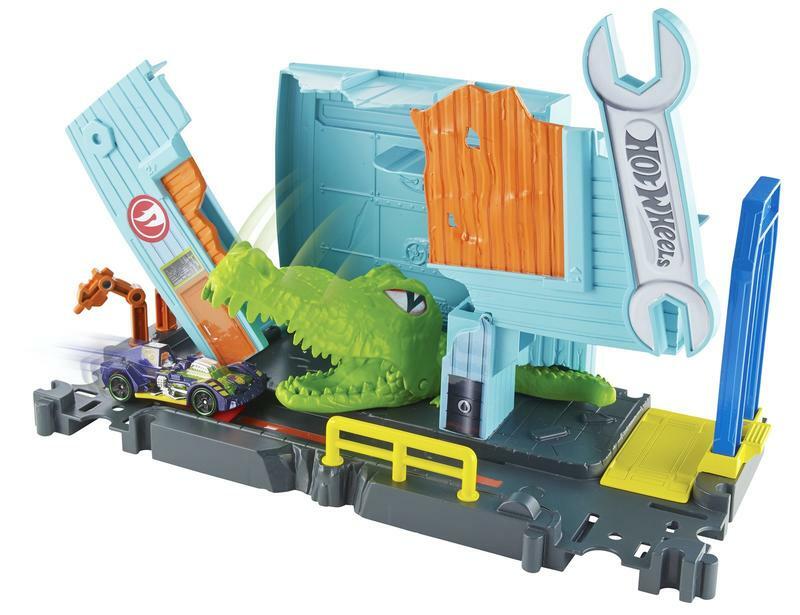 • Hot Wheels® has reimagined your favorite Jurassic World™ dinosaurs as cars for fans of all ages to collect and recreate the epic action from the film. 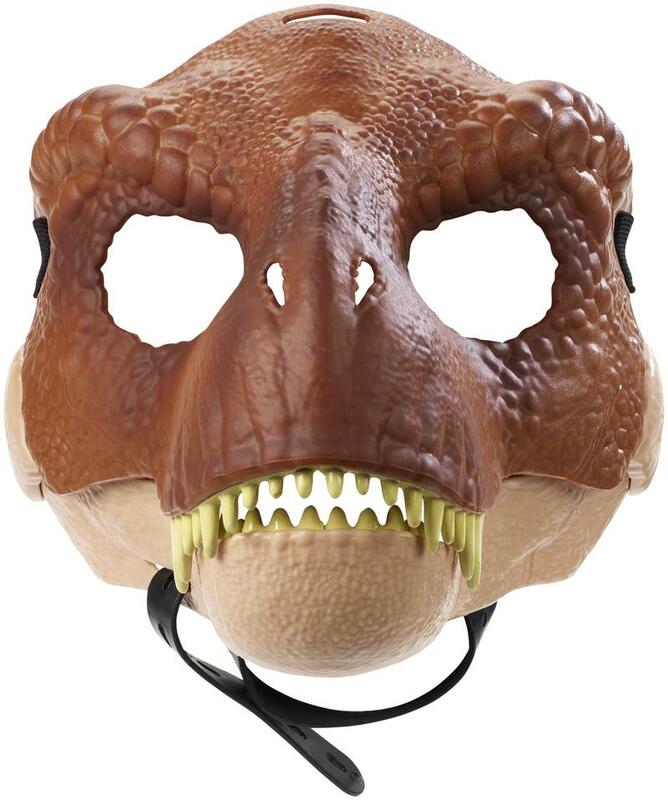 • The mask features realistic details like skin texture and color, real moving eyes and teeth. 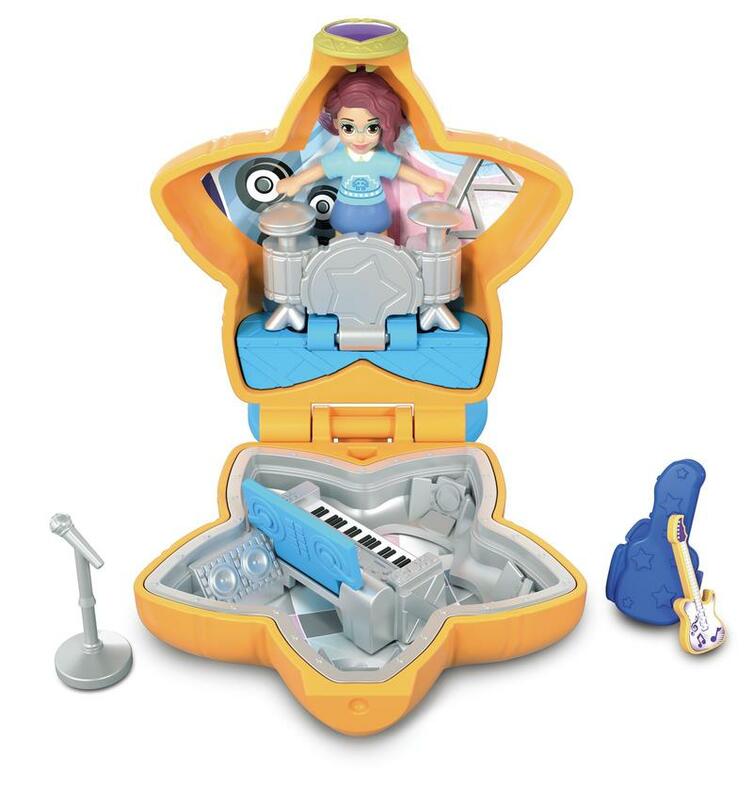 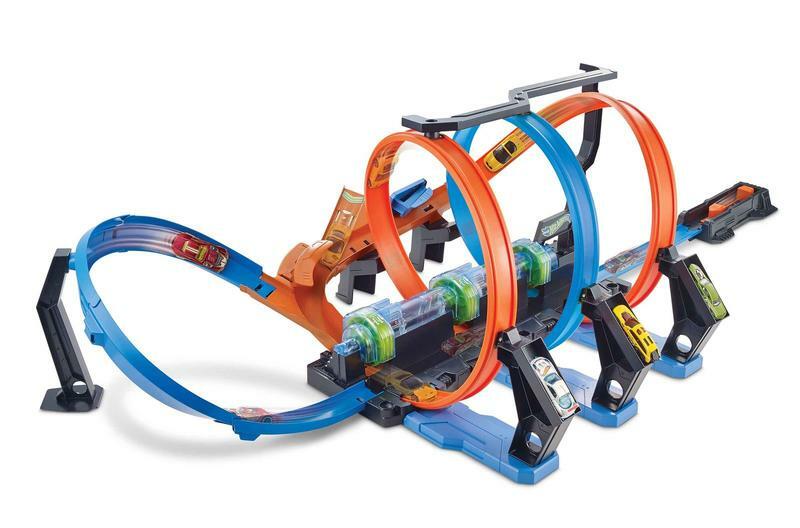 • Take the fun to the next level with the three sound modes. 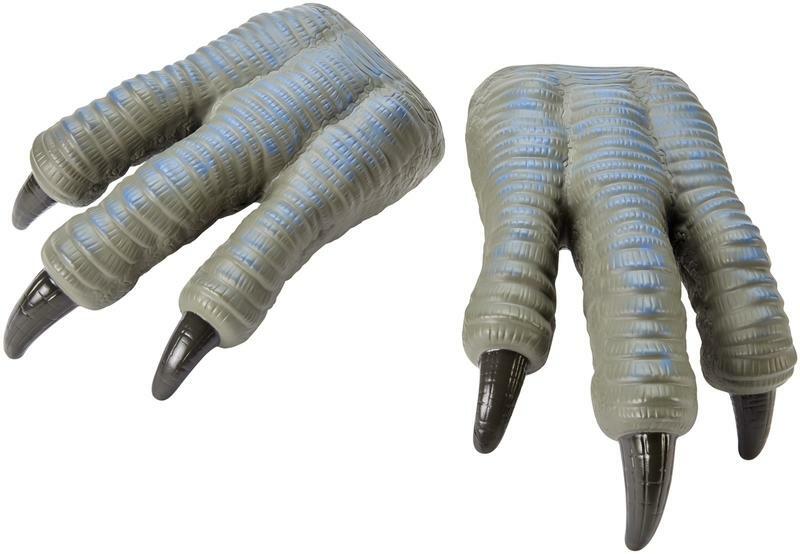 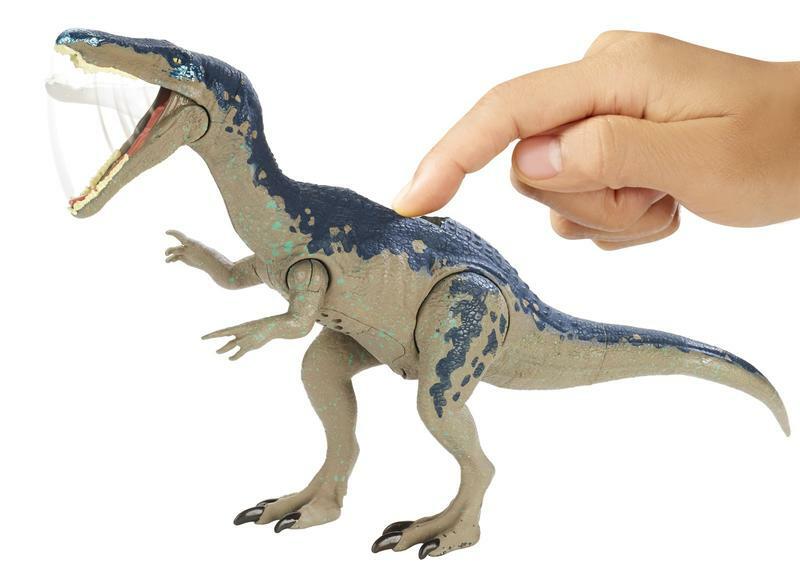 SRP: $14.99 | 3+ years | Available: Spring 2018 • With Blue’s Claws kids can act out the epic action from Jurassic World • These flexible and bendable claws feature realistic details and are the perfect dinosaur role play item. 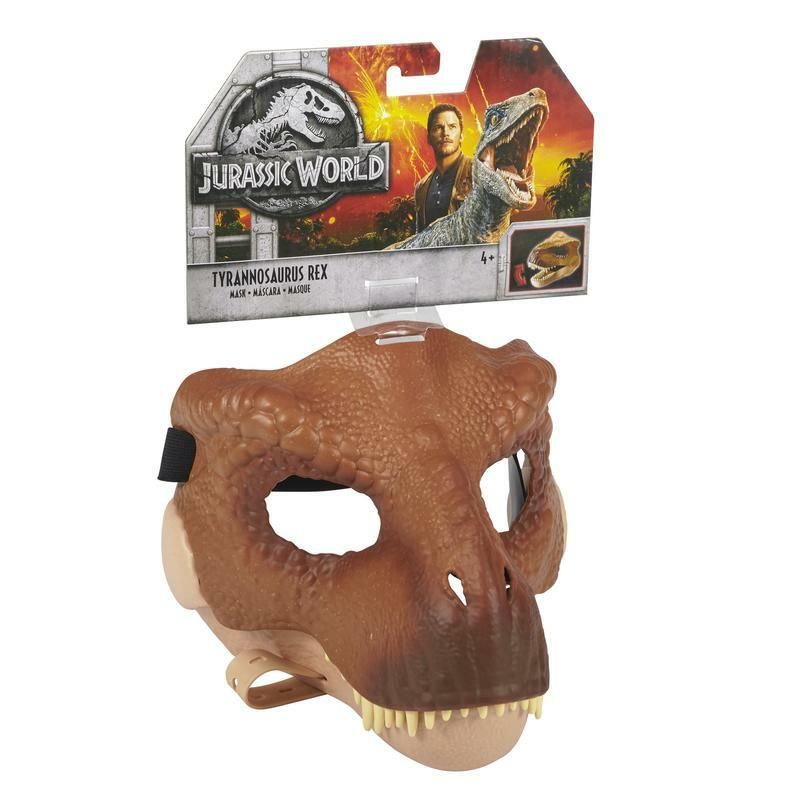 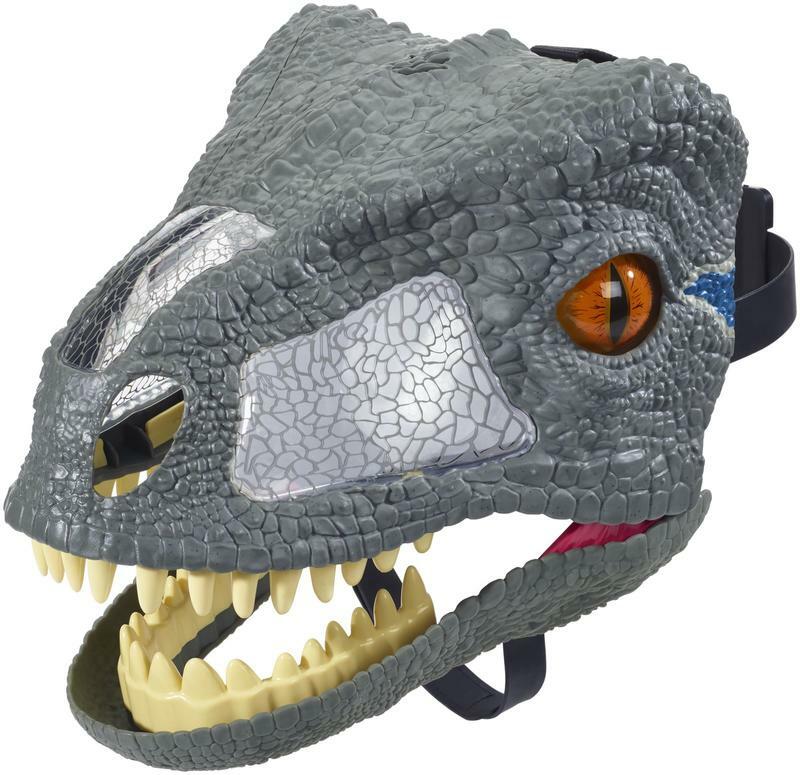 • These iconic T.rex and Villain Dino dinosaur masks are inspired by the movie and feature realistic details like skin texture and color, eyes and teeth so kids can become their favorite dinosaurs. 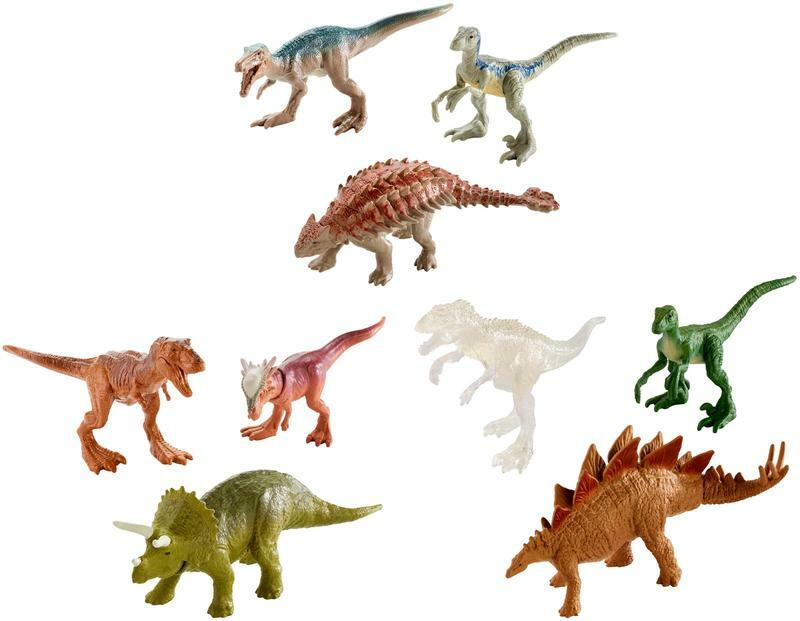 • This assortment captures Jurassic World dinosaurs as babies, hatching from their eggs. 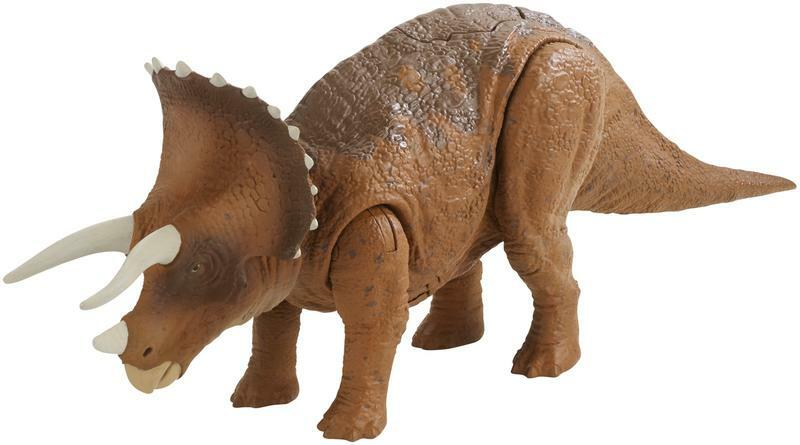 • Each dinosaur is made of soft fabric and materials featuring realistic details. 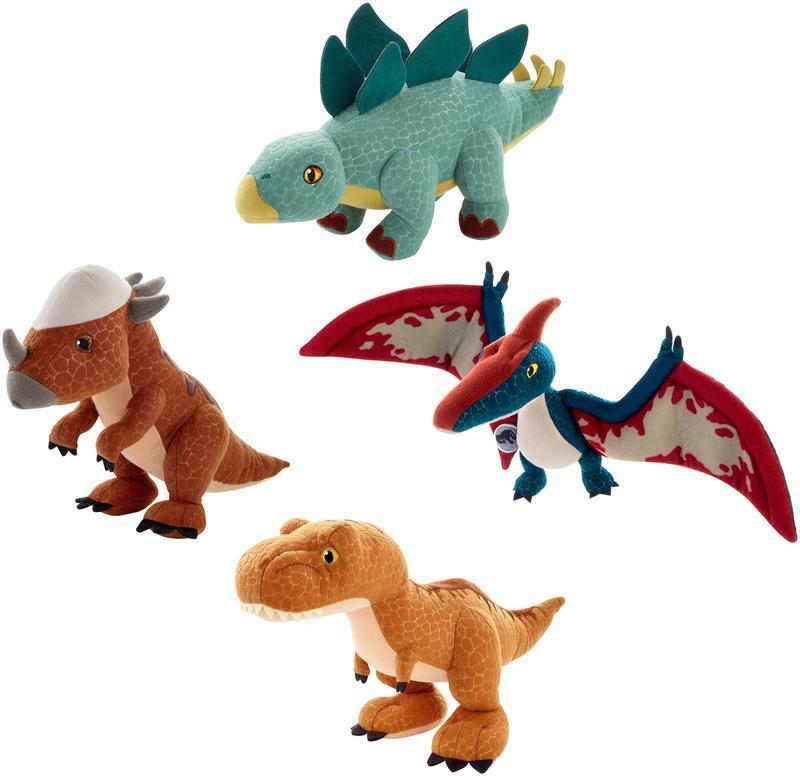 • This Plush Assortment captures all the style of Jurassic World dinosaurs in soft plush characters. 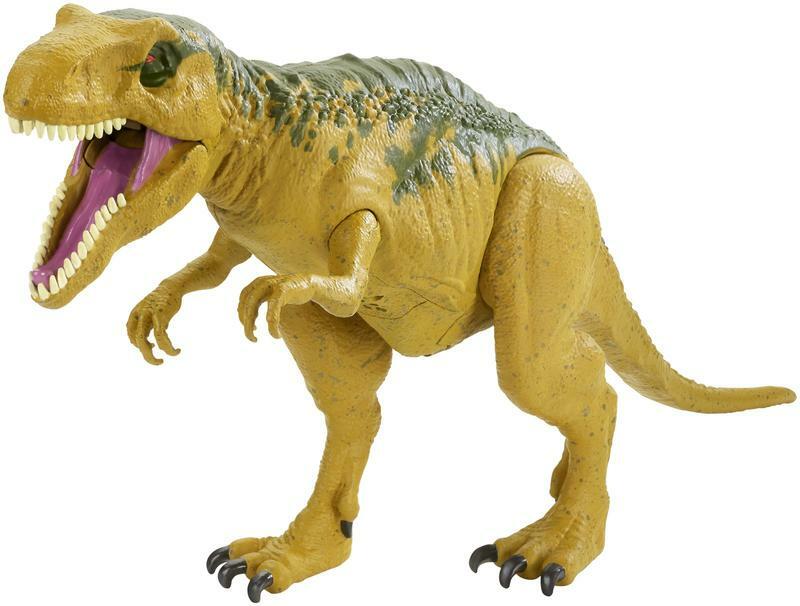 • Each dinosaur is made of soft fabric and materials featuring realistic details like embossed scales, spikes, claw and toe details and more. 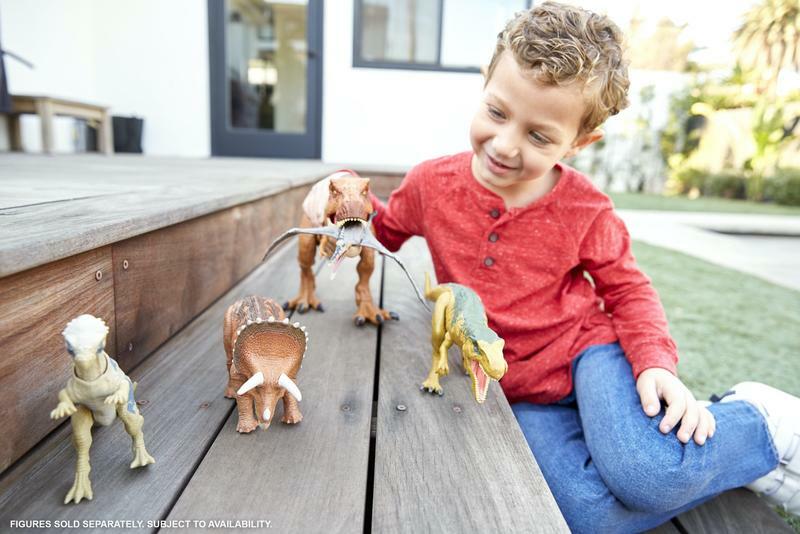 • Cuddle up with these ferociously cute plush dinosaurs that also include a fun reversible form feature for double the fun. 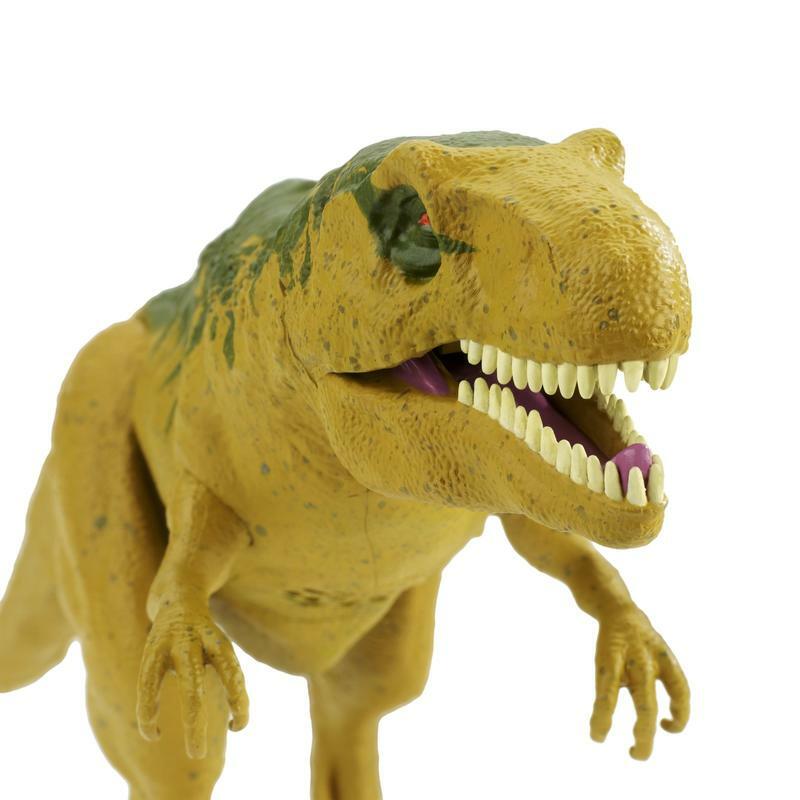 • Dinosaur plush figures are made of soft fabric and materials and feature realistic details like embossed scales, spikes, claws, toe details and more. 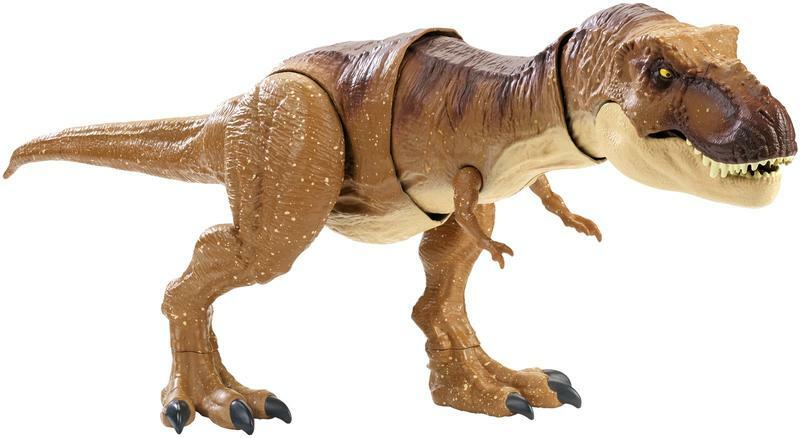 And, each plush dinosaur comes in a reversible egg that can be turned inside out to reveal a cute character. 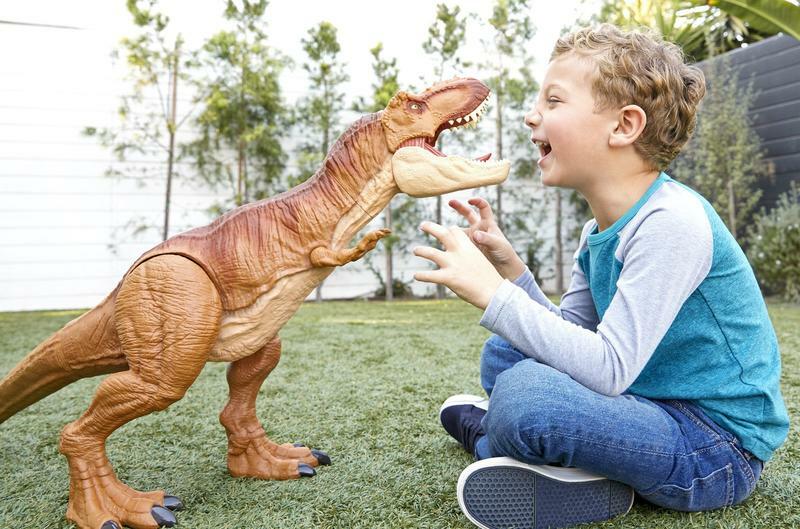 • The Plush Sound Assortment captures all the style of Jurassic World dinosaurs in soft plush characters with dinosaur sound effects. 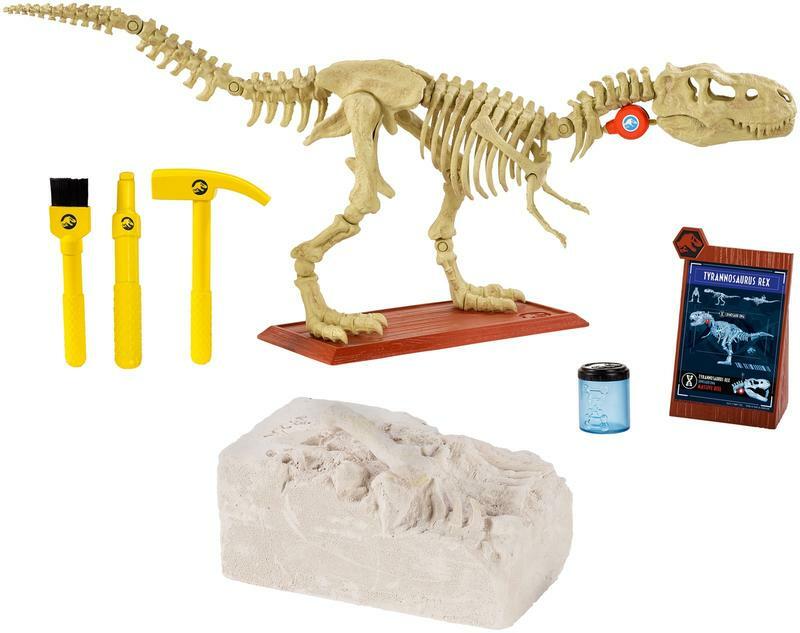 • Now kids can play “paleontologist” with the Jurassic World Fossil Strikers™ Assortment. 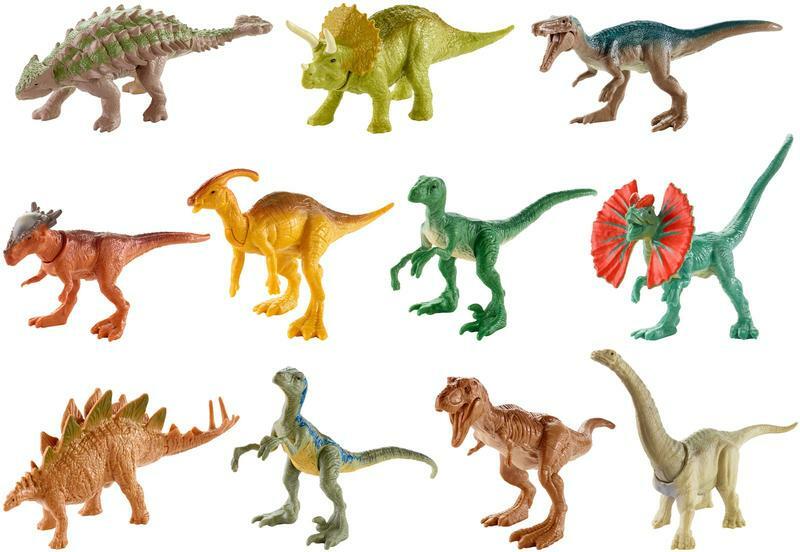 • This assortment contains four different dinosaurs and their fossilized bones with instructions on how to build the complete dinosaur. 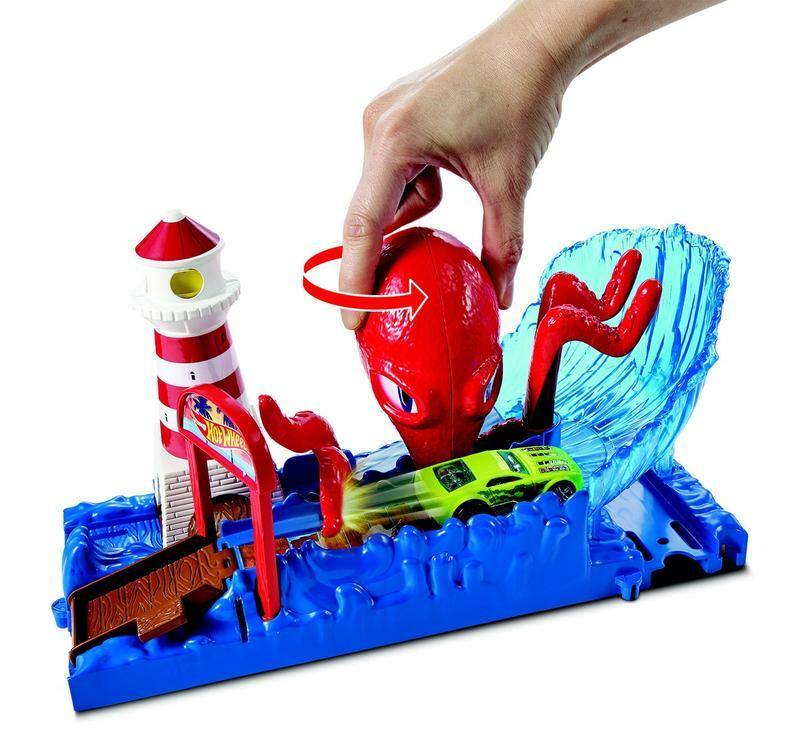 • Now kids can learn anatomy while having fun. 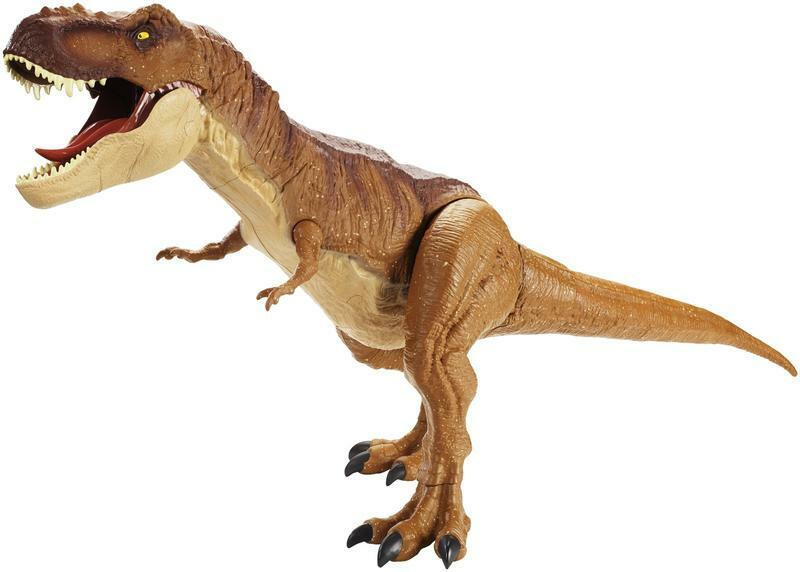 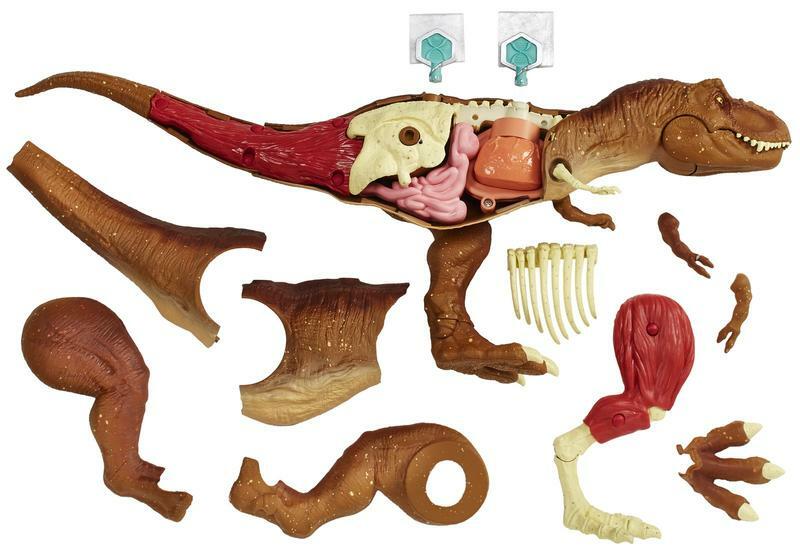 This large-sized T.rex has one removable side that allows kids to see how the inner anatomy of the T.rex functions. 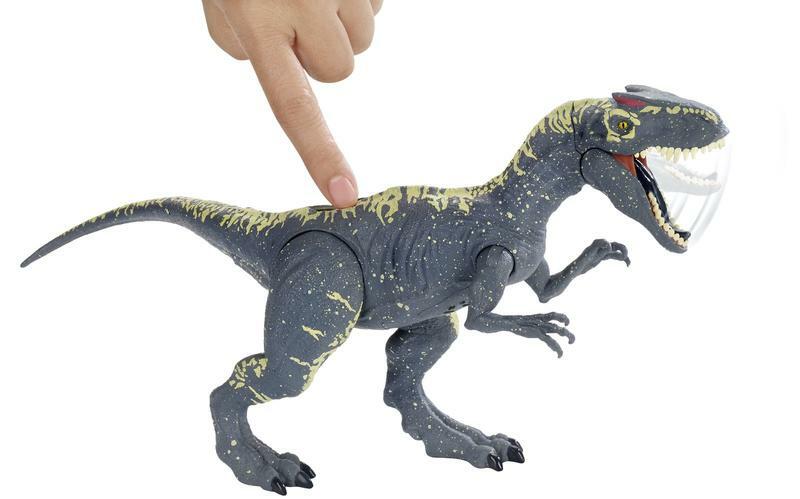 • By using the “DNA” key, kids can move the leg to see the muscle flex, see the heart and lungs pump and activate the T.rex’s large chomp. 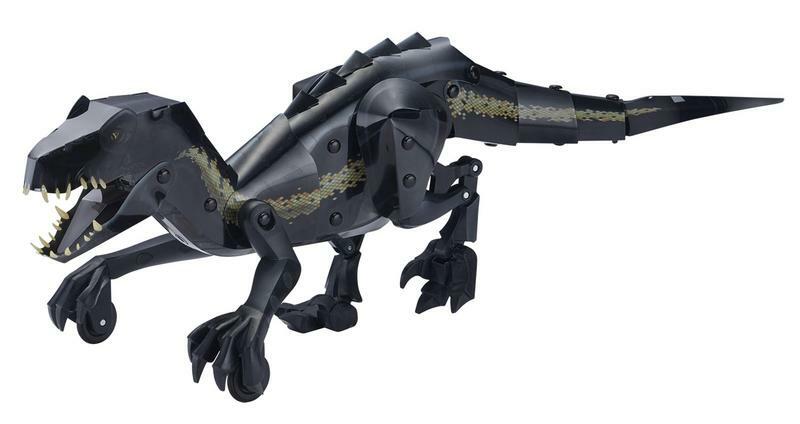 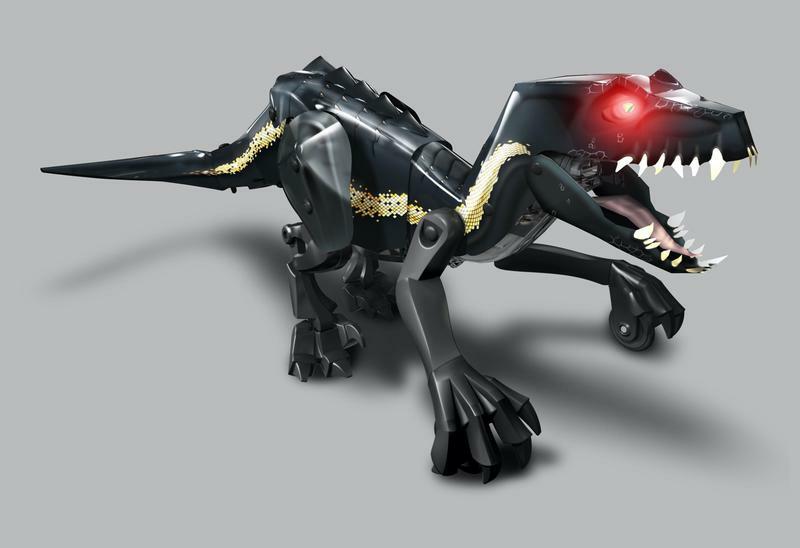 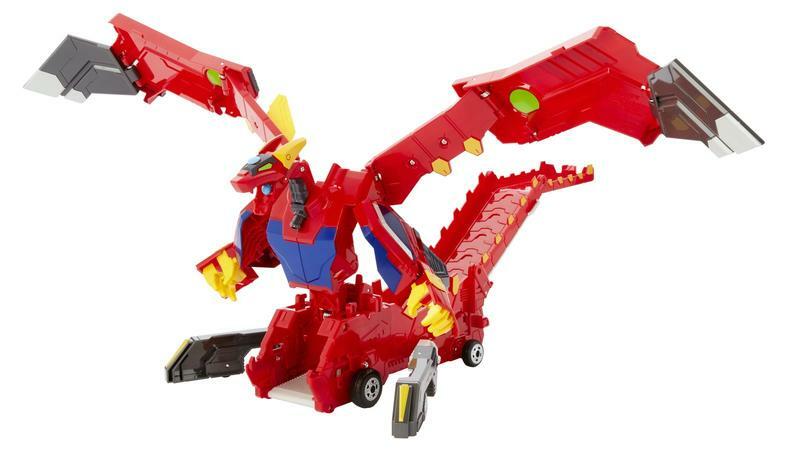 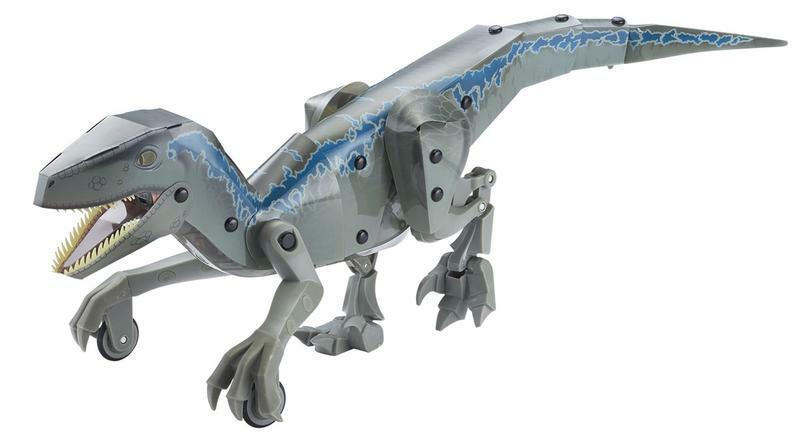 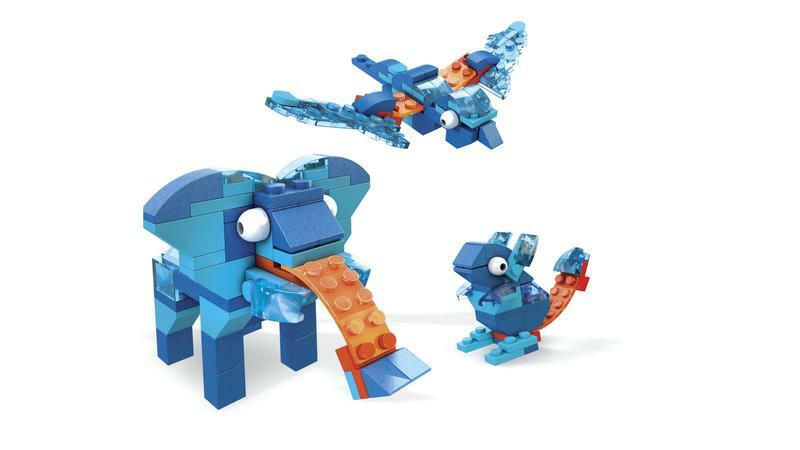 Jurassic World Kamigami™ Robots SRP: $59.99 | Ages 8+ years | Available: Spring 2018 • With the Kamigami™ build-it-yourself robot platform, kids can create their own Jurassic World Velociraptor “Blue” or Villain Dino robots. 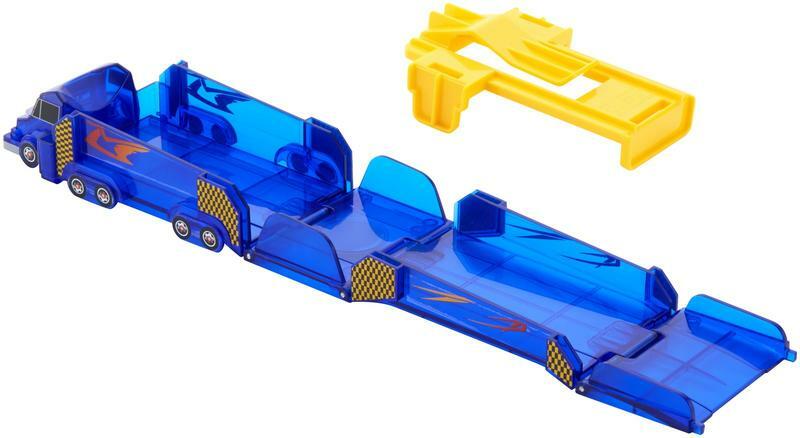 • Just fold and snap together the durable, plastic pieces from the raptor shell sheet. 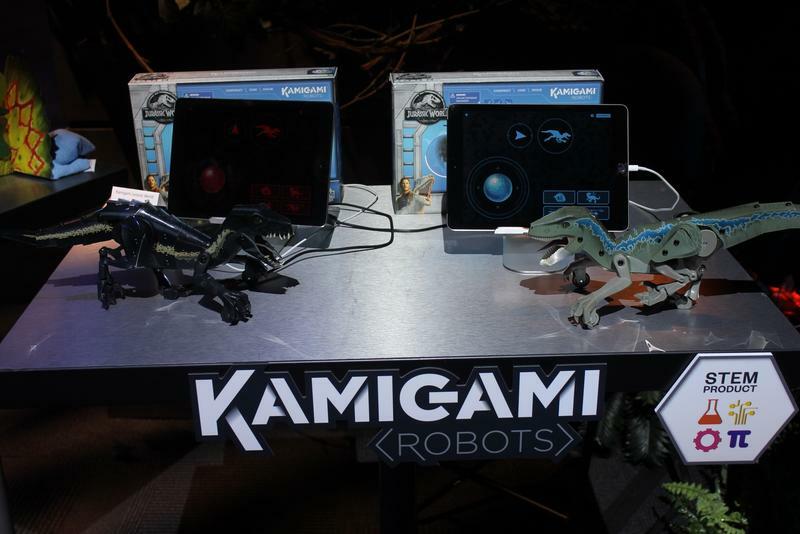 • Connect to the Kamigami Jurassic World mobile app to customize your movements, interactions, lights, and special Jurassic World sounds. 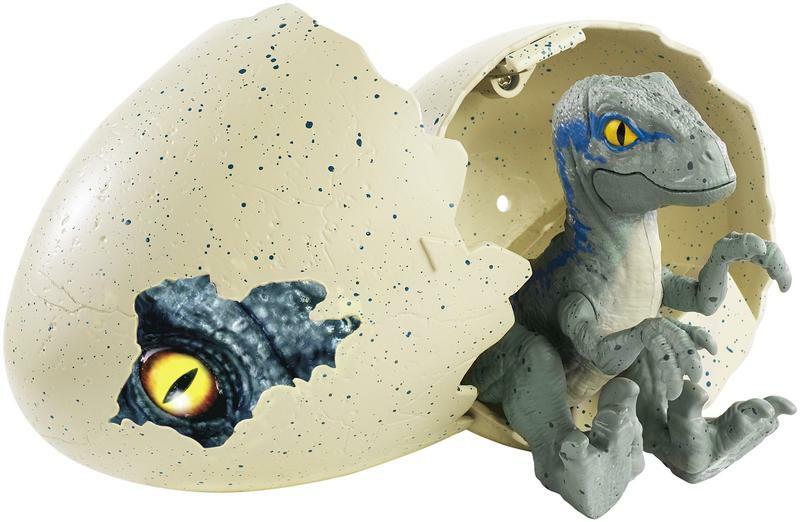 • Jurassic World Hatch ‘N Play Dinos capture that magical moment when a baby dinosaur egg hatches and you see the baby dinosaur for the very first time. 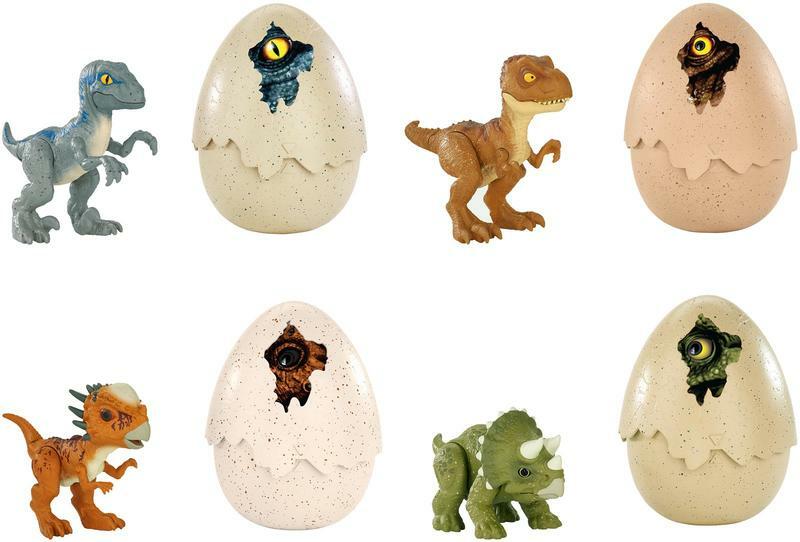 • Each egg comes with a unique dinosaur species inside, and when activated, the egg hatches and the top pops off to reveal the baby dinosaur. 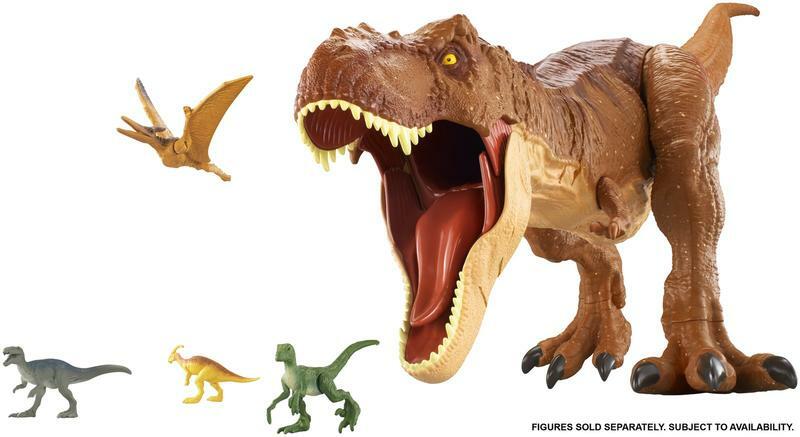 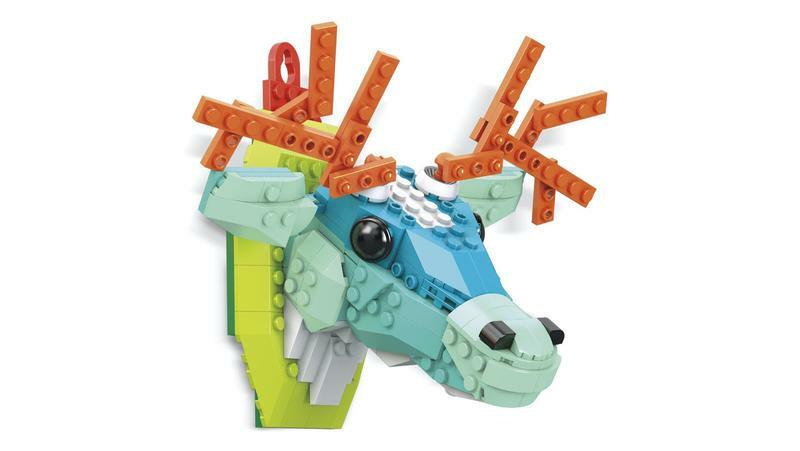 • Each figure has a special feature unique to its species: The T.rex’s teeth grow for a super chomp; Baby Blue the Velociraptor has chomping jaw action; the Triceratops has a super stomp; and Stiggy has growing horns. 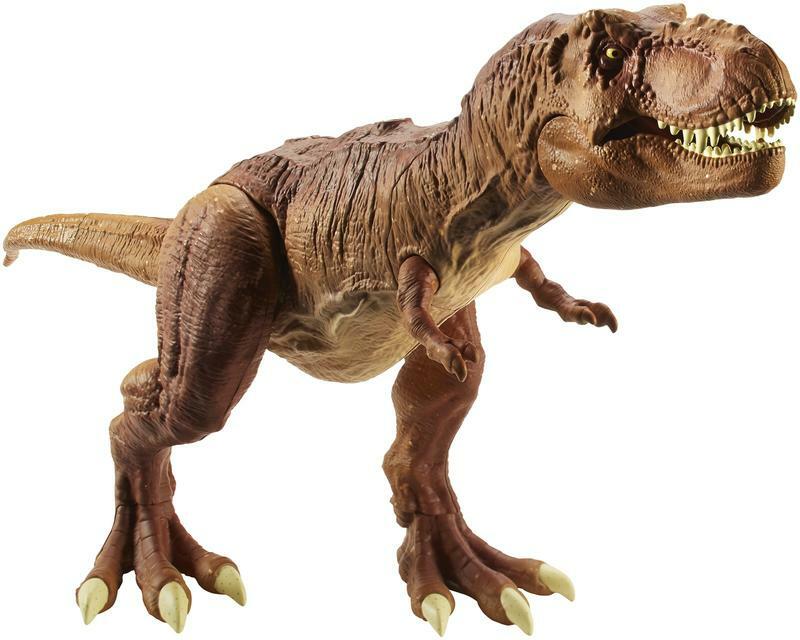 SRP: $54.99 | 8+ years | Available: Spring 2018 • This Super Colossal T.rex is three feet long and inspired by the iconic T.rex from the Jurassic World franchise, and features articulation, authentic sculpt and deco, and the ability to eat up to twenty-size mini dinosaur figures. 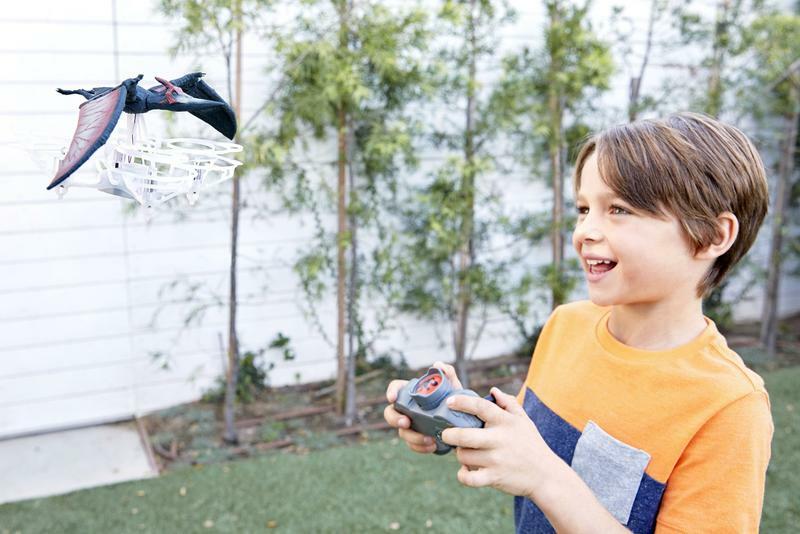 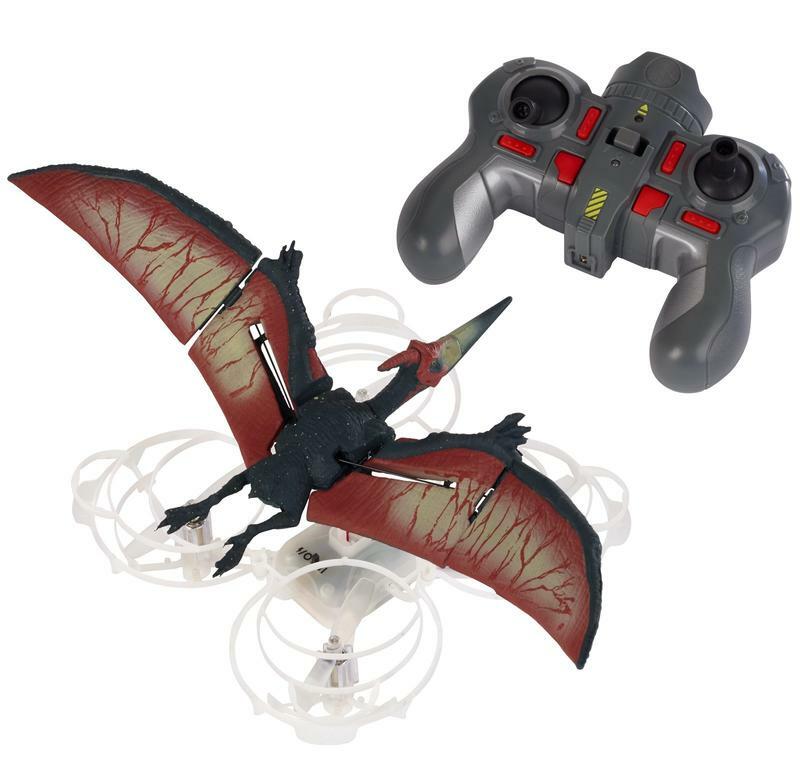 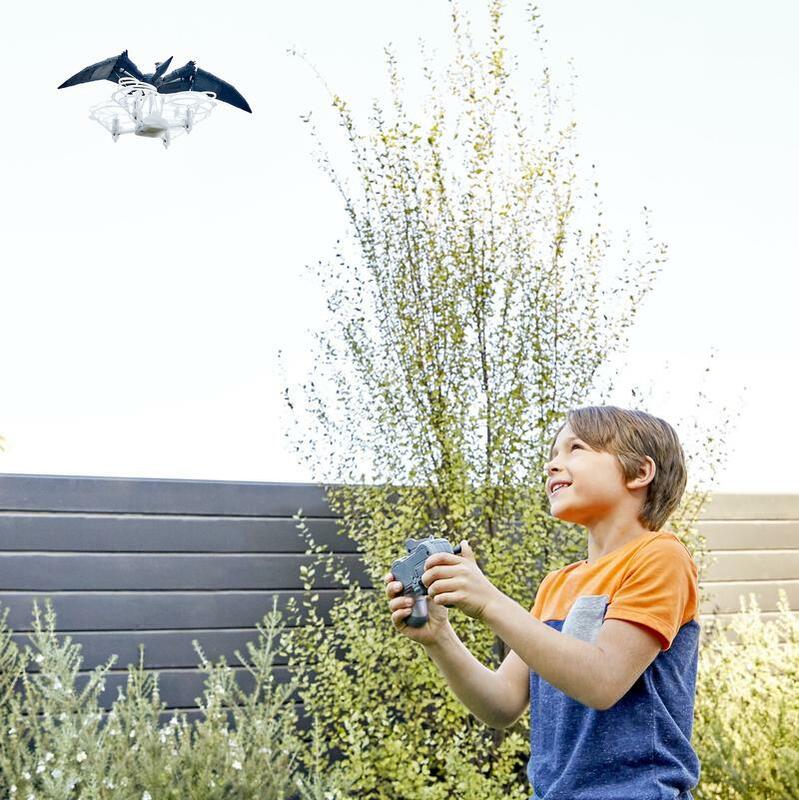 • Go to new heights with this quadcopter Pterano-Drone™ that takes flight through a hand-held remote control. 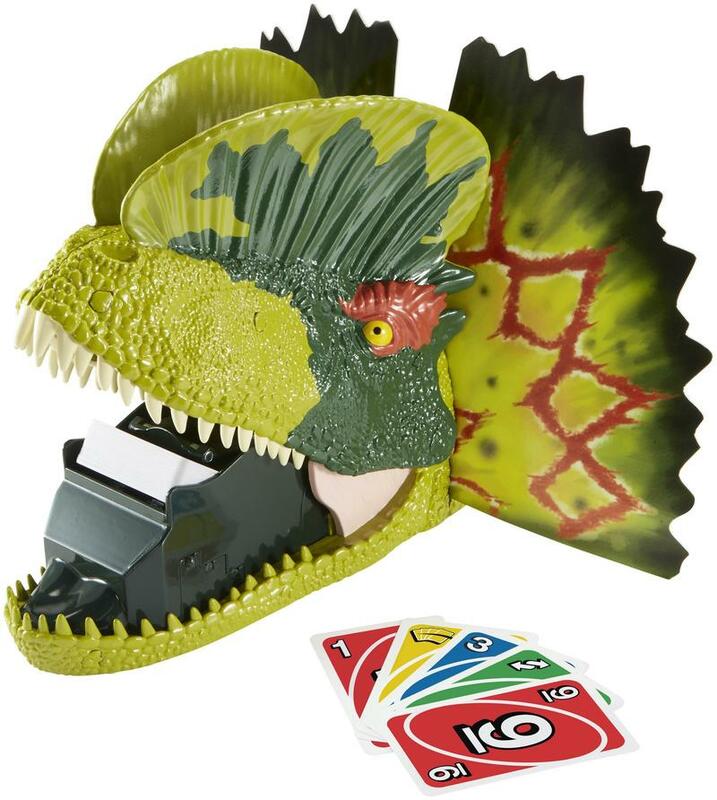 • Preschoolers can get in on the Jurassic World excitement with this iconic, kid-controlled Jurassic Rex. 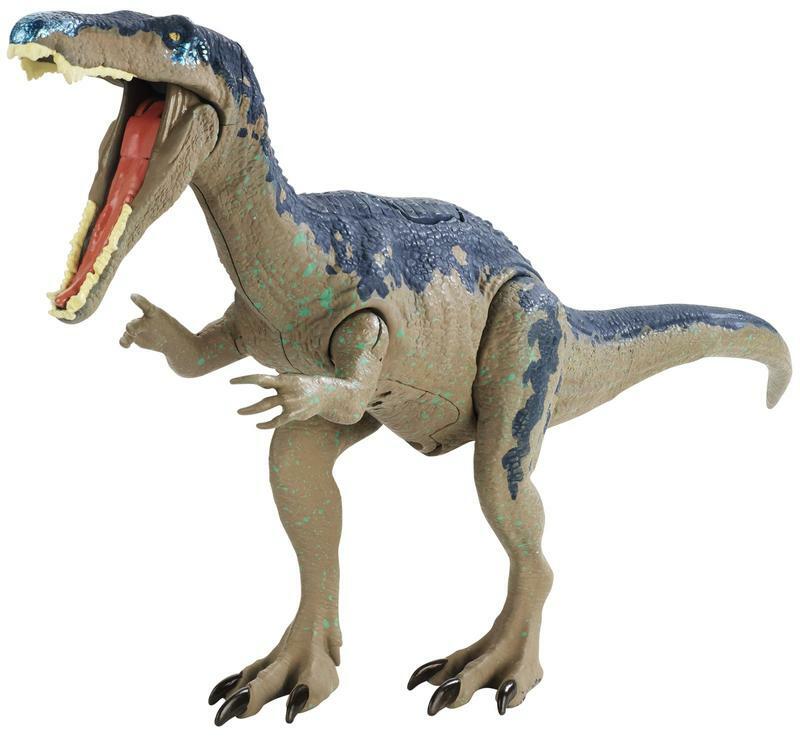 • Jurassic Rex lunges forward with arms out and mouth open, chomping her mouth around her prey with the press of the trigger. 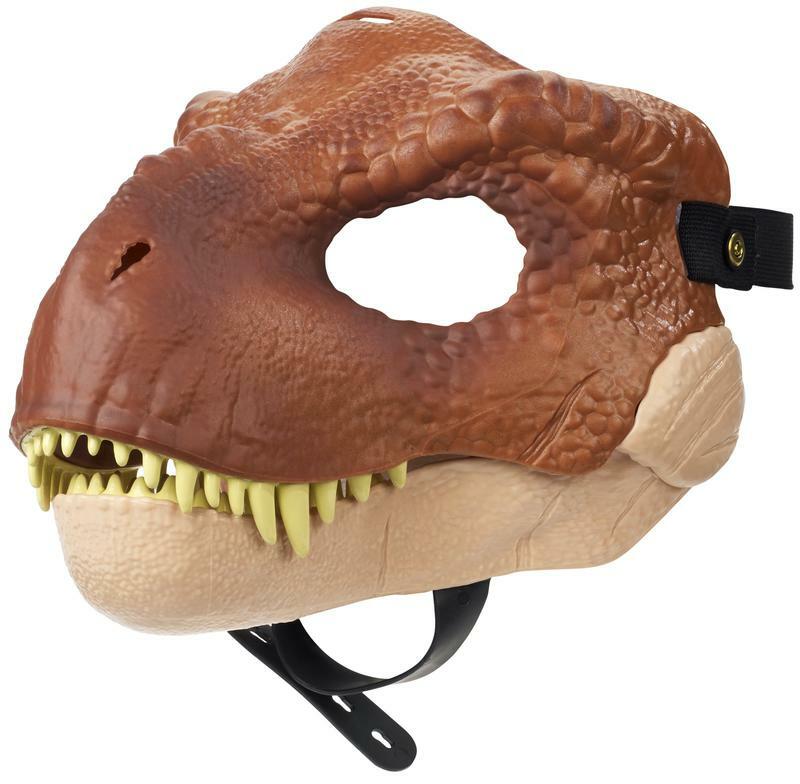 • Press the button on the dinosaur’s head to pop-open the blindfolds, and twist the Power Pad to change her eyes between green and red with a glowing-red mouth. 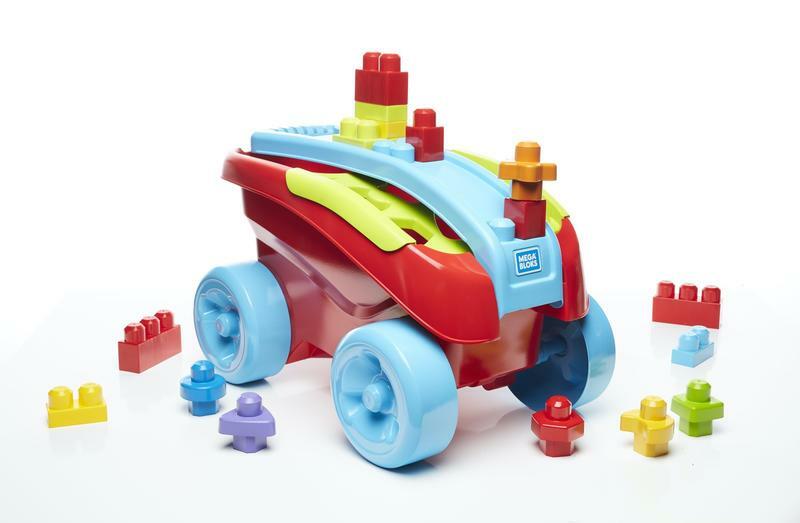 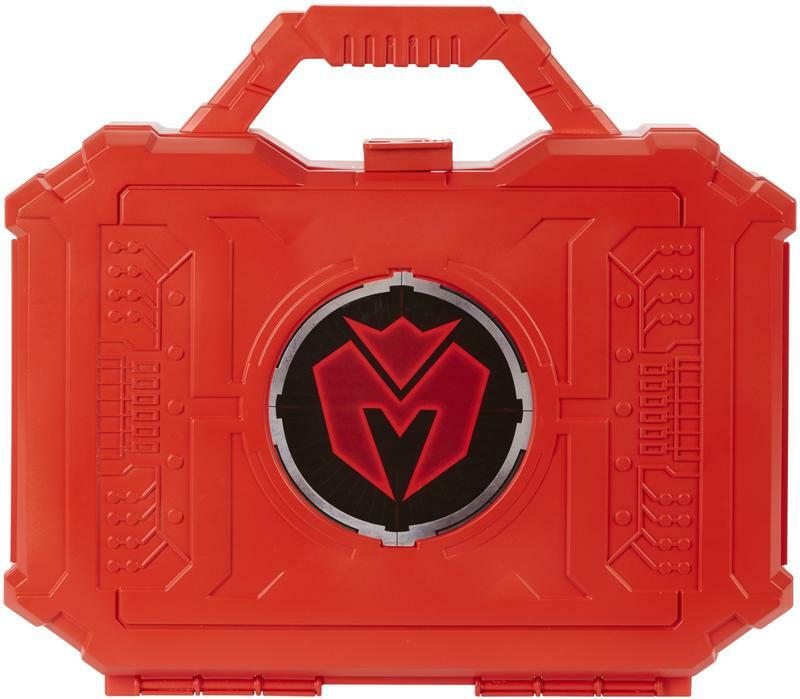 • Press the Power Pad to launch the ATV & send Owen racing into action. 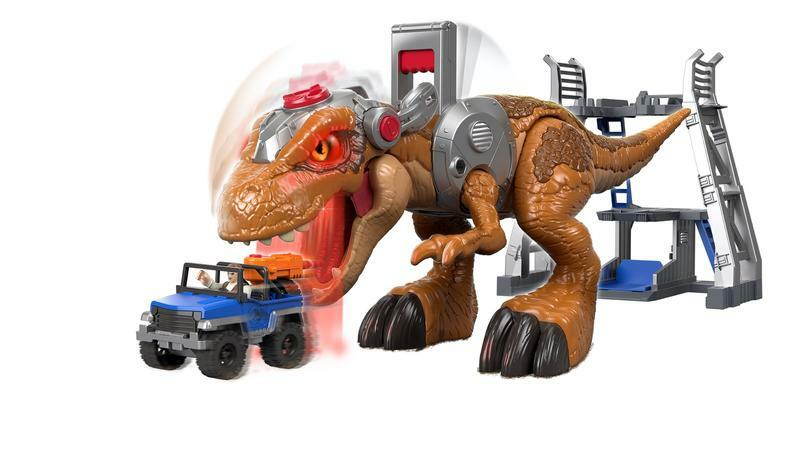 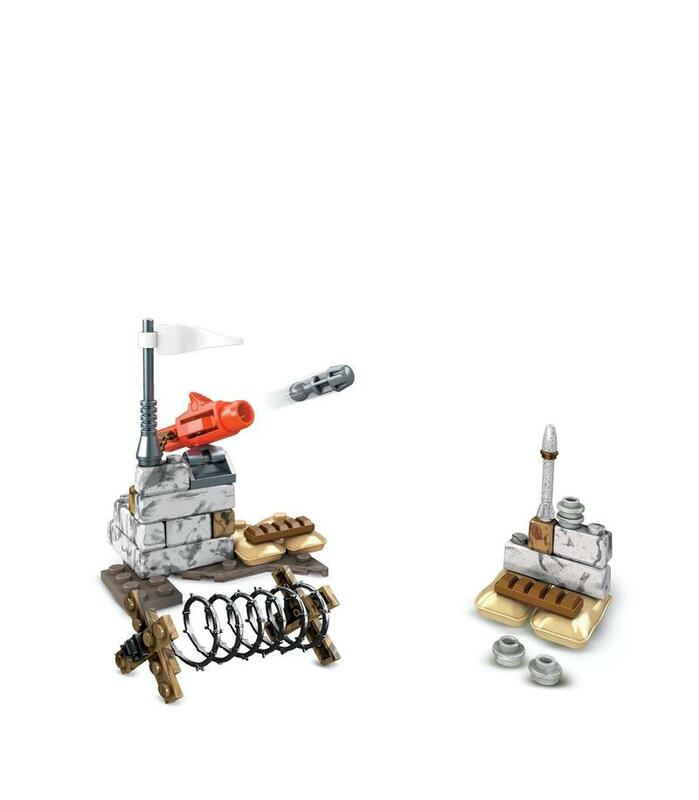 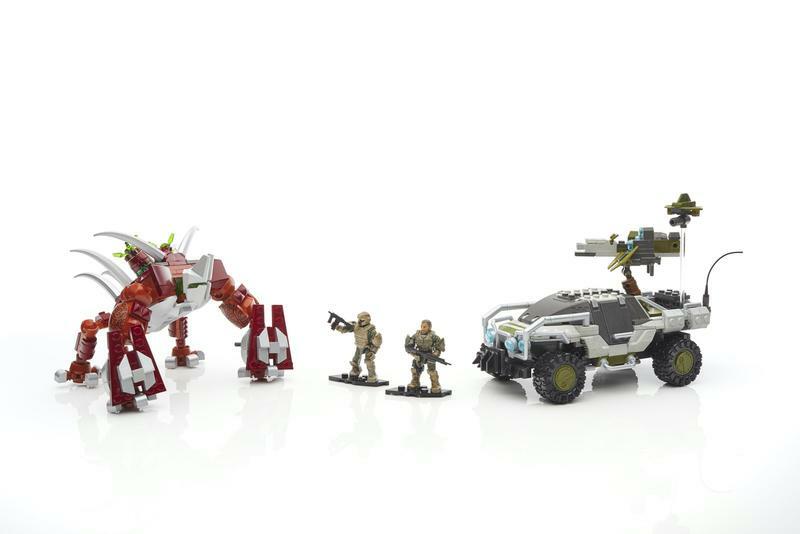 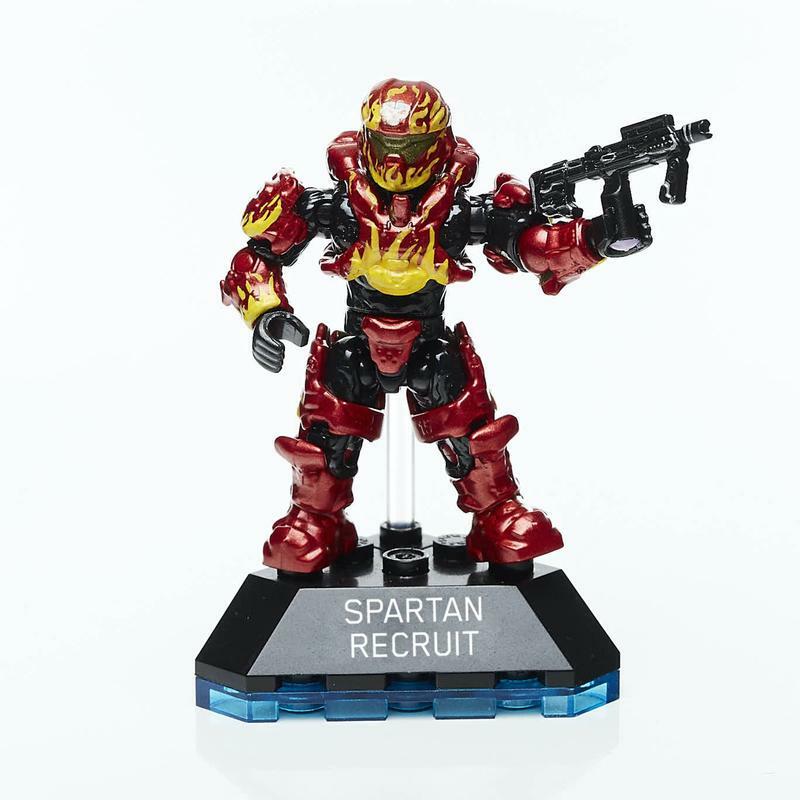 • Includes T.rex dinosaur figure, holding base, projectile launcher, 2 projectiles, ATV & Owen figure. 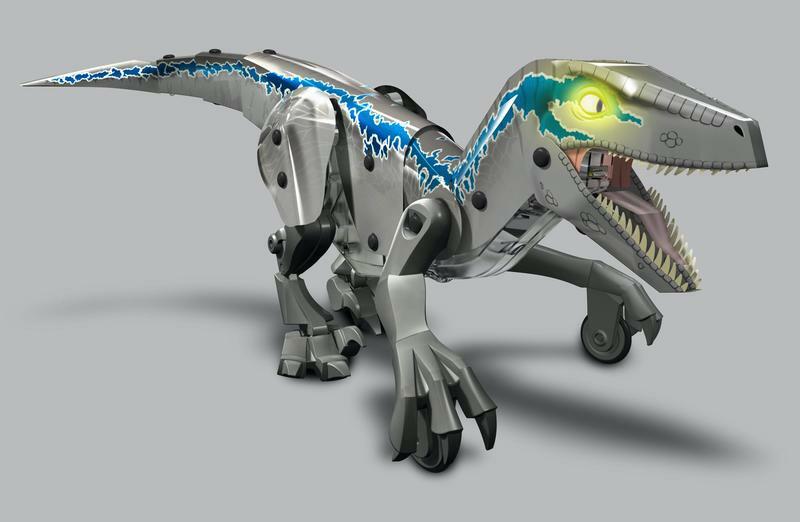 • Help Owen try to control the untamable Villain Dinosaurr that actually chases the ATV. 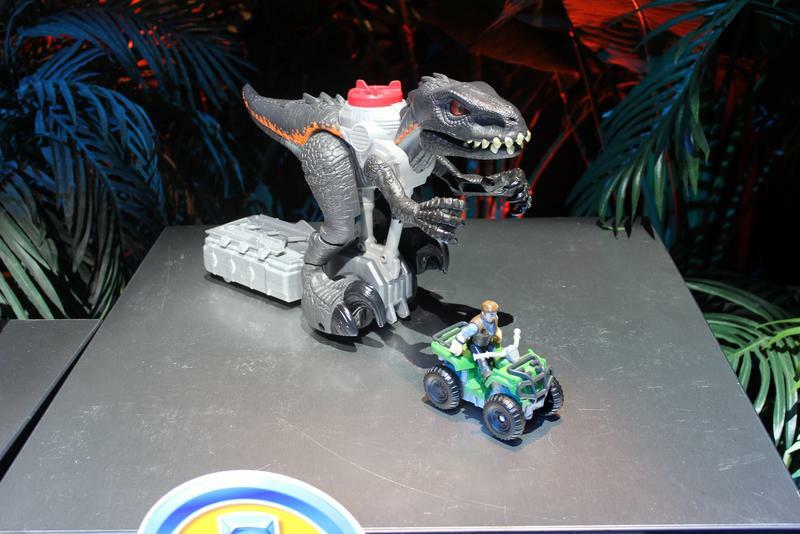 • Manually pushing the ATV in front of the Villain Dinosaur provokes it and causes it to rush forward in two speeds: walking or rushing. 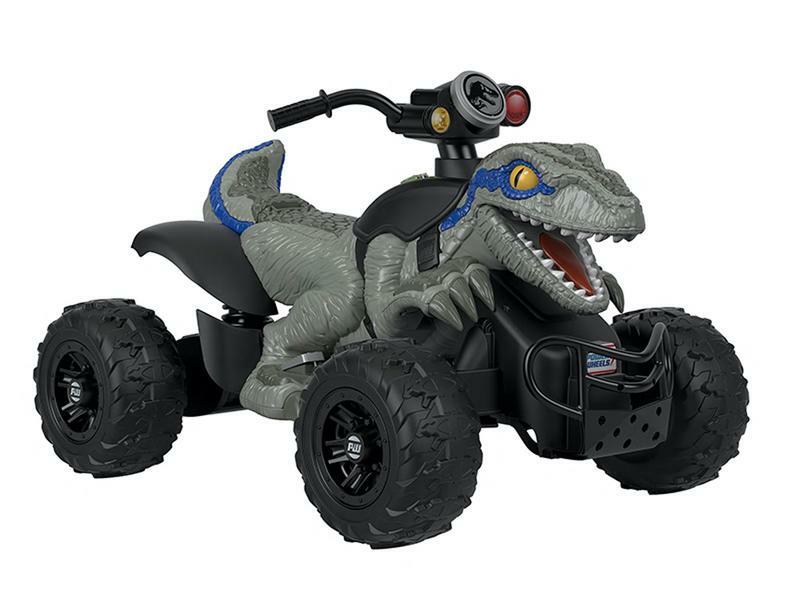 • Kids can recreate the exiting off-road action of the film on this ride-on Raptor inspired by Blue that includes realistic features like an open mouth filled with sharp-looking teeth. 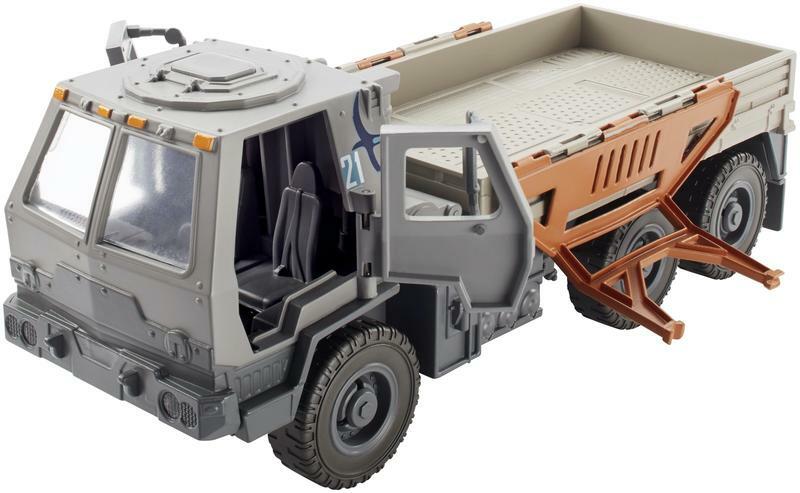 • Drives on hard surfaces, grass, and rough terrain at max. 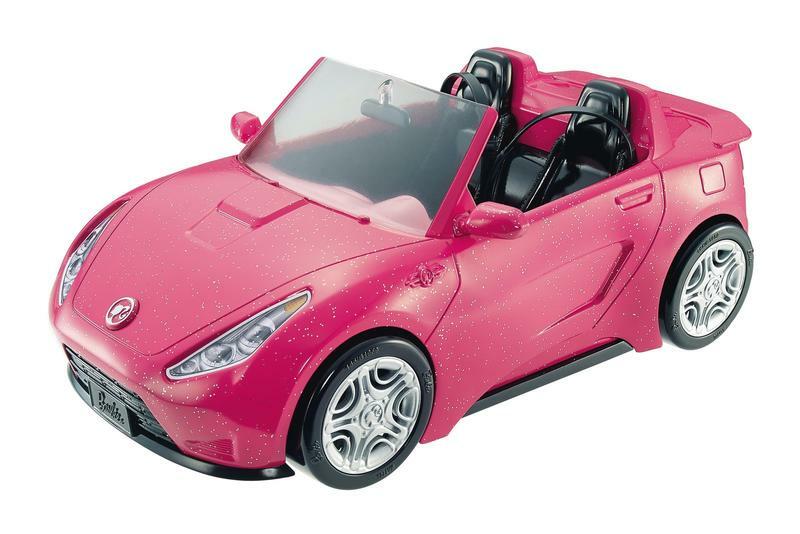 speed of 6 mph, with a parent-controlled, high-speed lock out for beginner drivers. 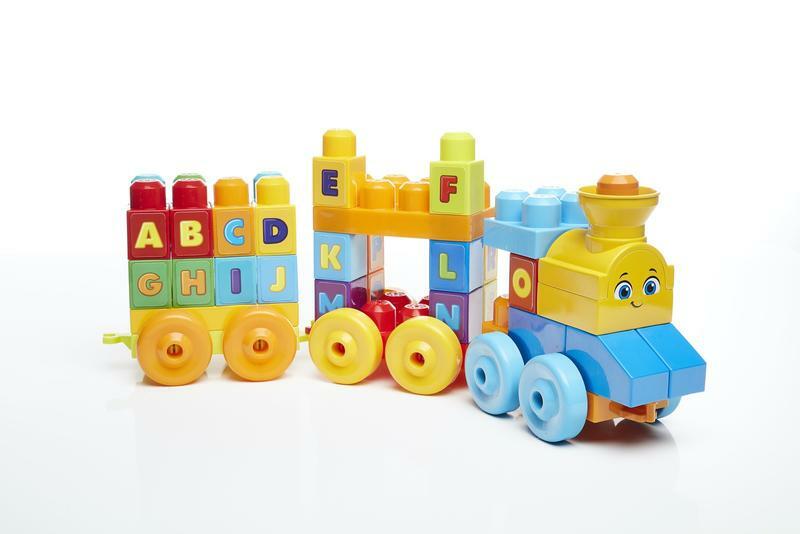 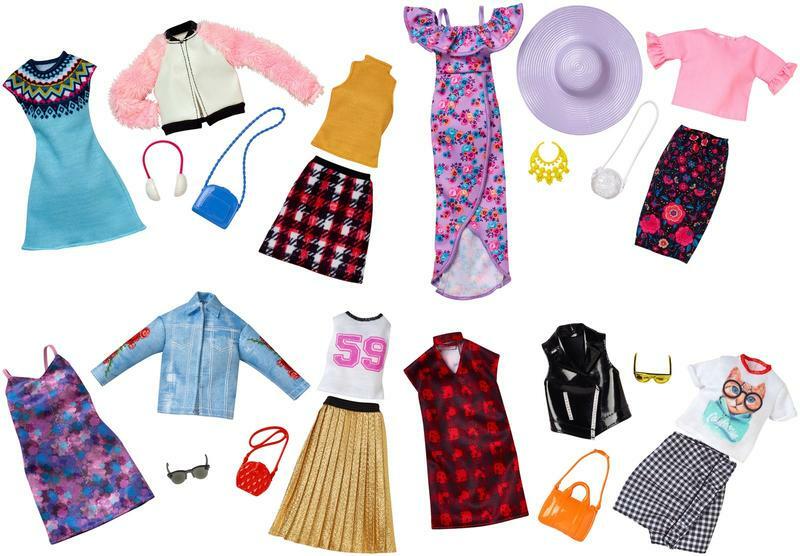 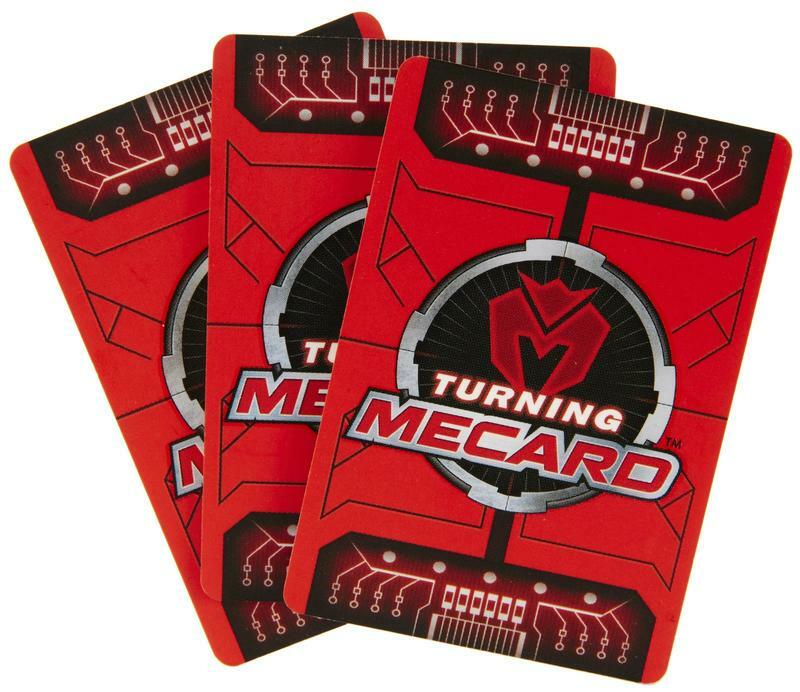 Mecard, known as Turning Mecard in hits home country of South Korea, is being brought to the U.S. by Mattel, and it definitely got our attention. 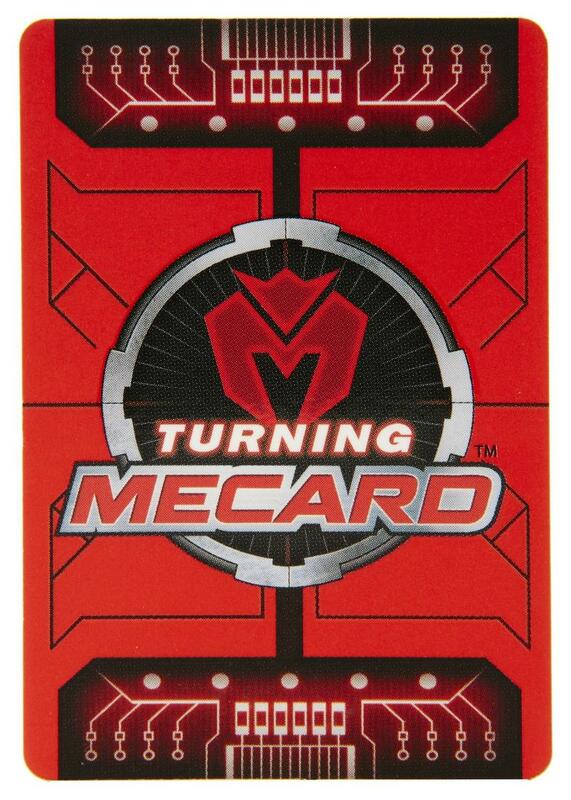 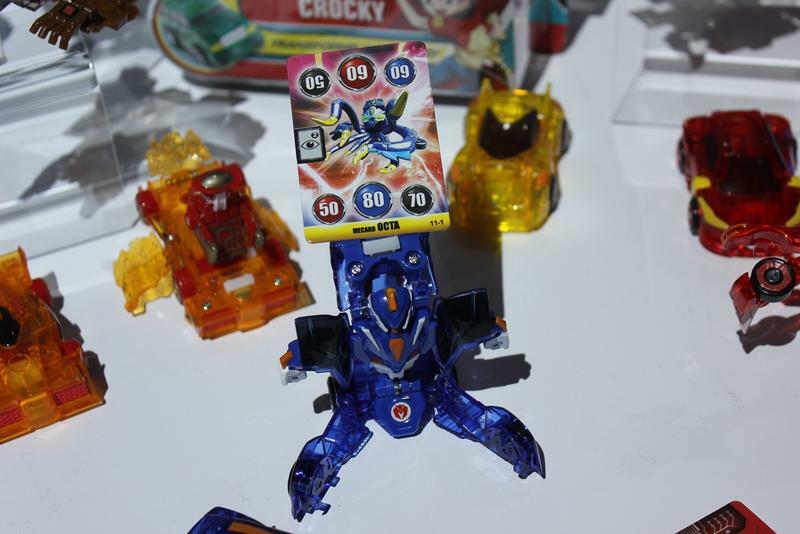 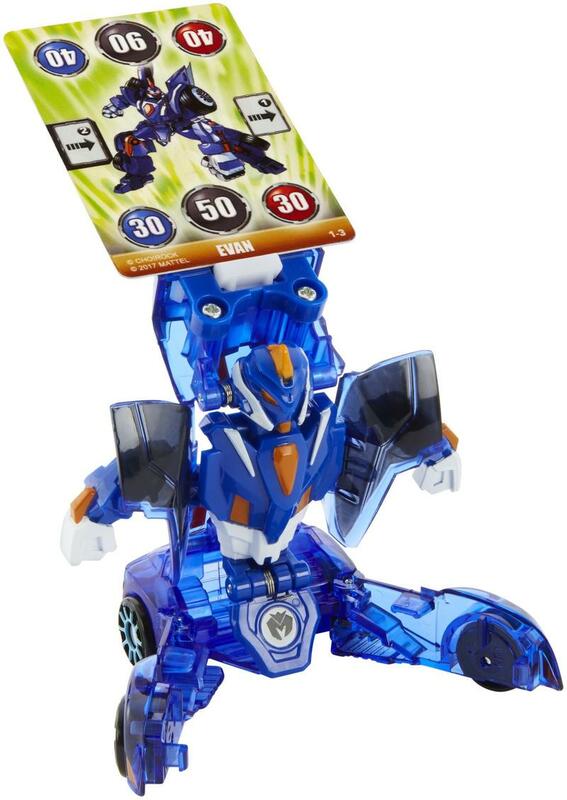 It’s part card game, part toy cars that when they roll over the card they turn into battling monsters. 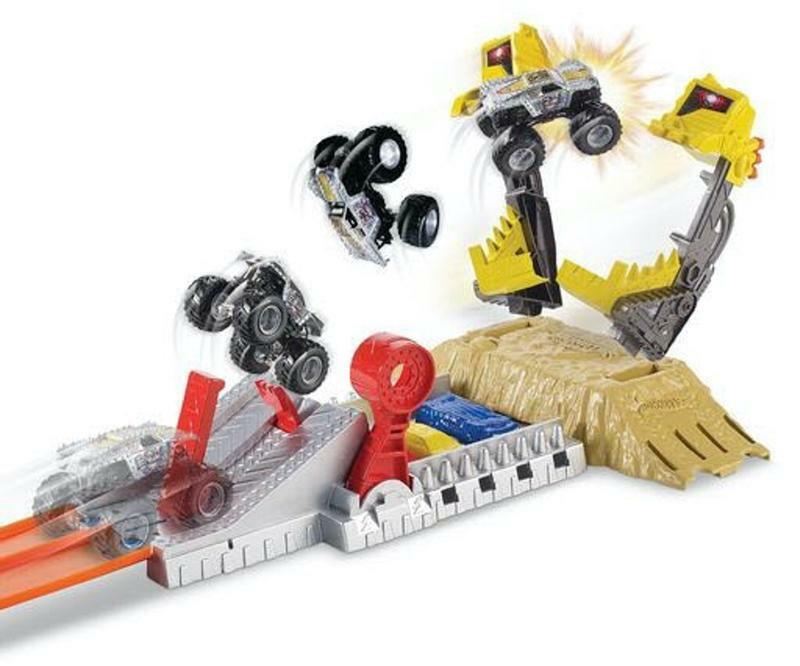 While maybe not the most original idea, it was impressive to watch them in action and see how well the feature actually works. 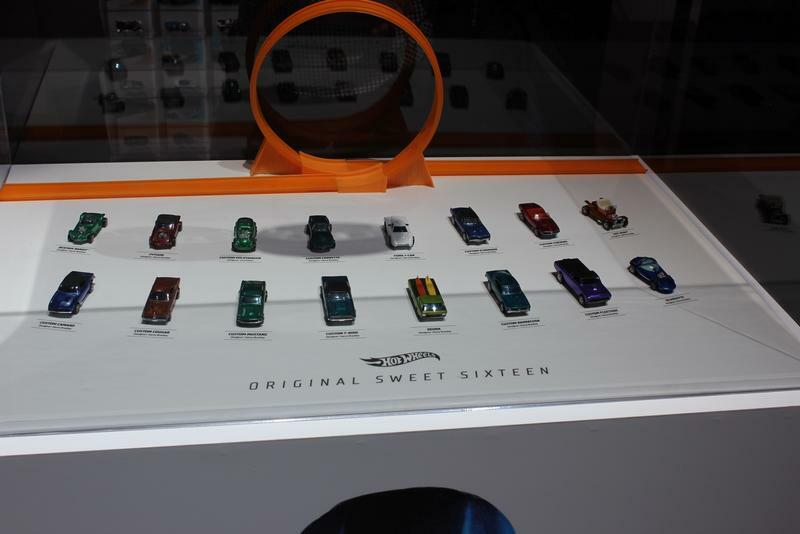 The cars will begin launching this spring with the bigger vehicles hitting in the fall. 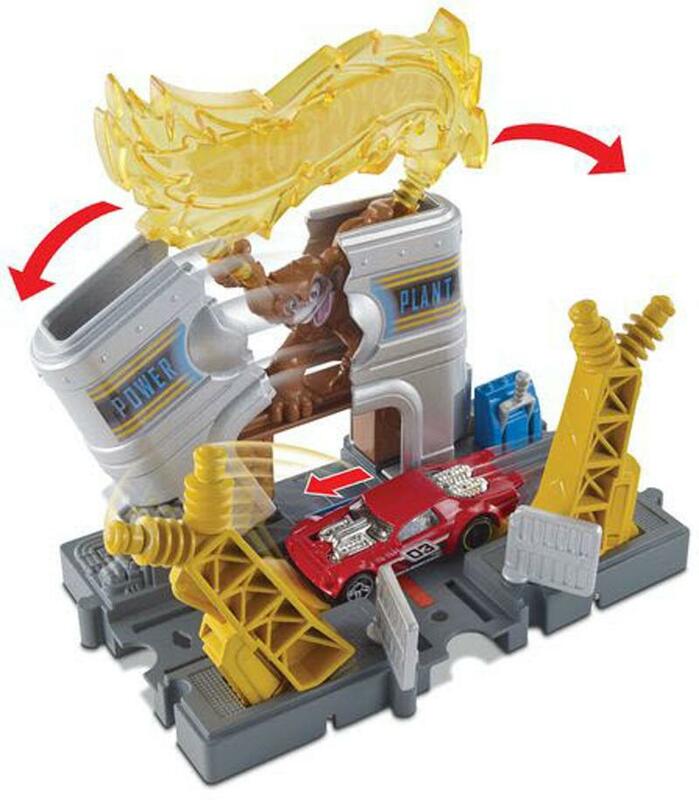 Here’s the first part of the first episode which Mattel is posting for free on YouTube. 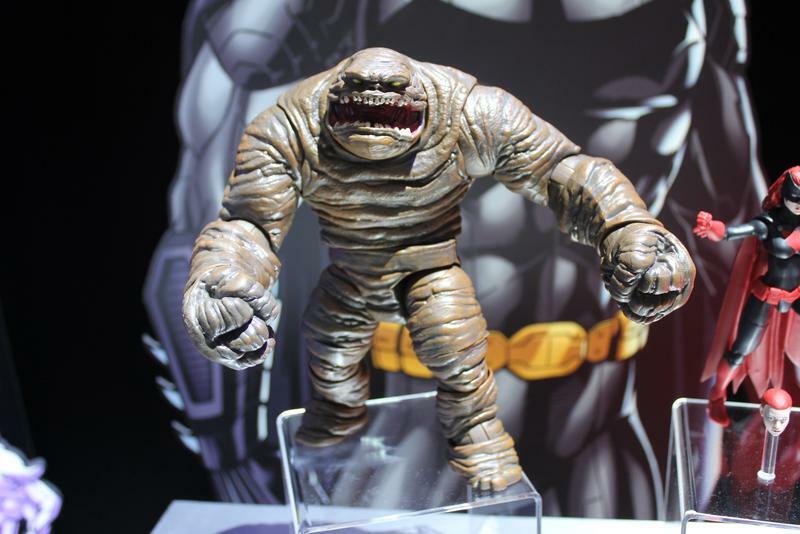 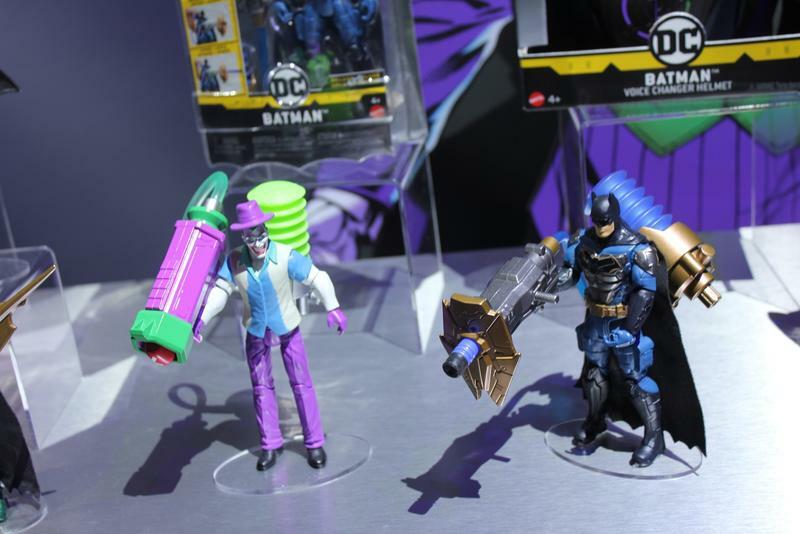 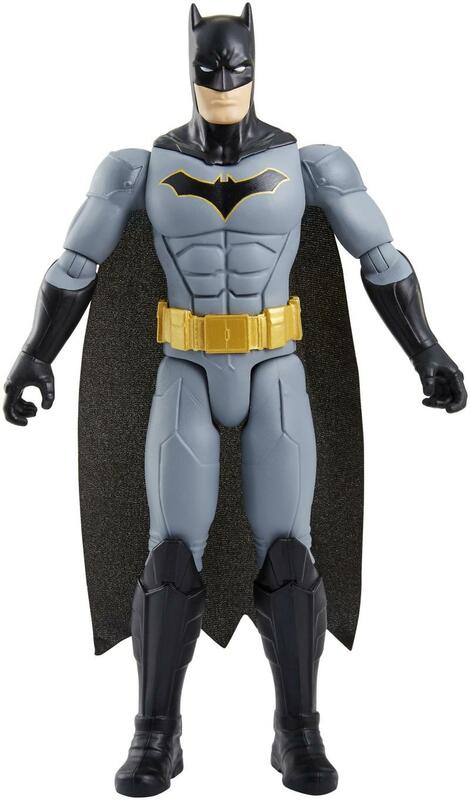 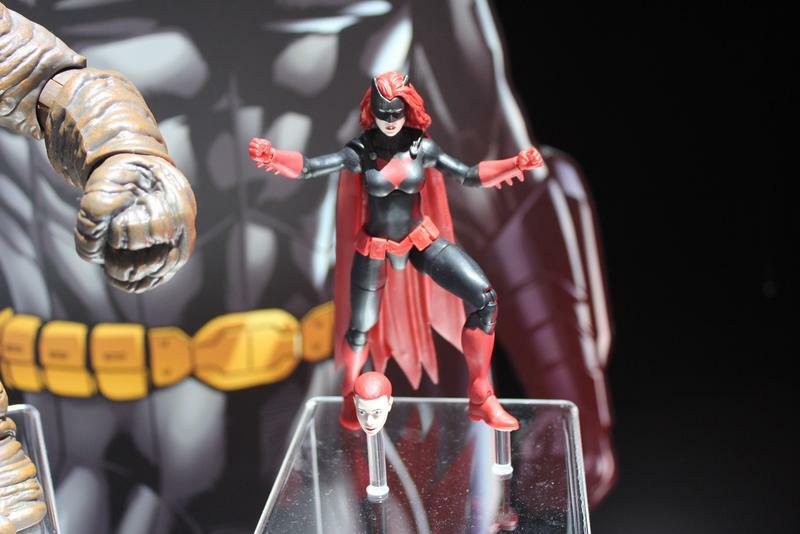 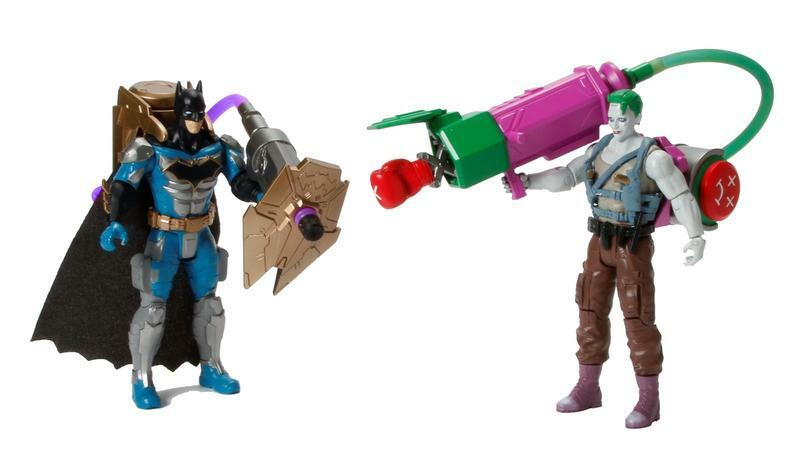 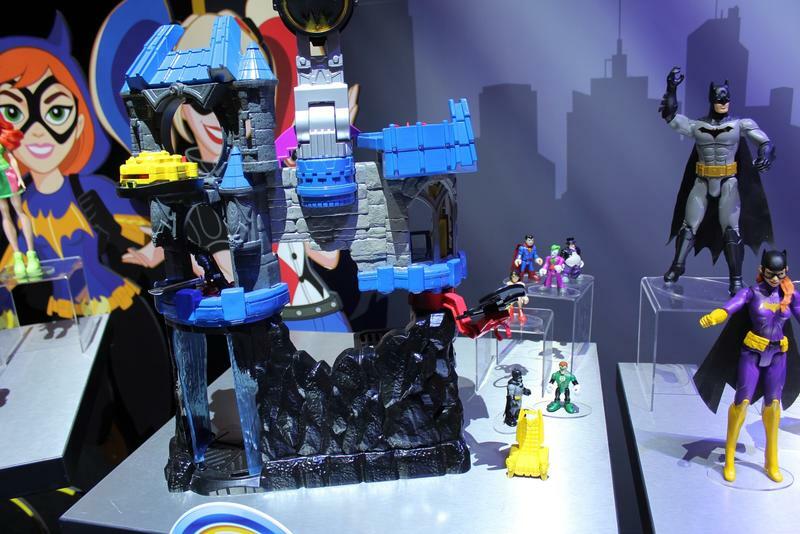 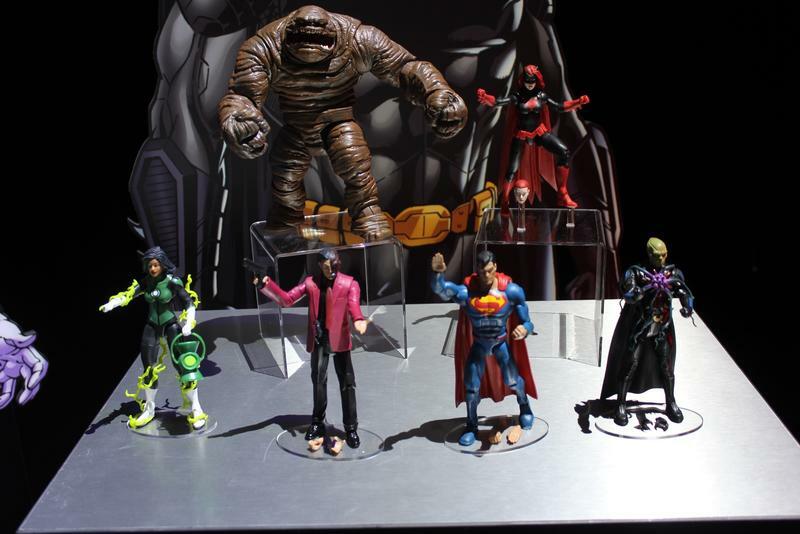 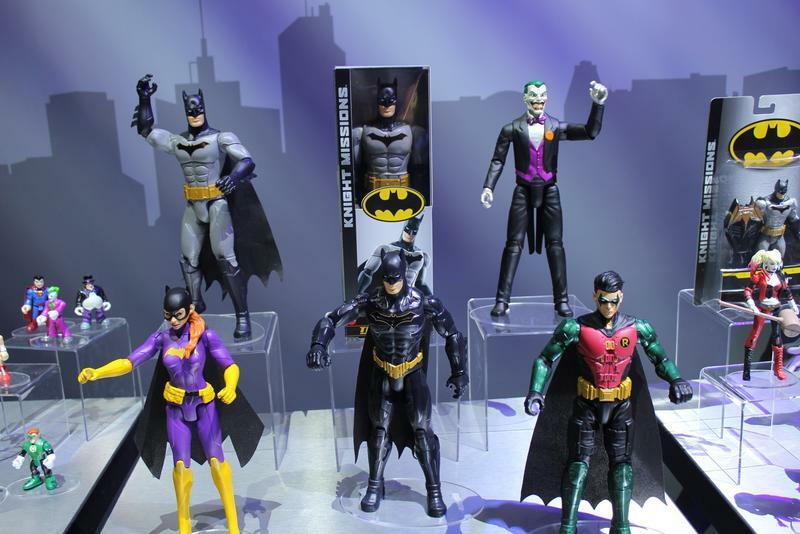 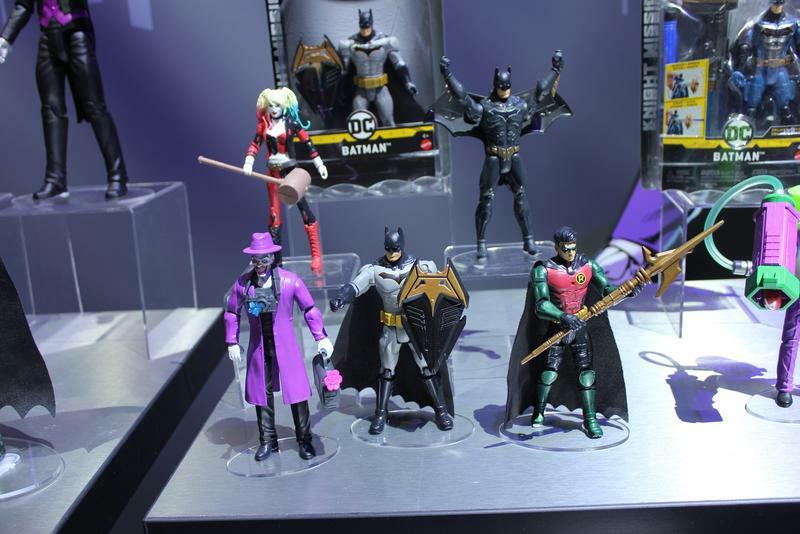 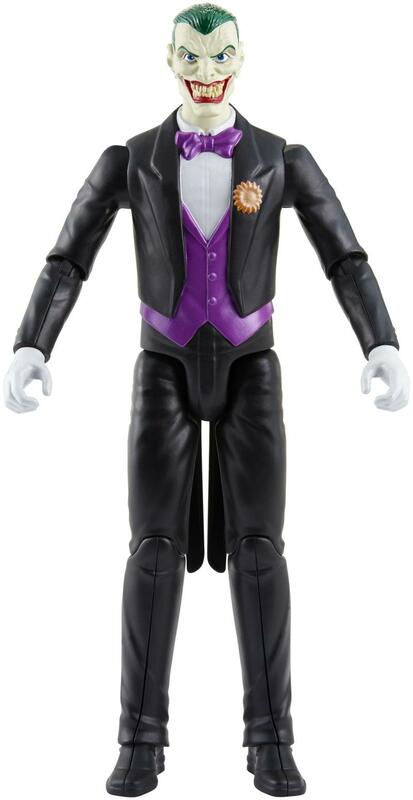 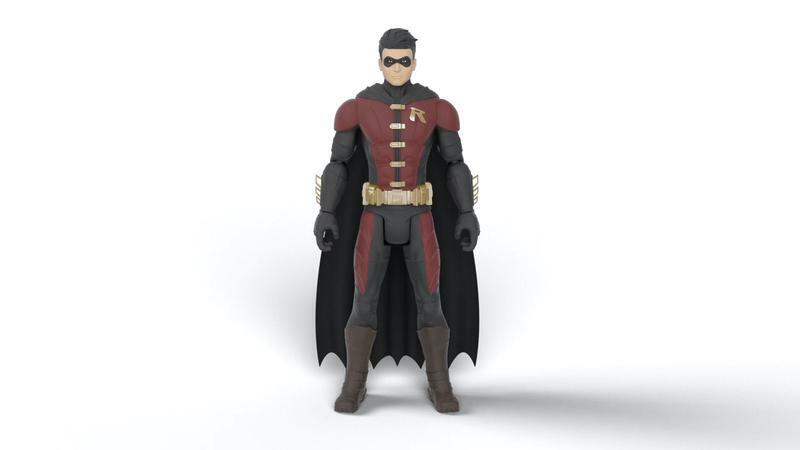 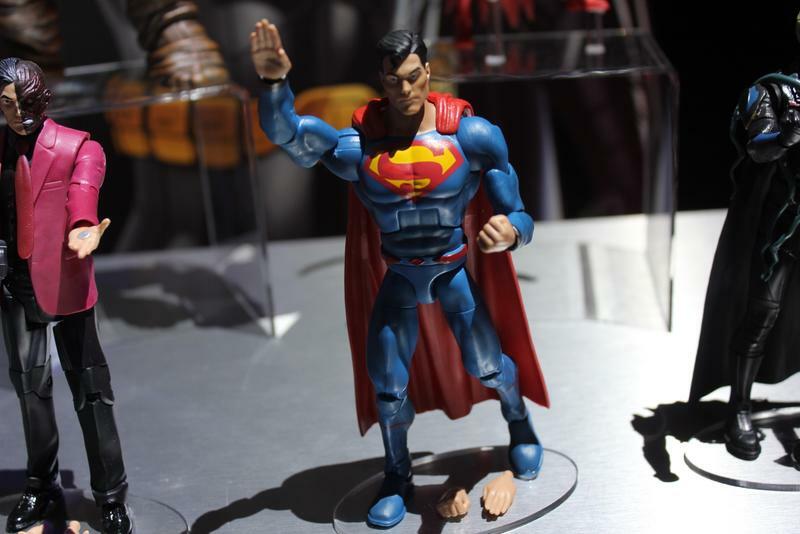 Batman will be receiving a new line of figures called Knight Missions that will focus on the caped crusader. 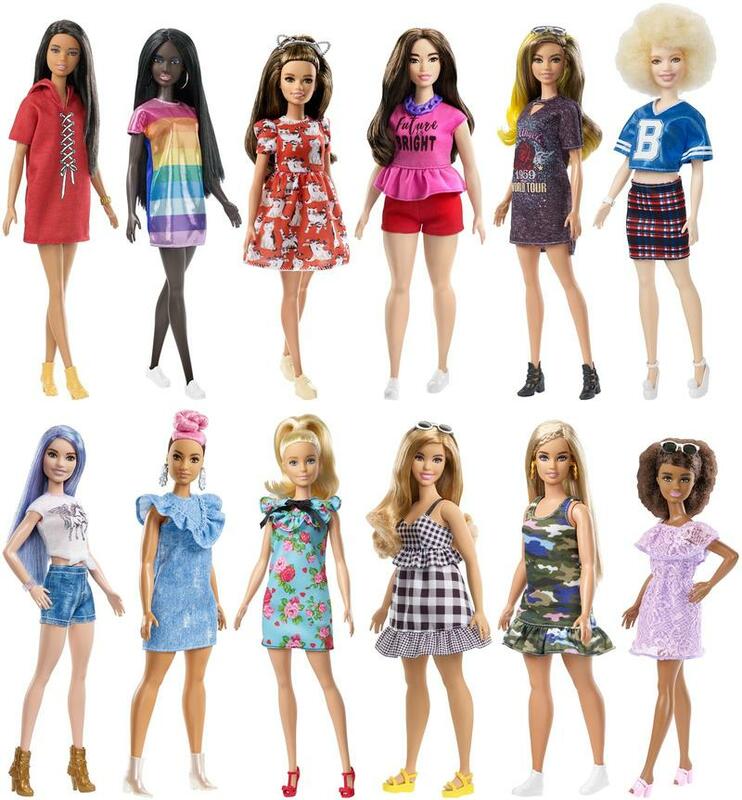 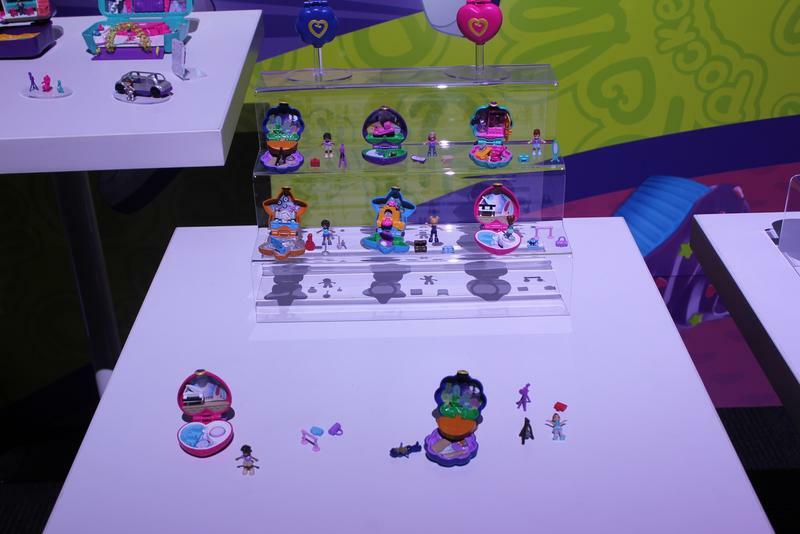 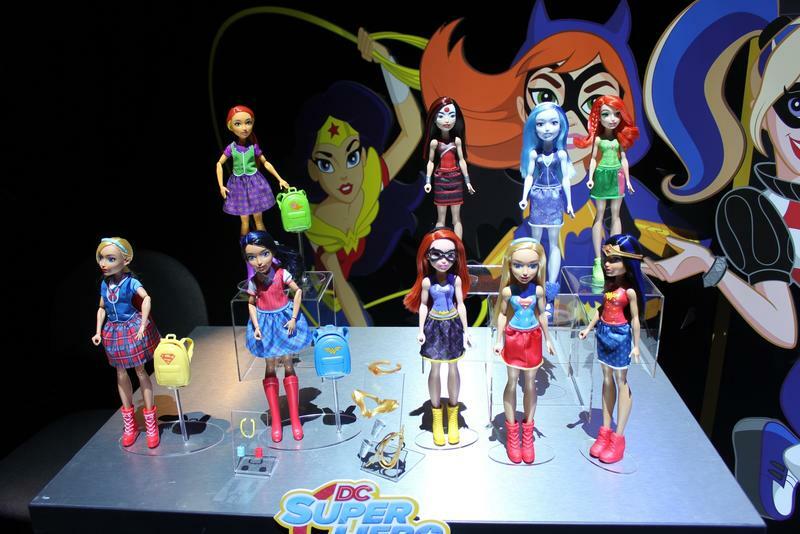 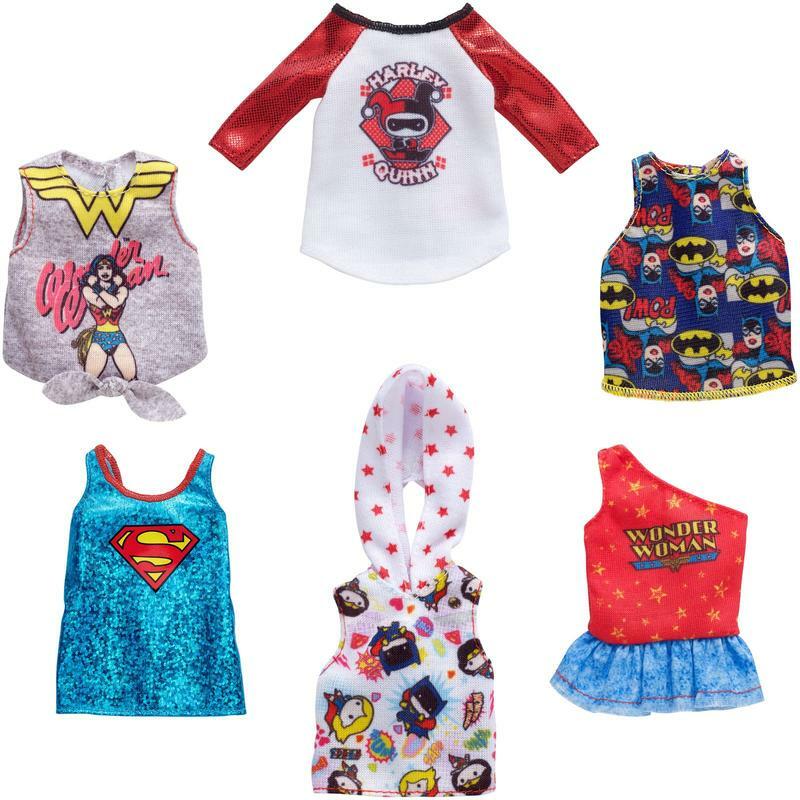 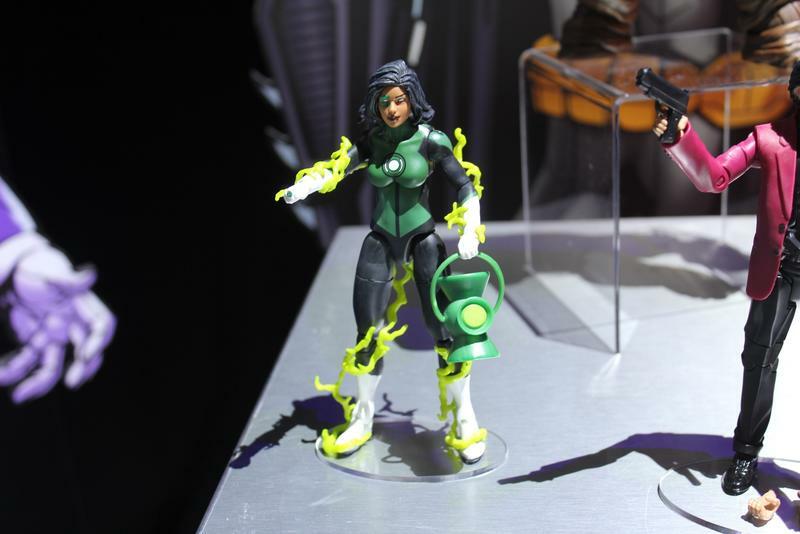 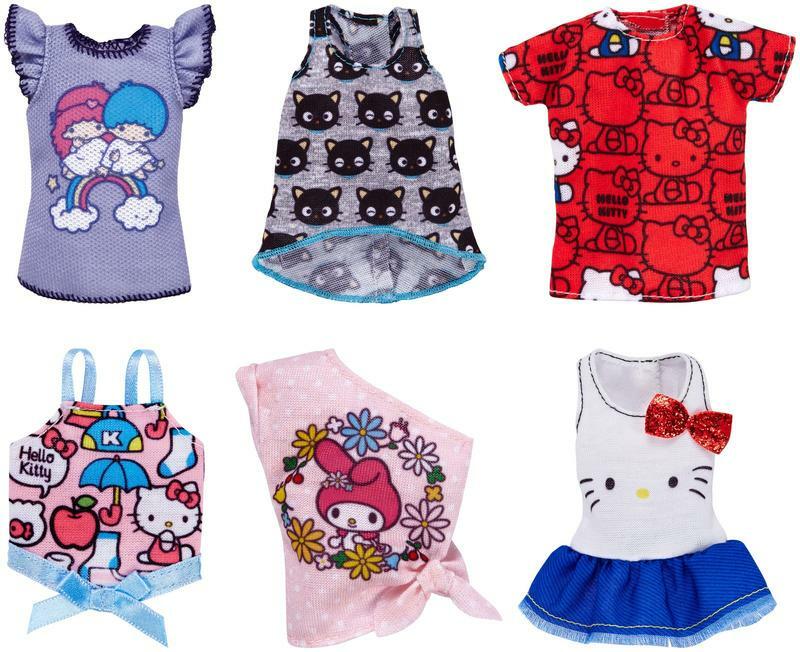 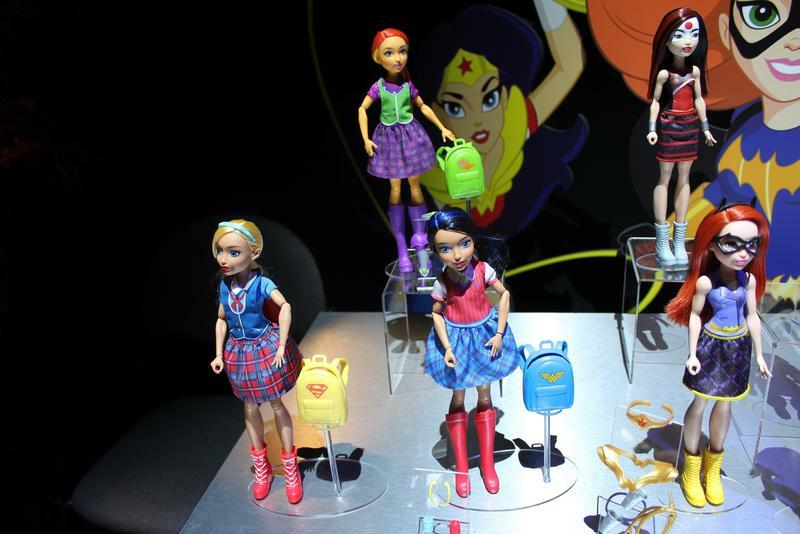 The Multiverse line will continue to grow as well, while the DC Super Hero Girls will receive some new outfits. 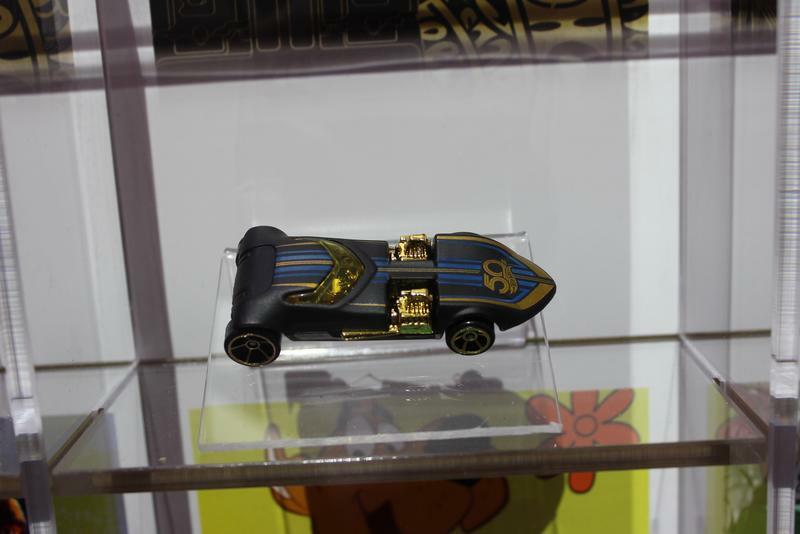 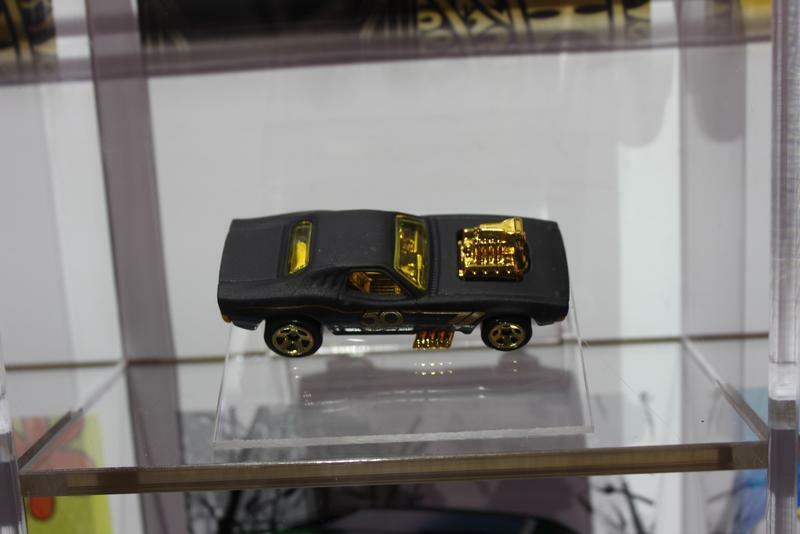 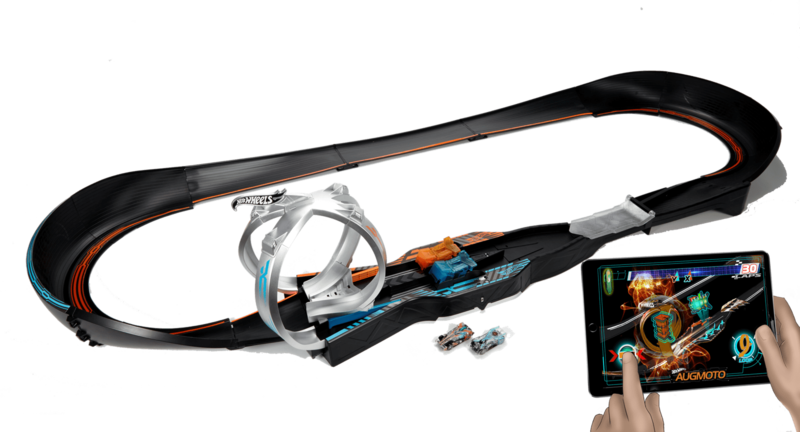 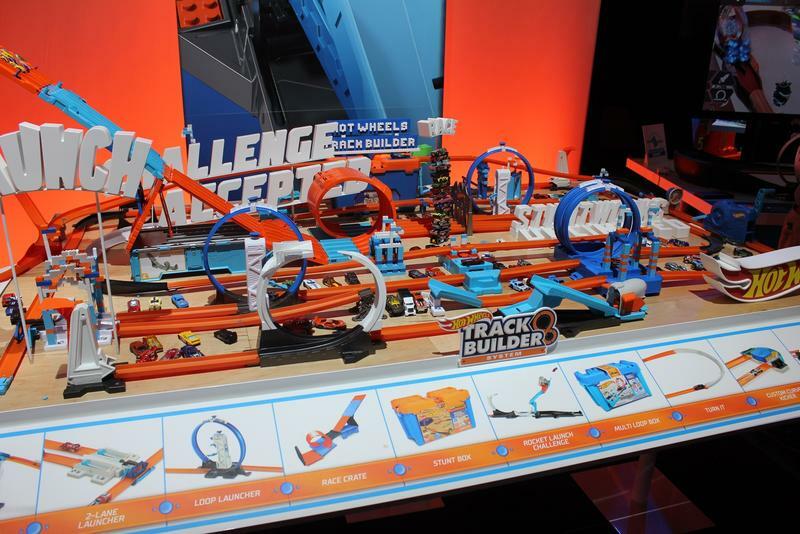 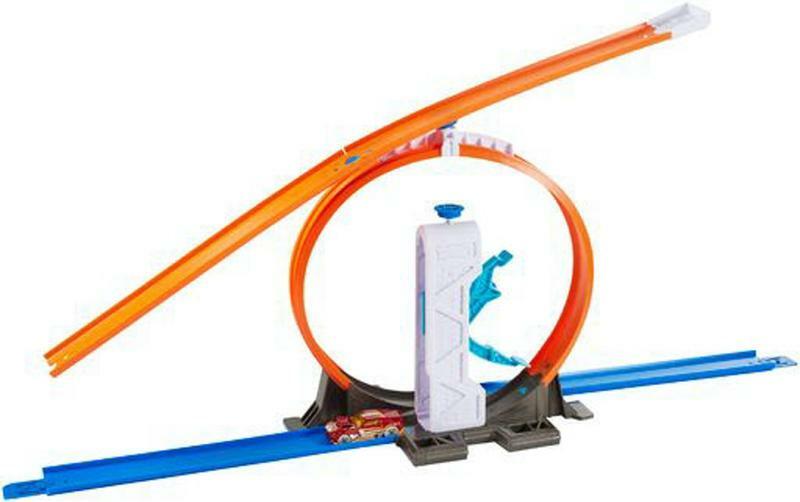 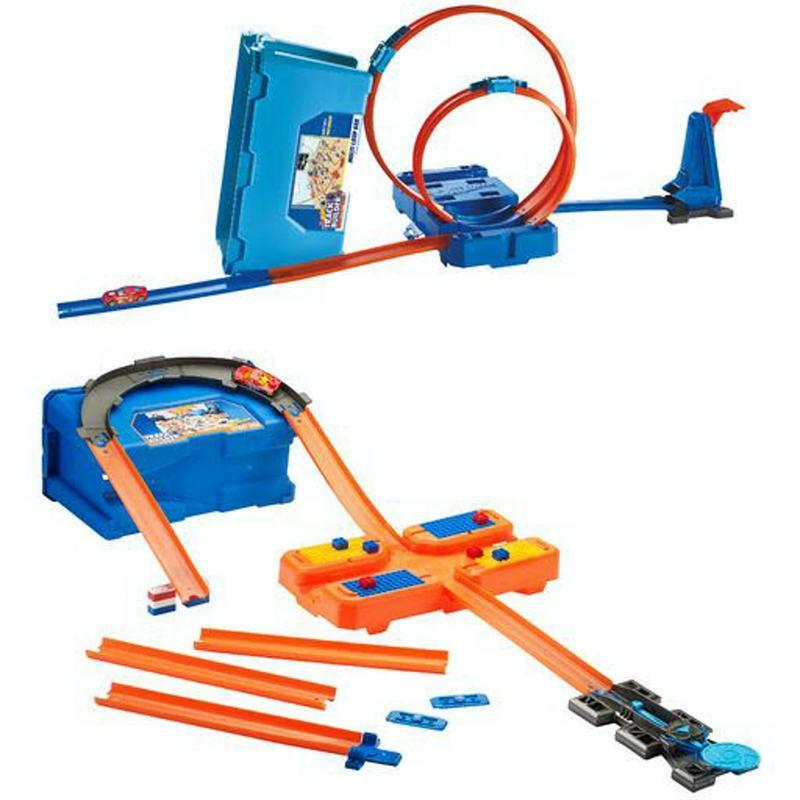 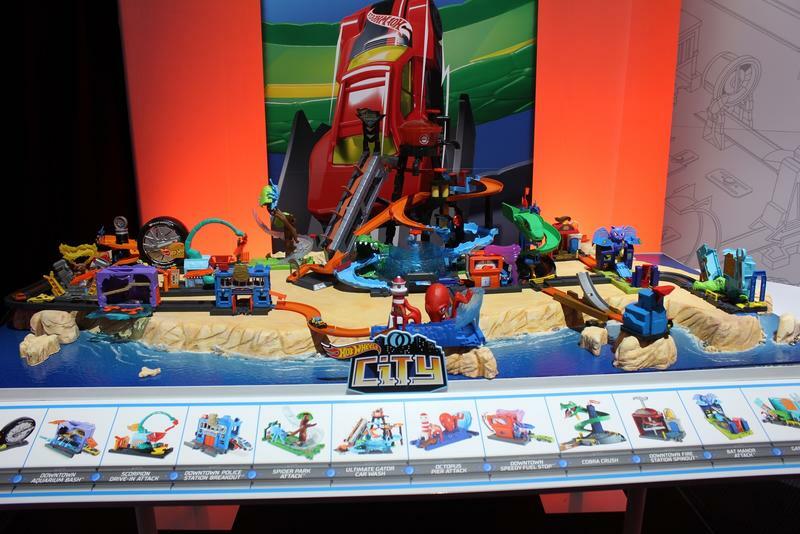 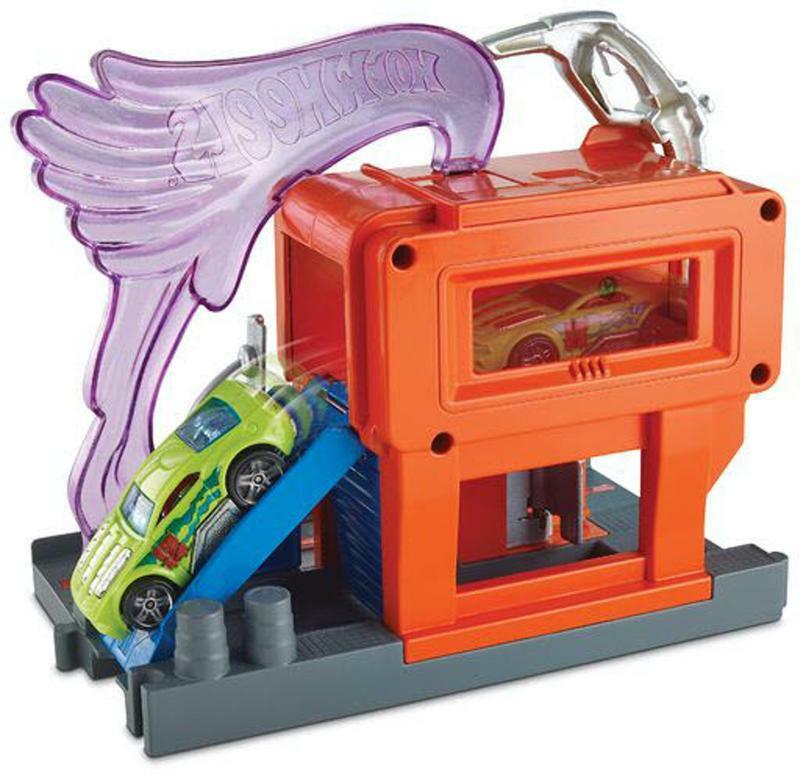 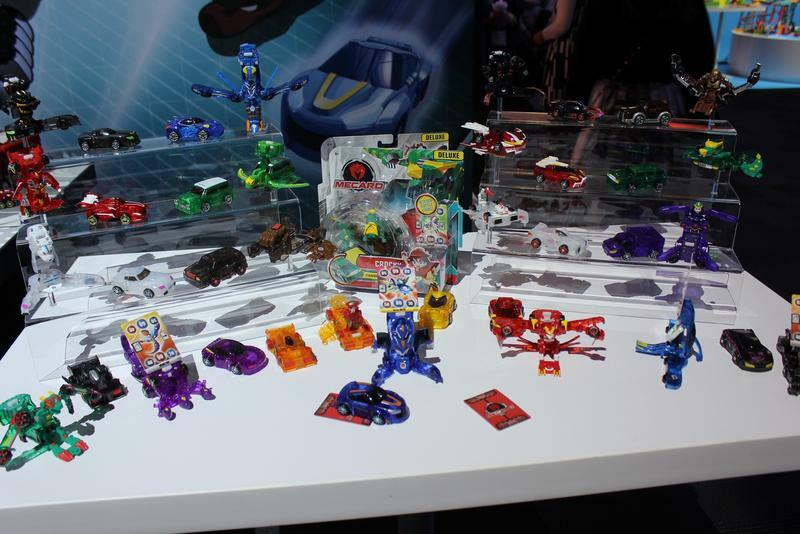 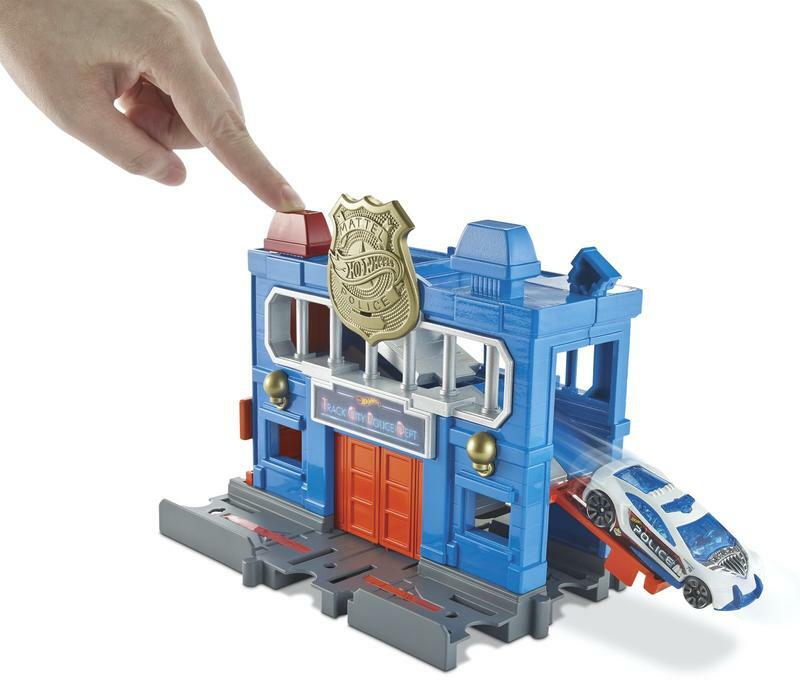 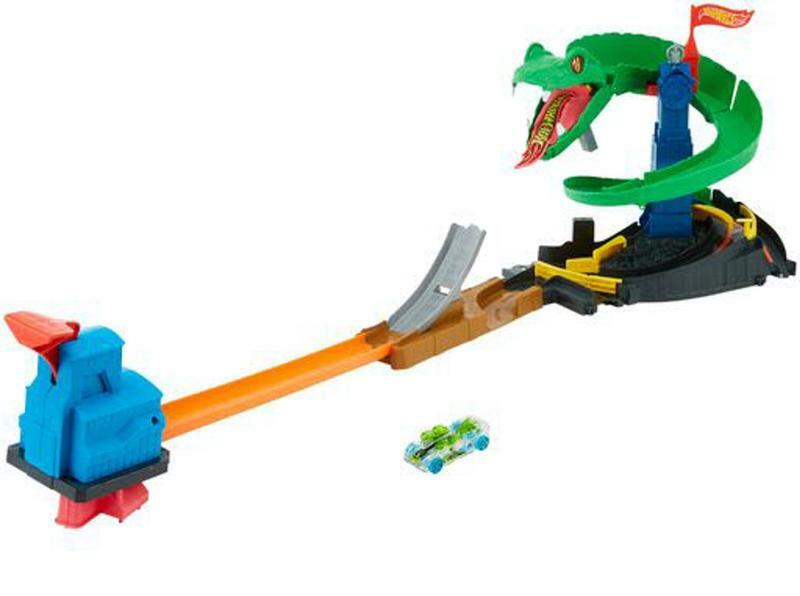 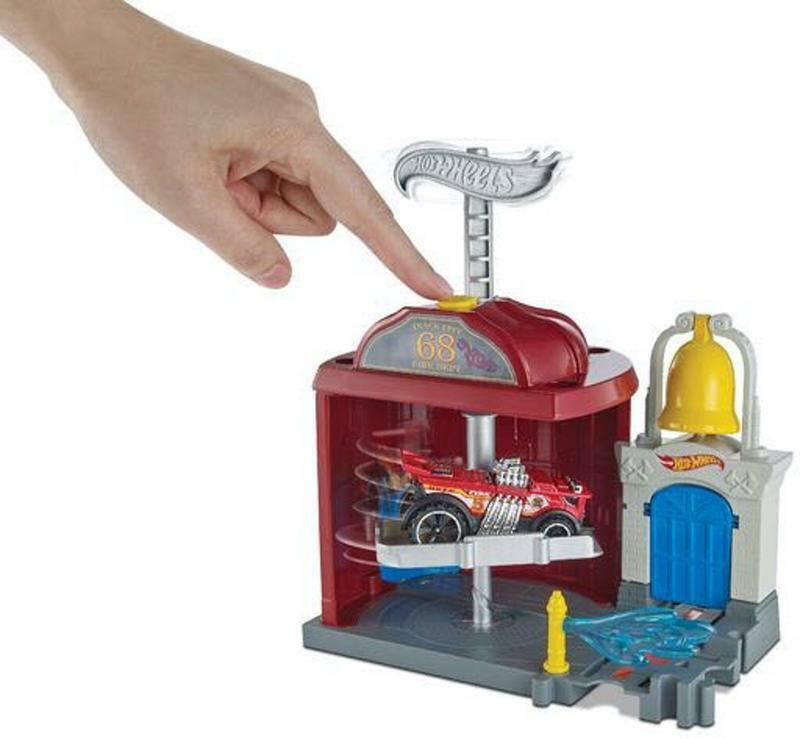 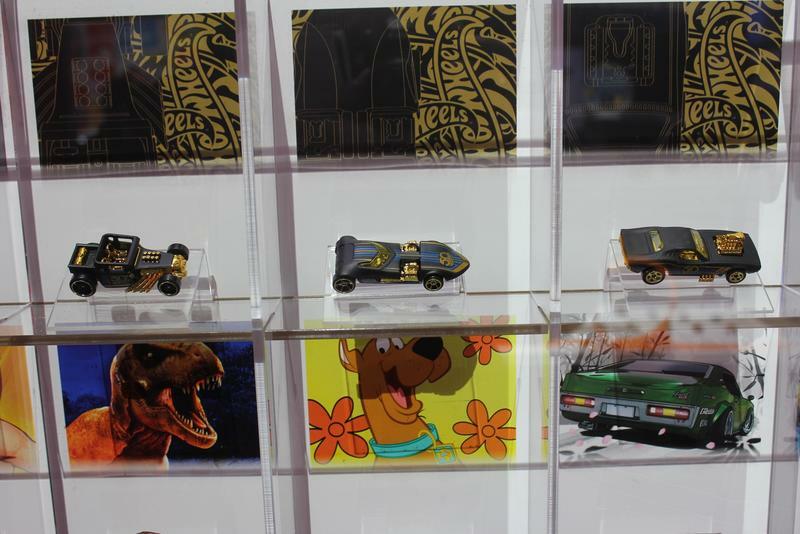 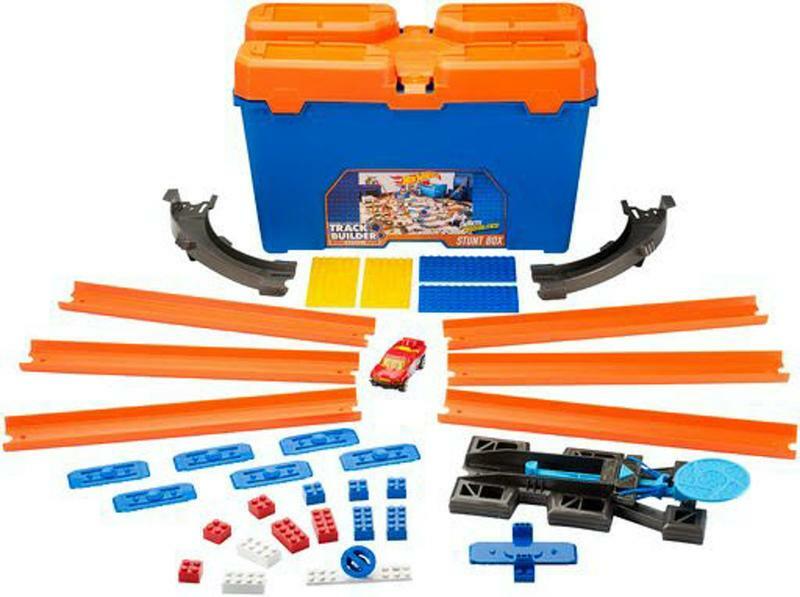 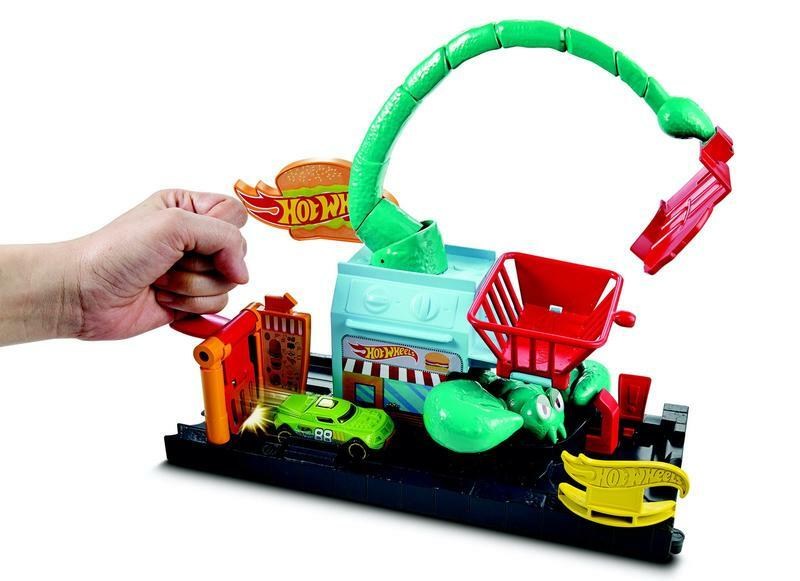 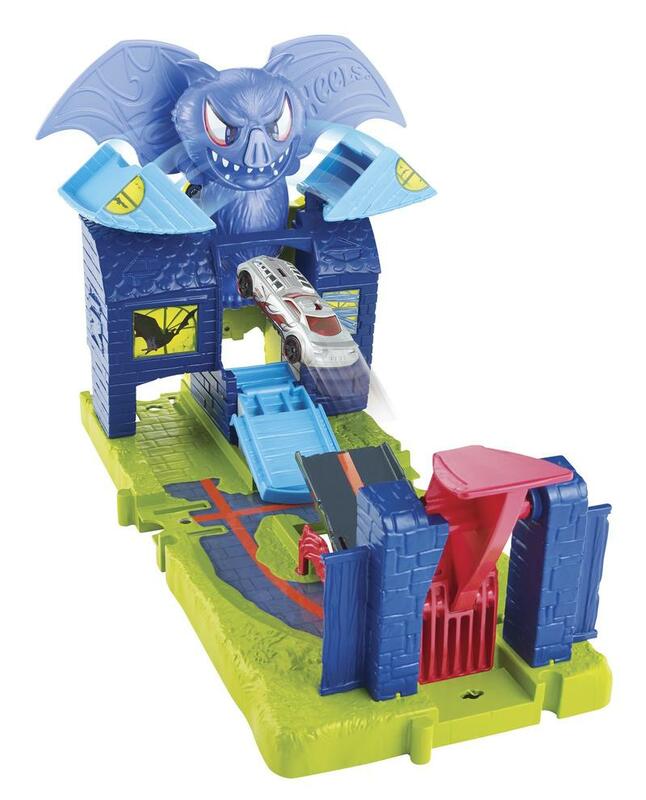 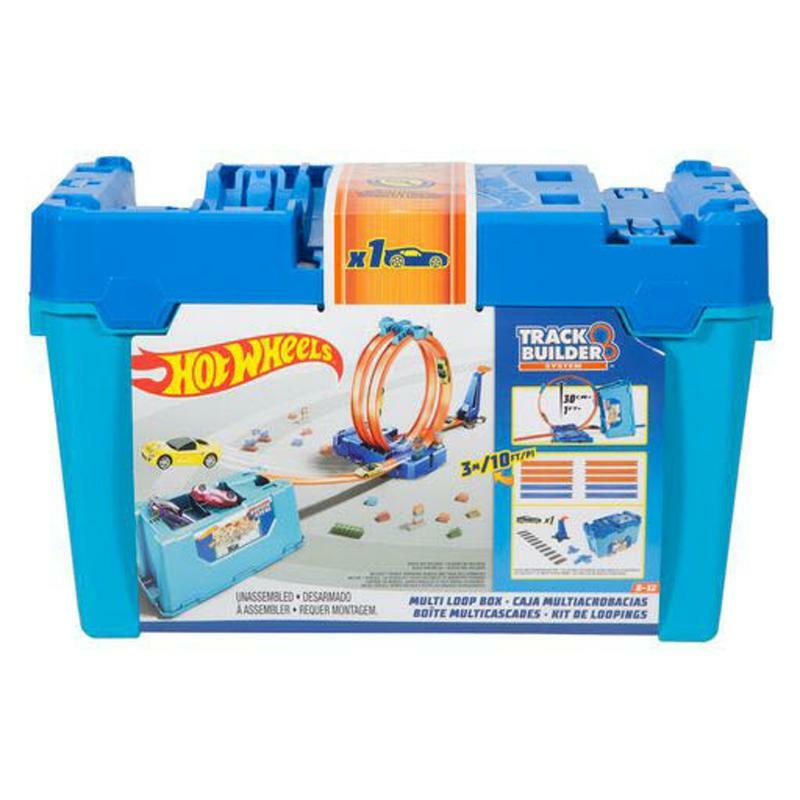 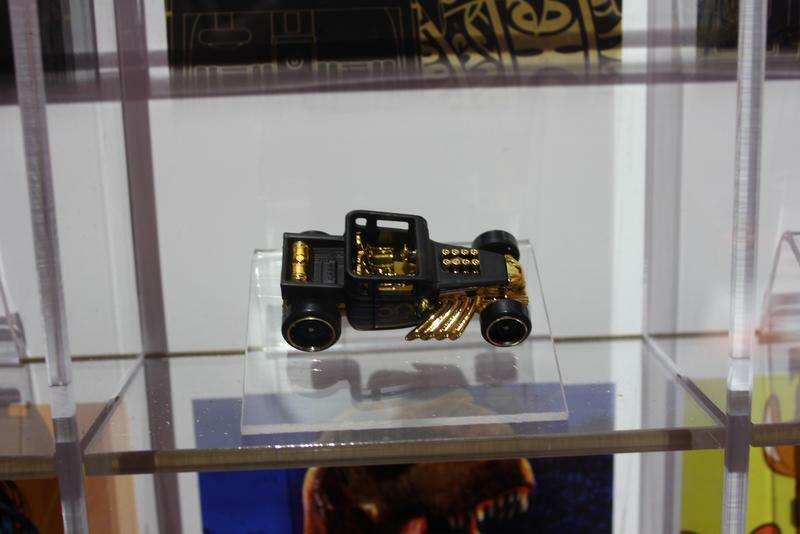 Hot Wheels is celebrating its 50th anniversary this year, and is focusing heavily on playsets and tracks. 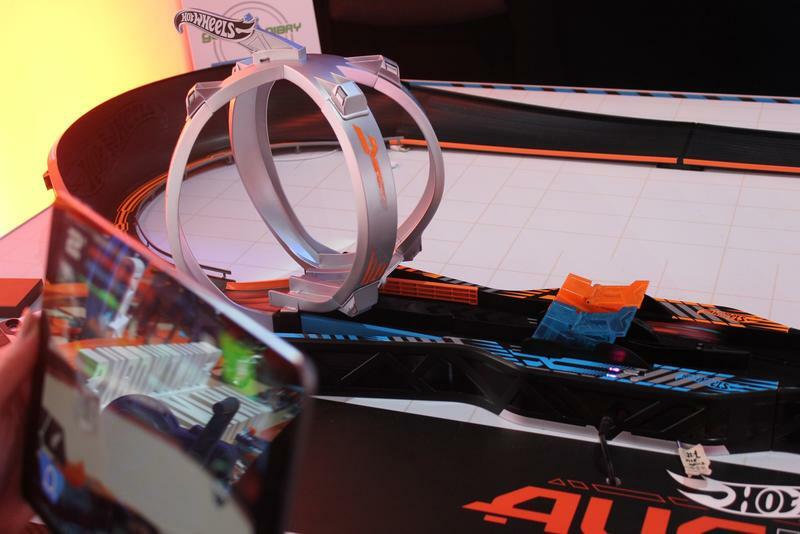 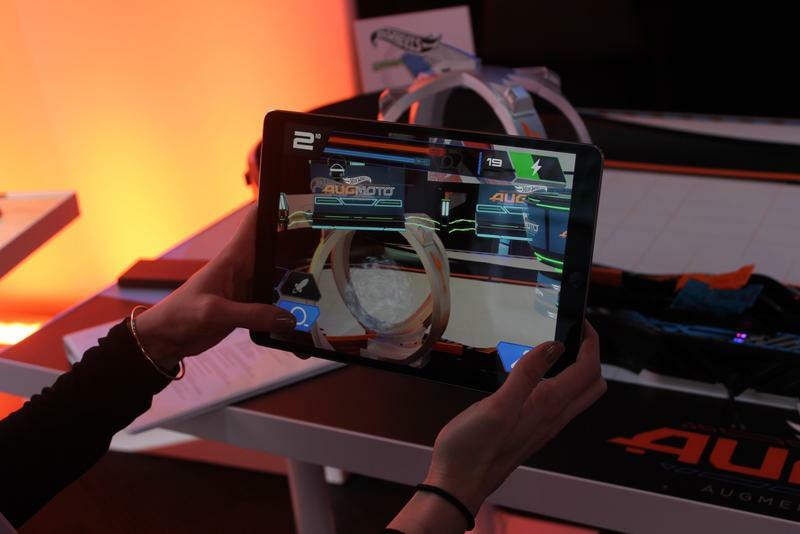 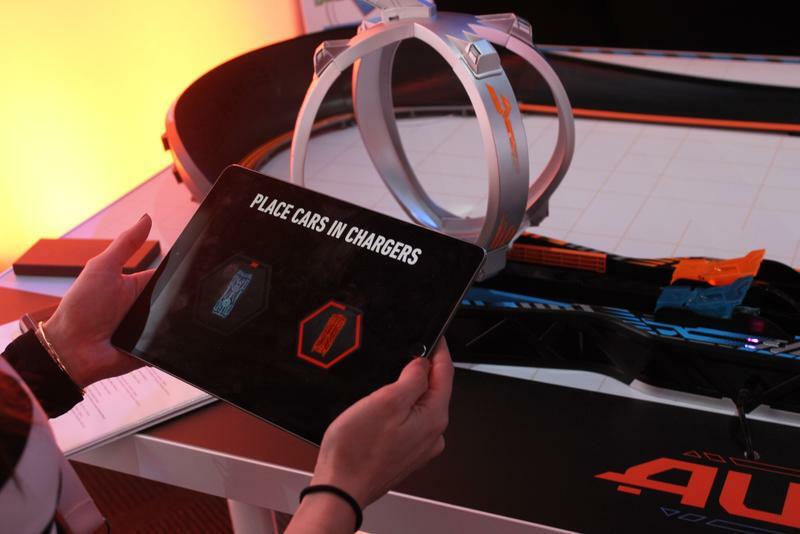 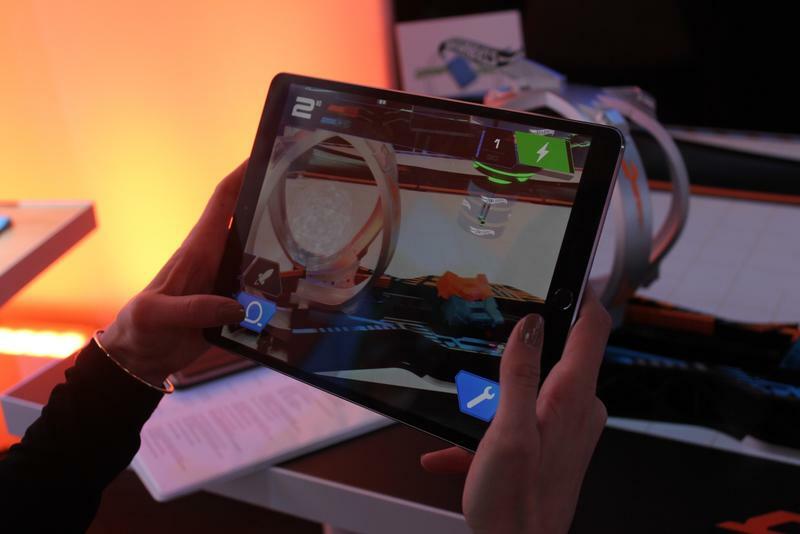 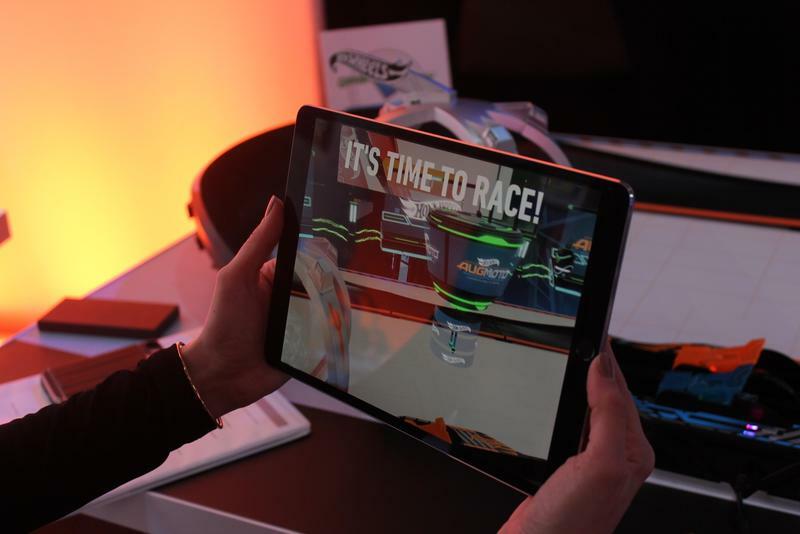 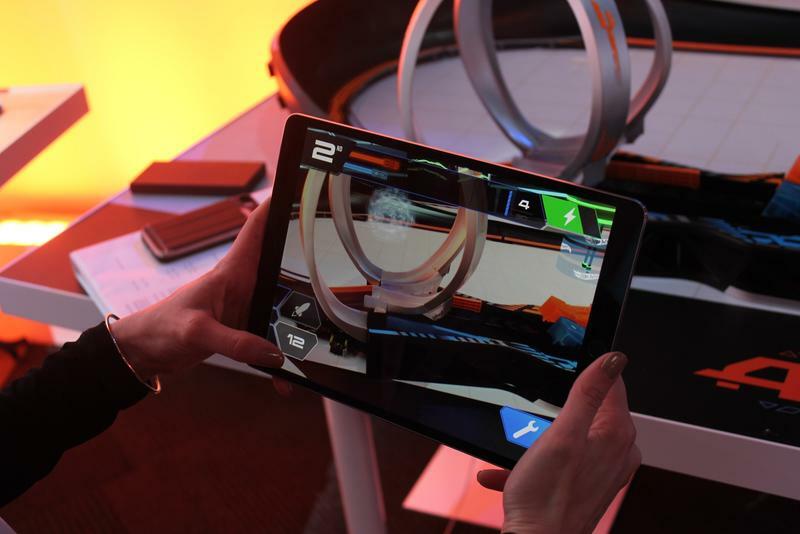 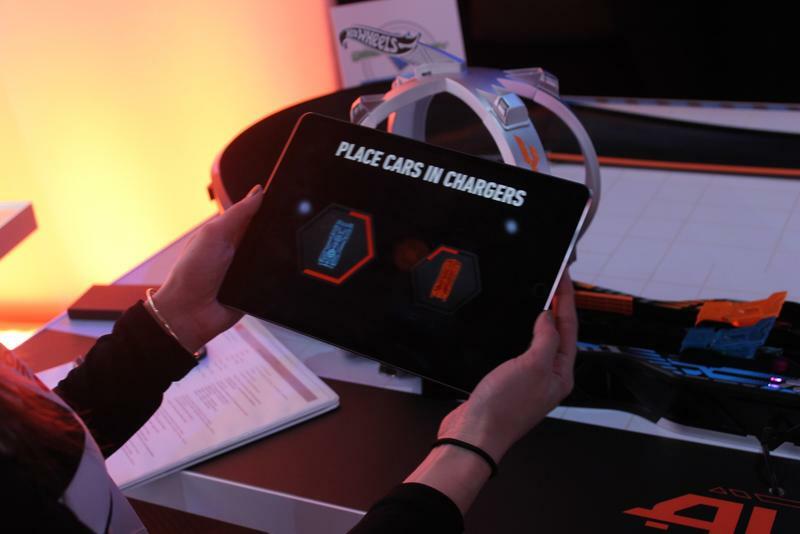 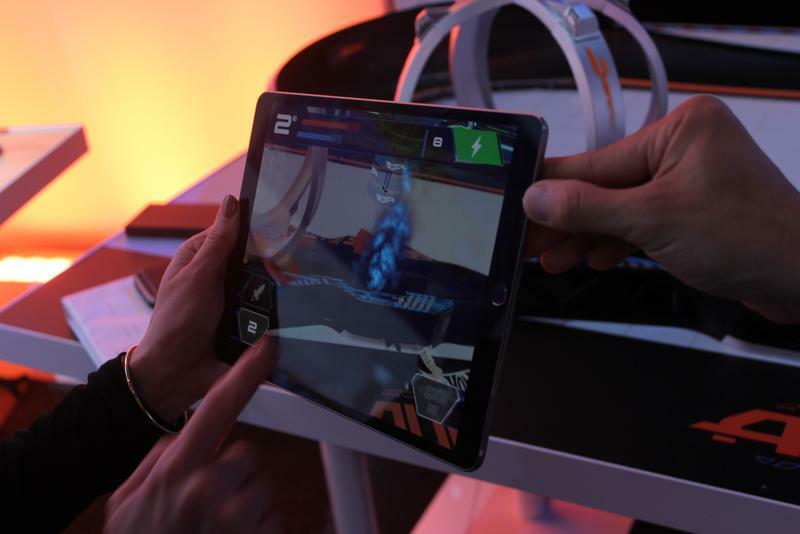 The new Hot Wheels Augmoto mixes virtual reality and car racing as two cars zoom around the track earning weapons and countermeasures, but watch out for damage as it may stop you int he pits until you can use your finger to put out the virtual fire. 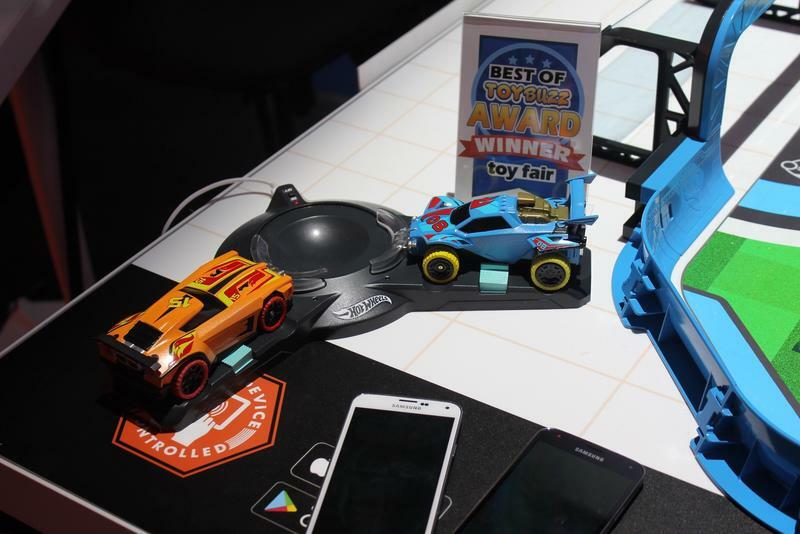 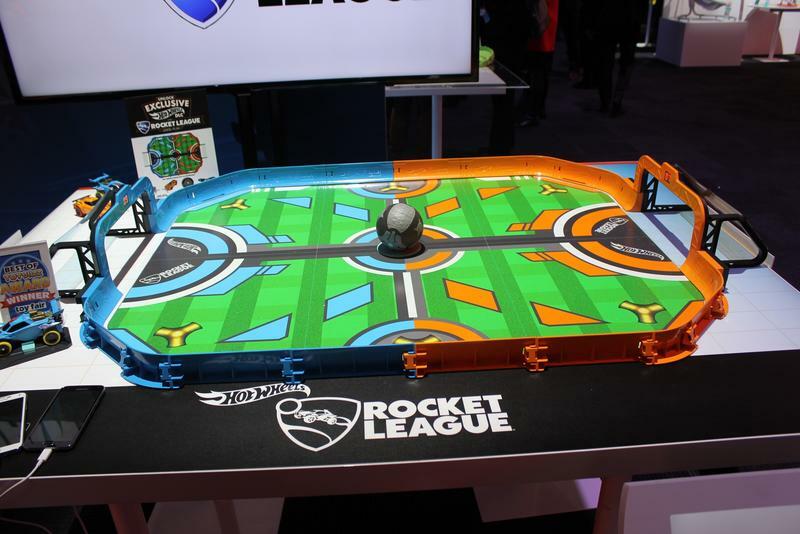 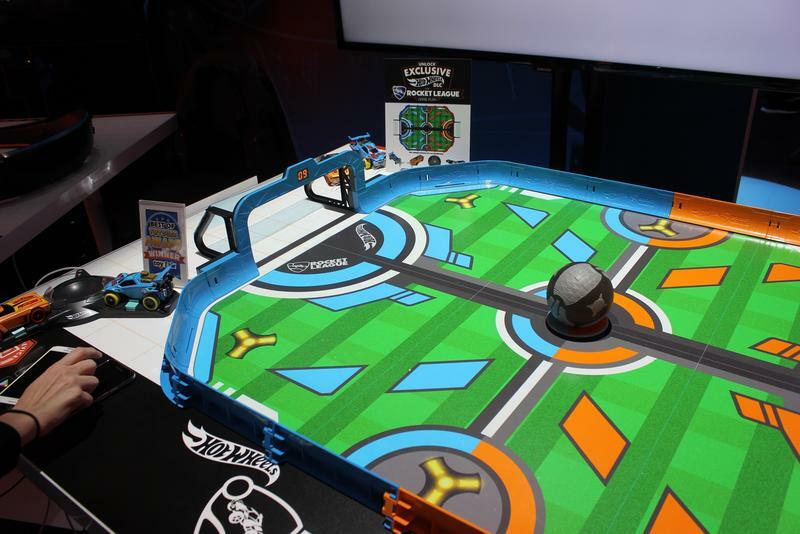 And, of course, the Hot Wheels Rocket League RC set will be a hit as you can play a real-world version of everyone’s favorite video racing game. 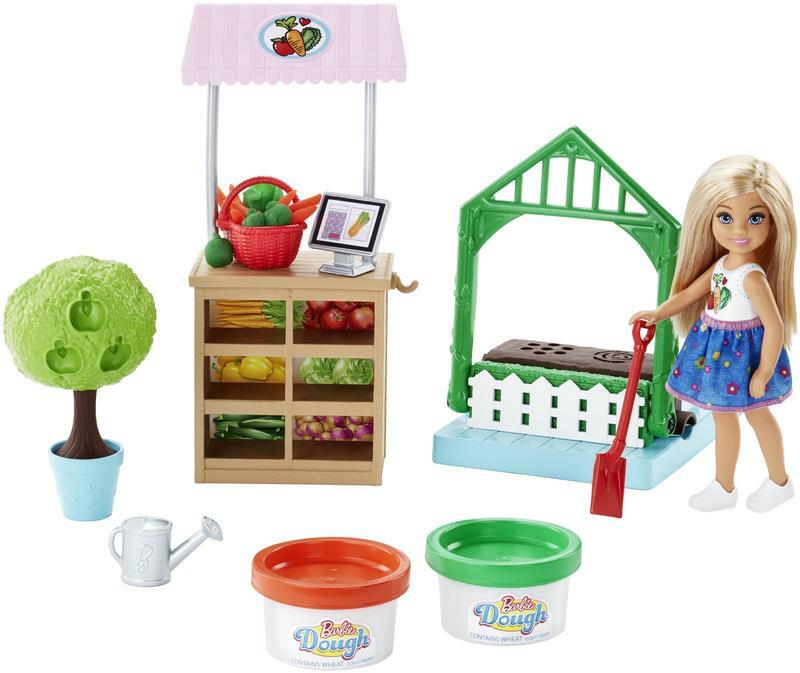 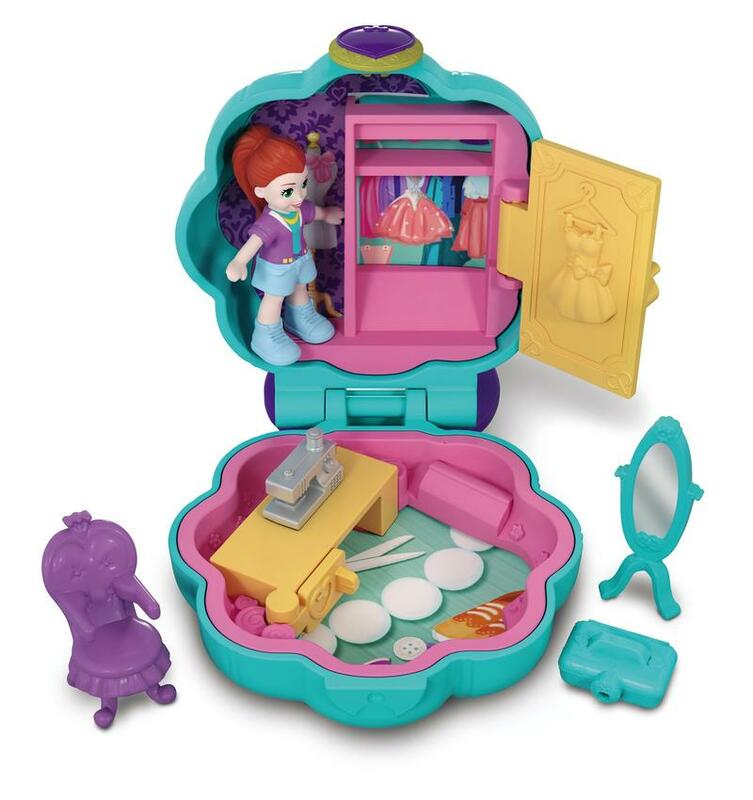 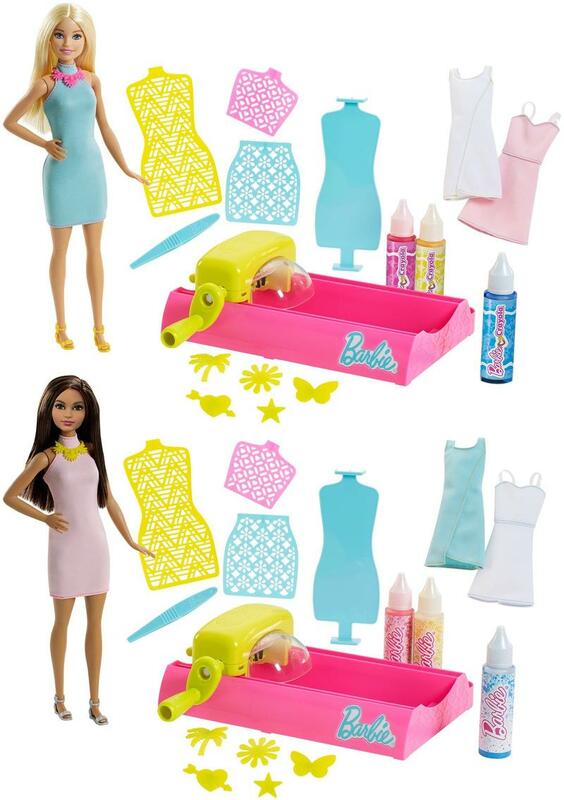 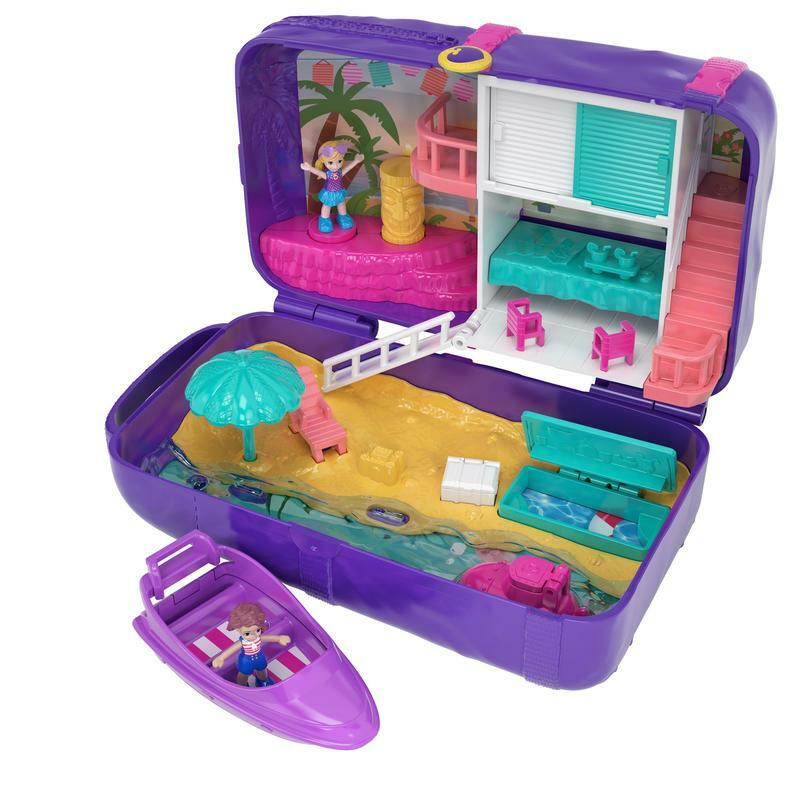 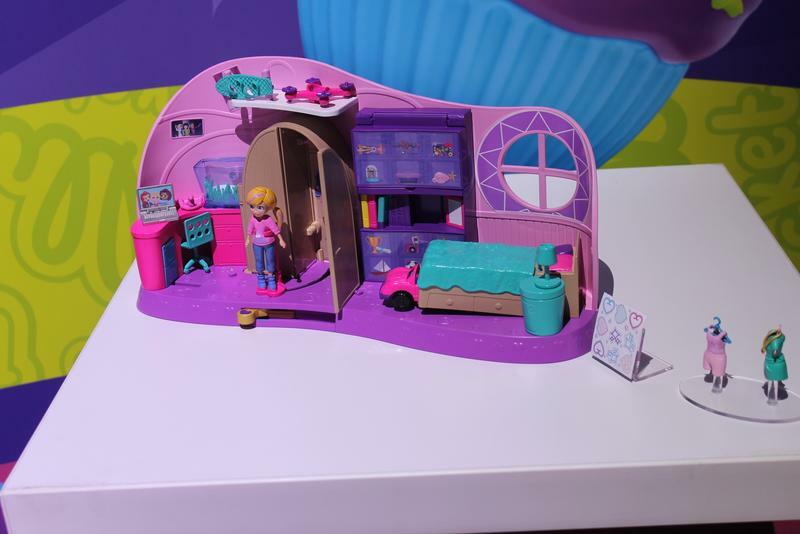 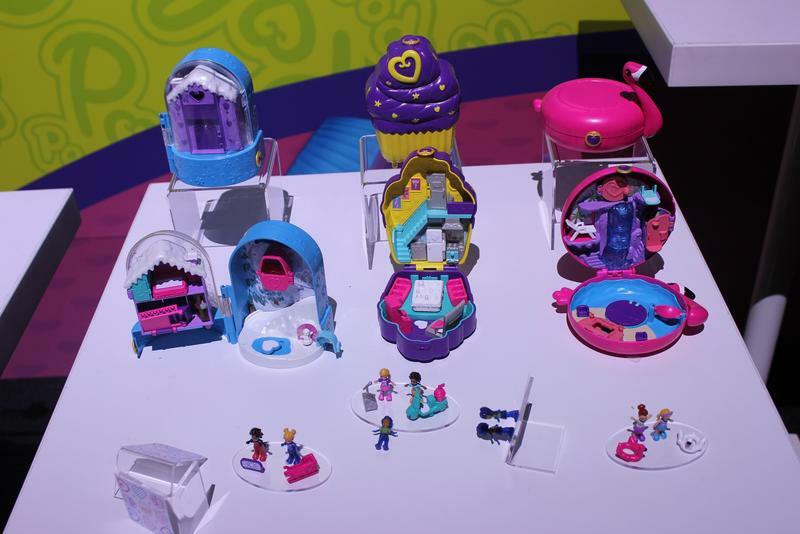 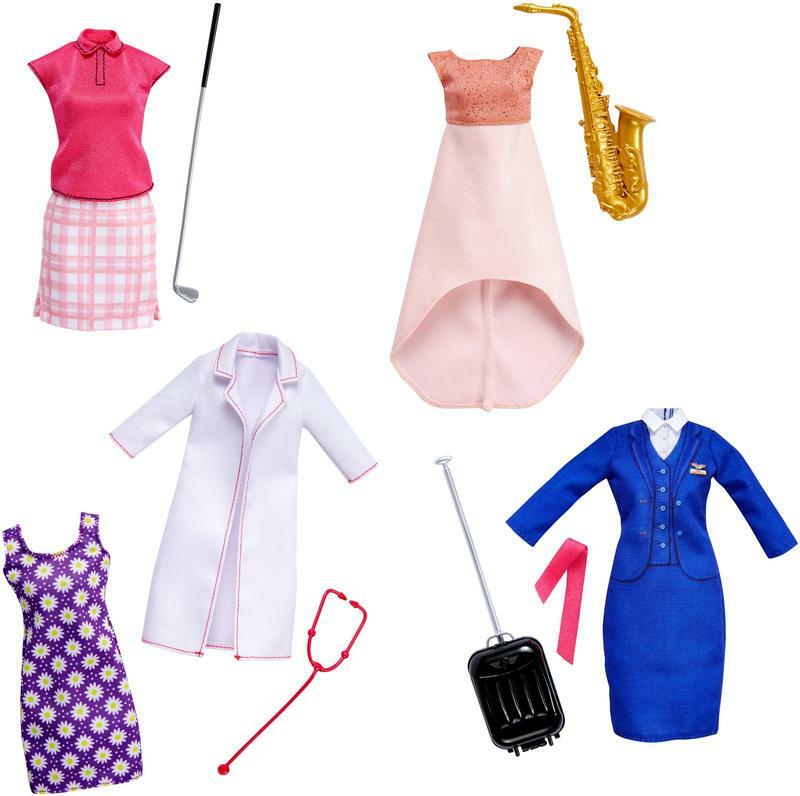 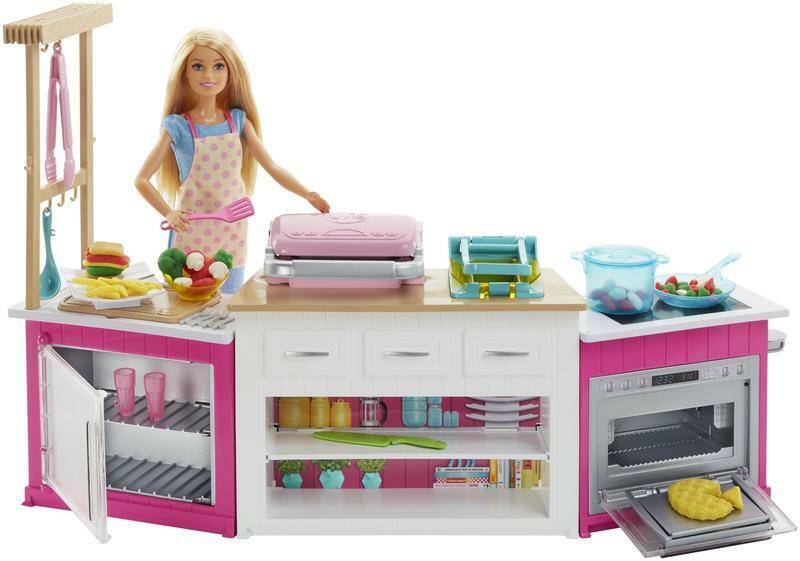 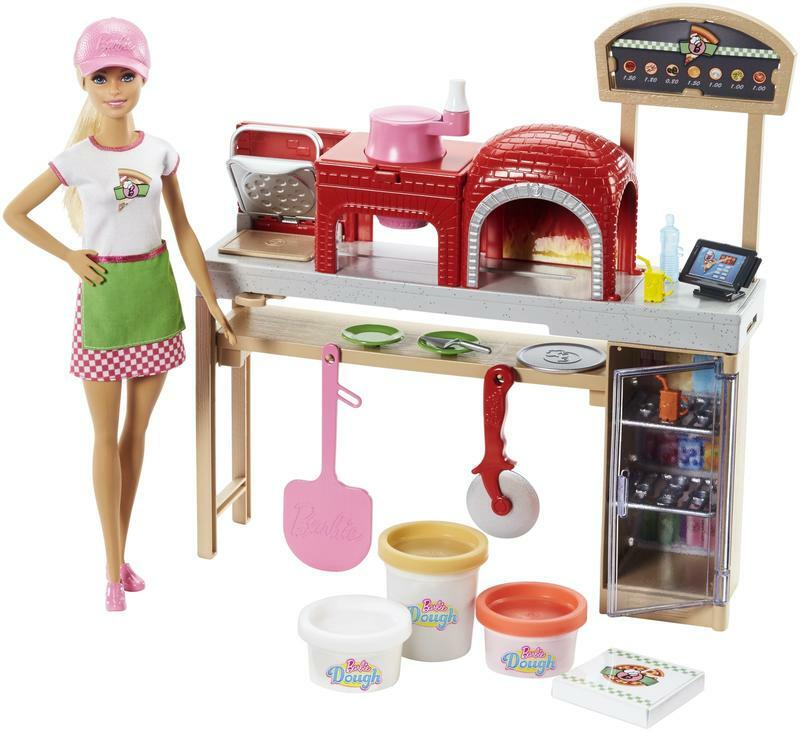 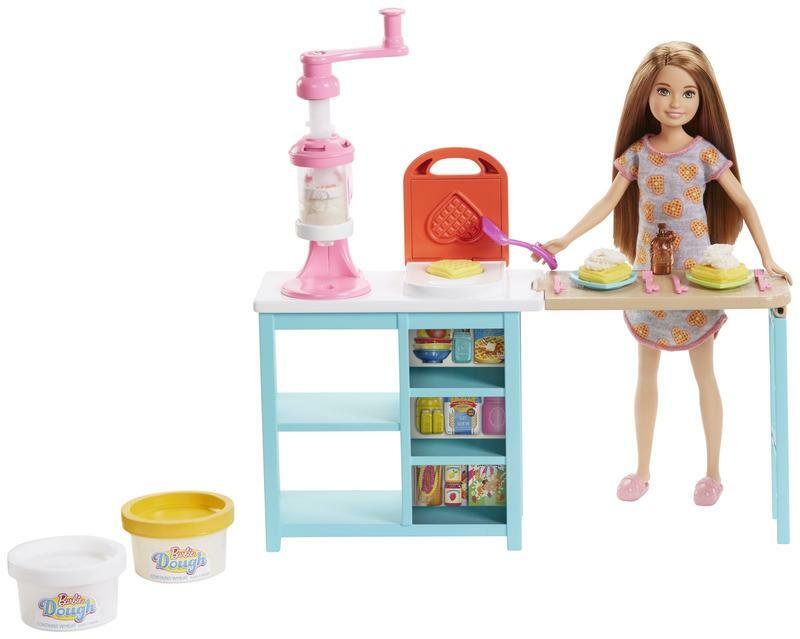 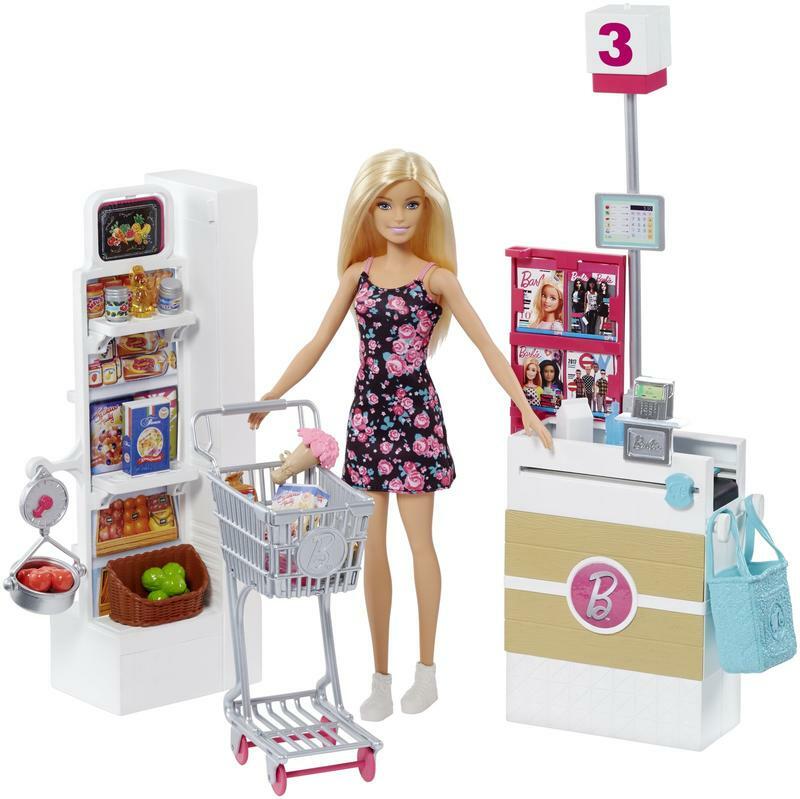 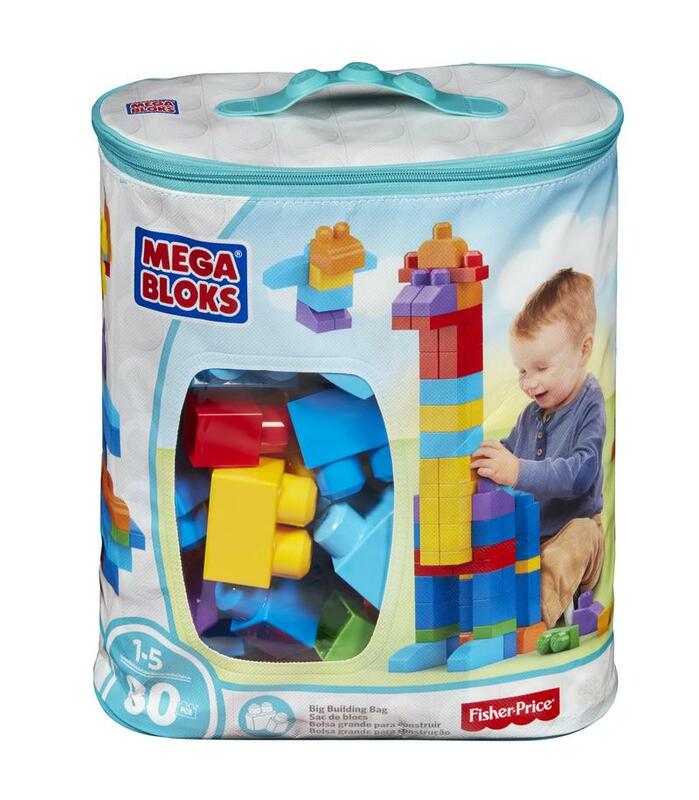 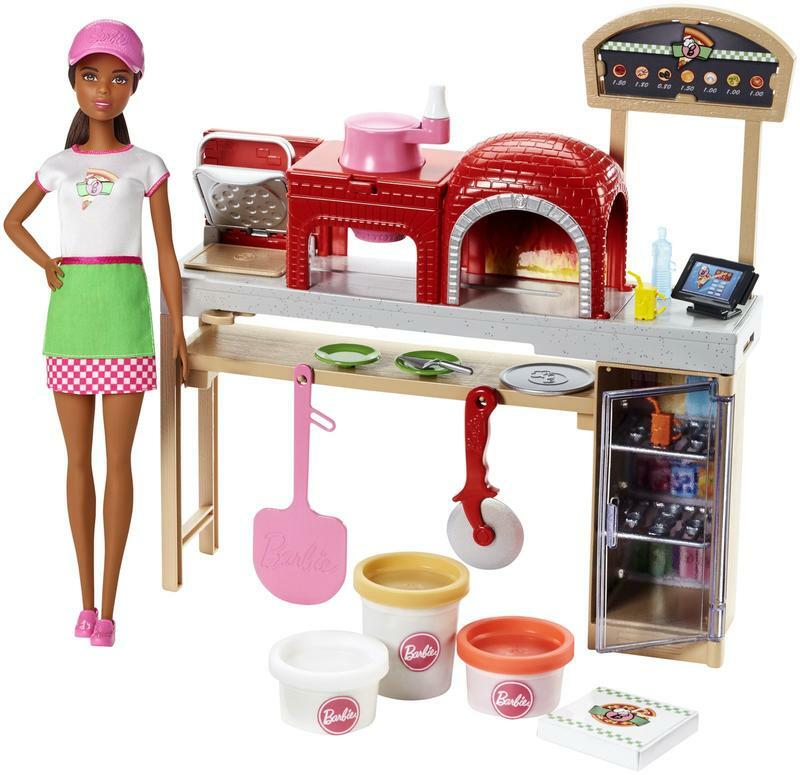 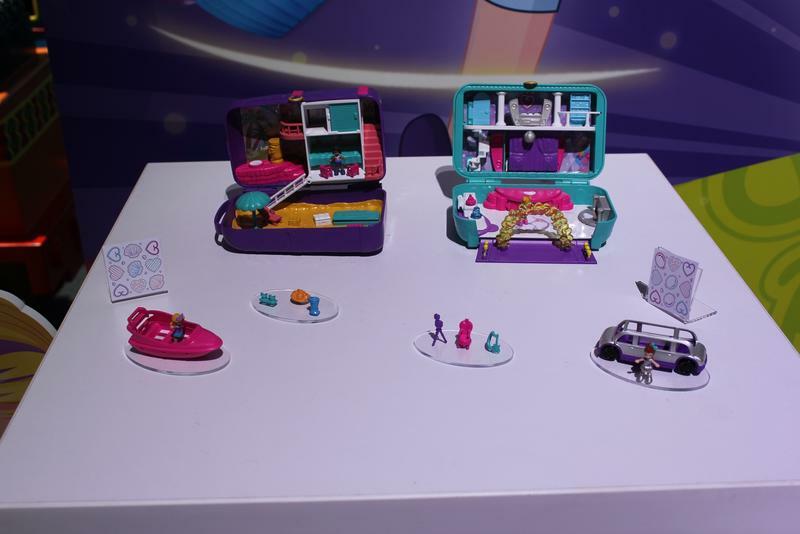 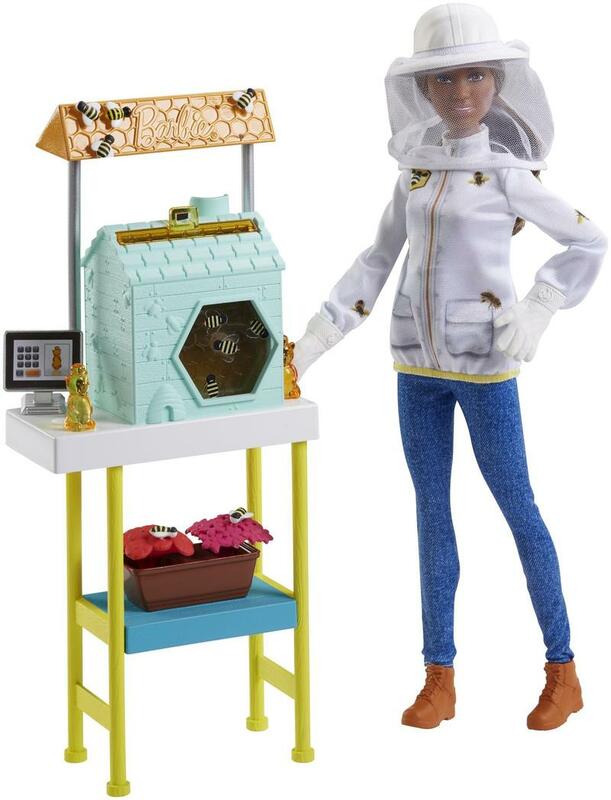 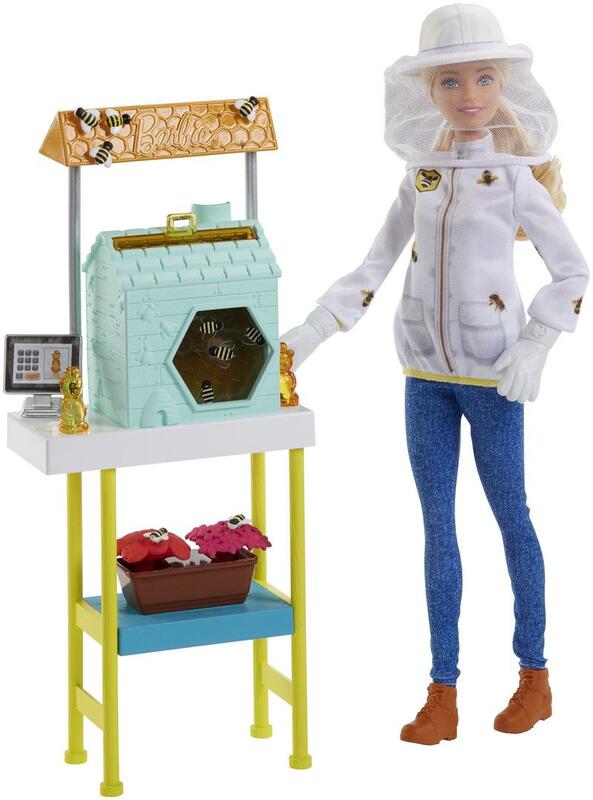 Rounding out the showroom we have the return of Polly Pocket, the usual updates to the Barbie line and of course new sets for Mega Blocks. 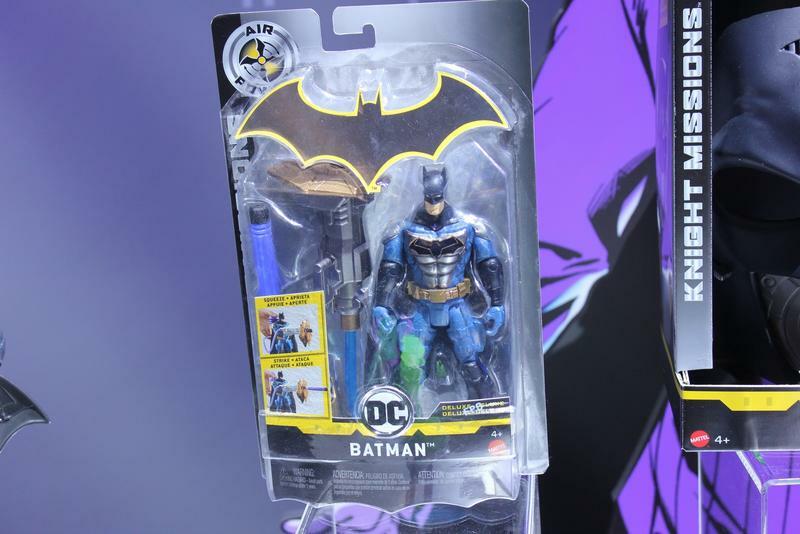 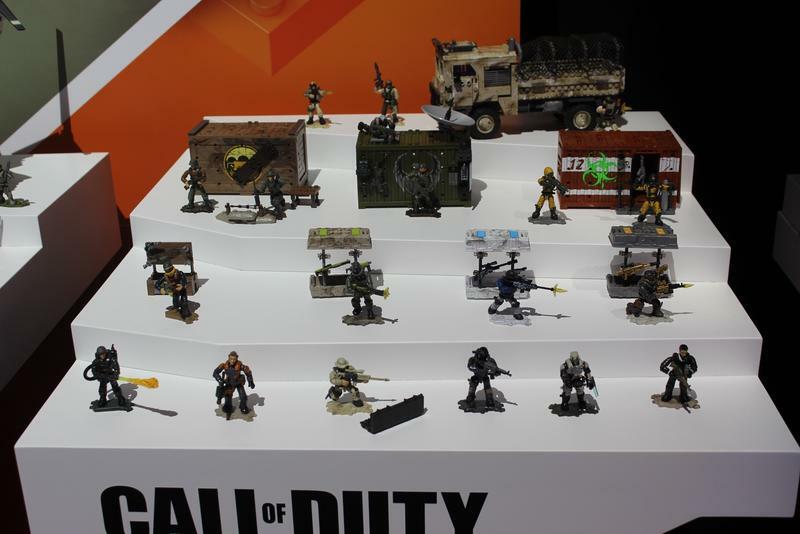 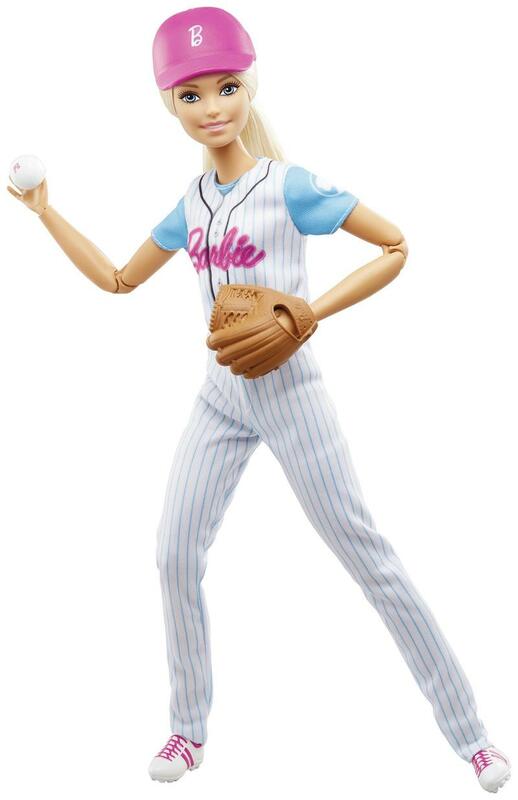 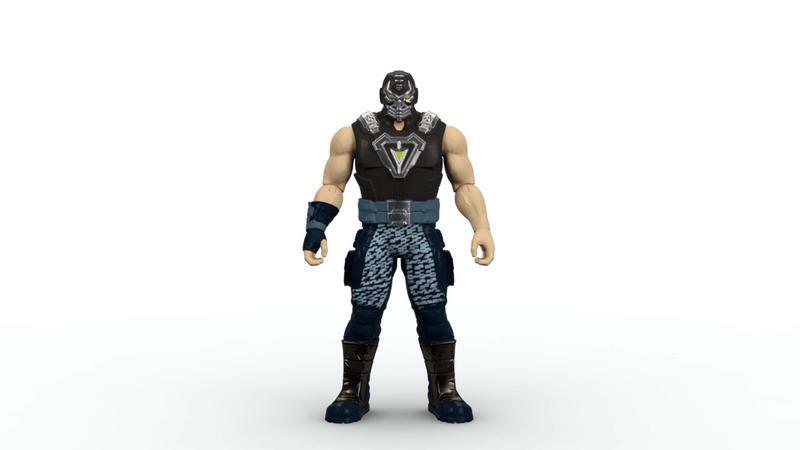 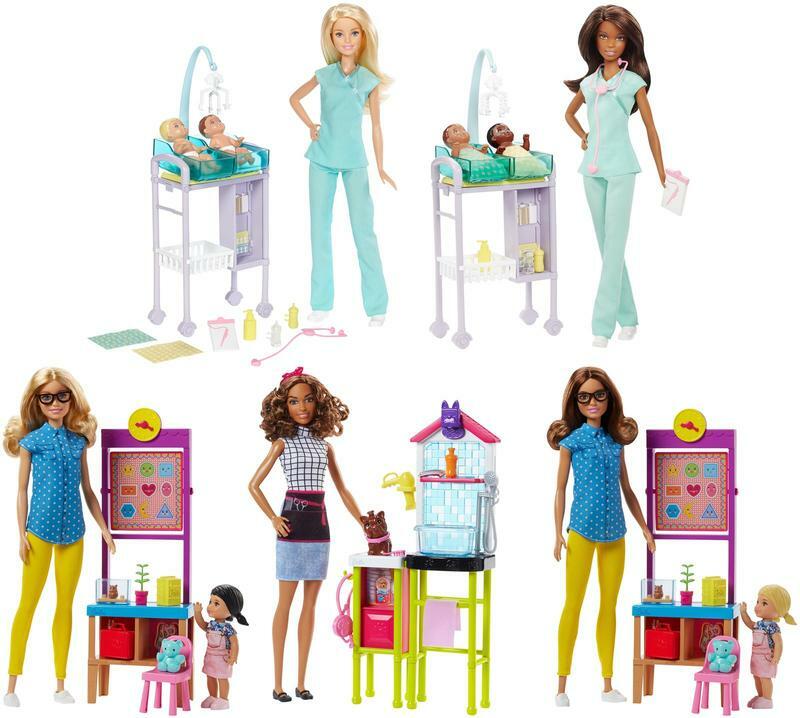 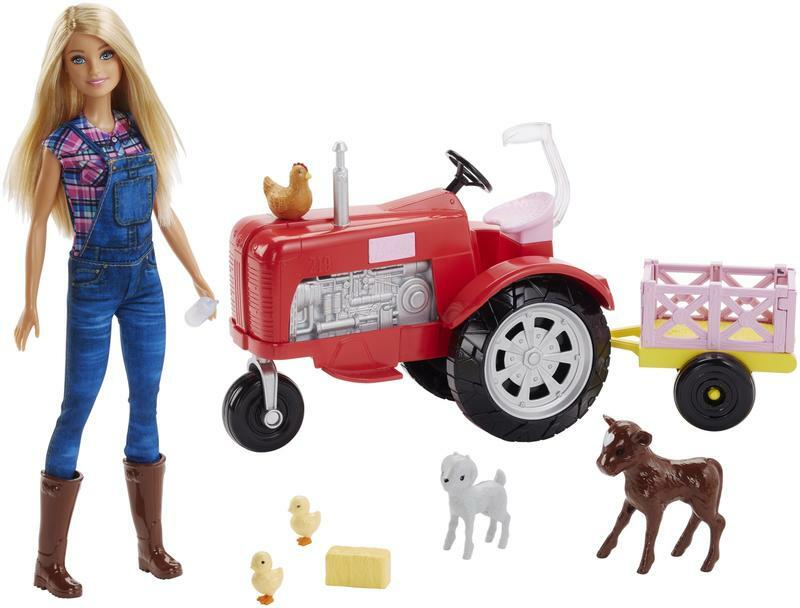 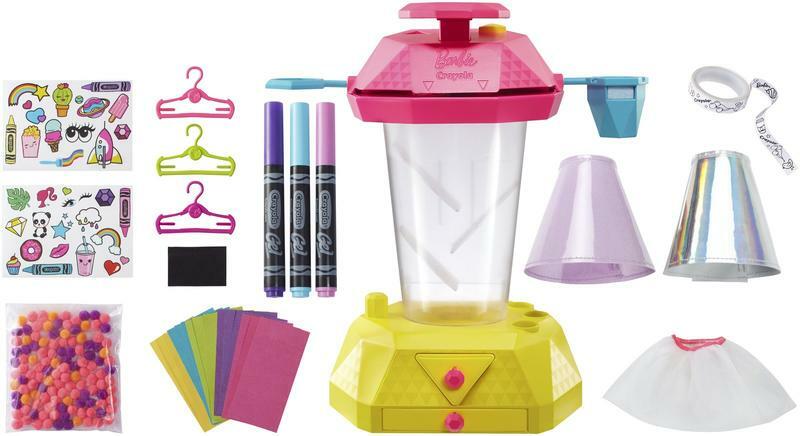 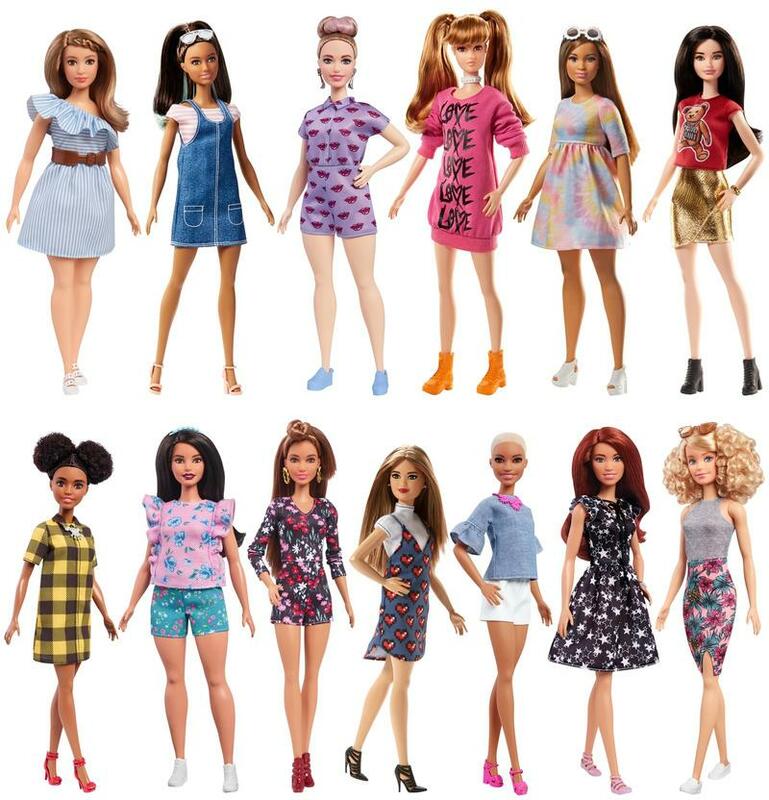 Overall it may not be Mattel’s biggest year, but there are still some awesome items coming throughout 2018.